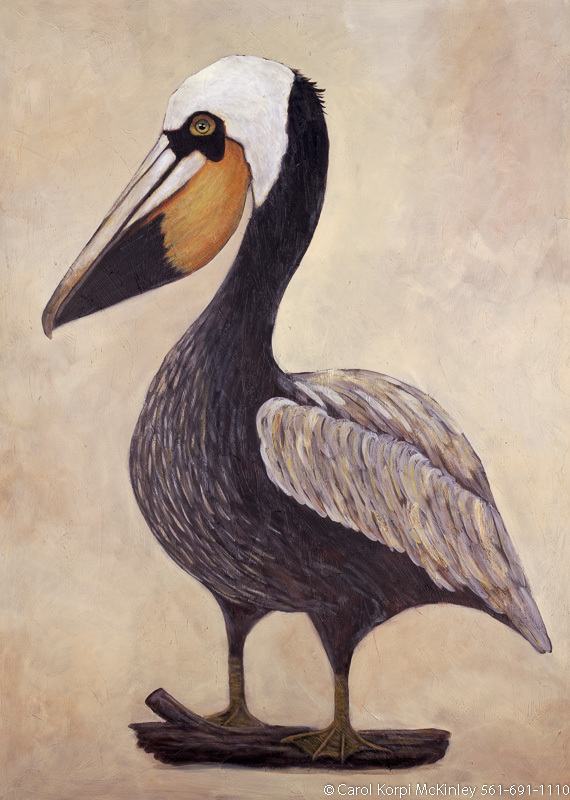 Pelican #AAX-061, Original Acrylic on Canvas: 44 x 68 inches $10500; Stretched and Gallery Wrapped Limited Edition Archival Print on Canvas: 40 x 60 inches $1590. Custom sizes, colors, and commissions are also available. For more information or to order, please visit our ABOUT page or call us at 561-691-1110. 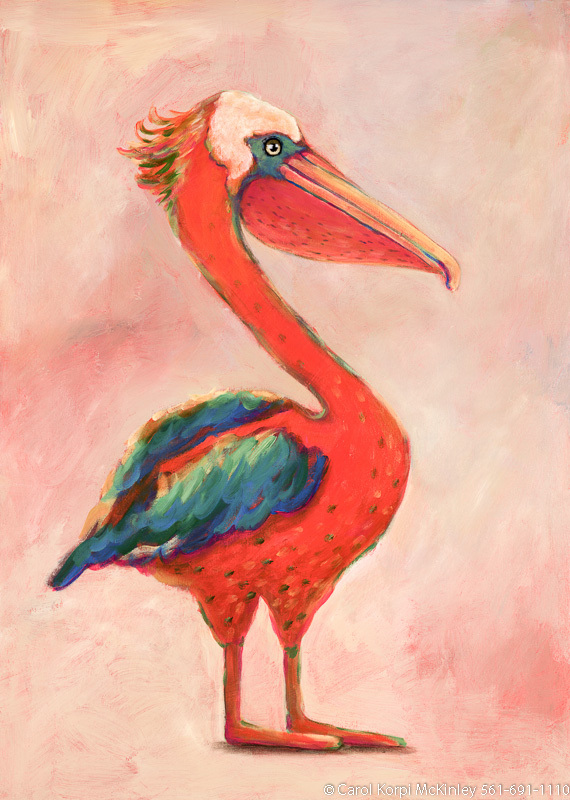 Pelican #AAX-060, Original Acrylic on Canvas: 36 x 68 inches $10200; Stretched and Gallery Wrapped Limited Edition Archival Print on Canvas: 36 x 68 inches $1620. 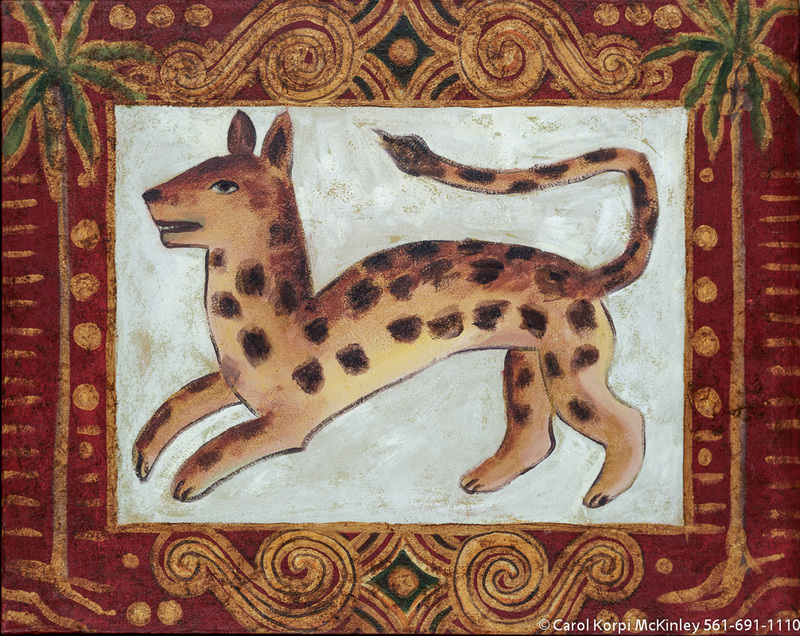 Custom sizes, colors, and commissions are also available. For more information or to order, please visit our ABOUT page or call us at 561-691-1110. 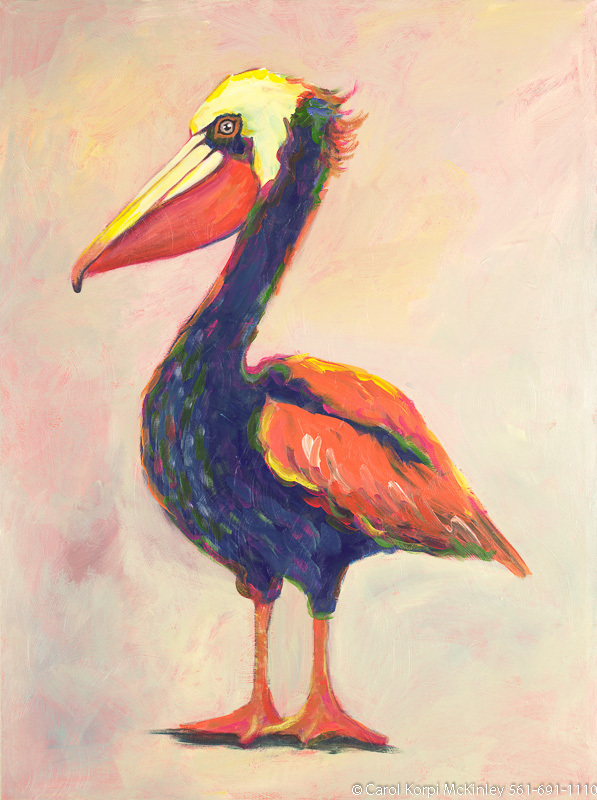 Pelican #AAX-058, Original Acrylic on Canvas: 48 x 68 inches $11700; Stretched and Gallery Wrapped Limited Edition Archival Print on Canvas: 40 x 56 inches $1590. Custom sizes, colors, and commissions are also available. For more information or to order, please visit our ABOUT page or call us at 561-691-1110. 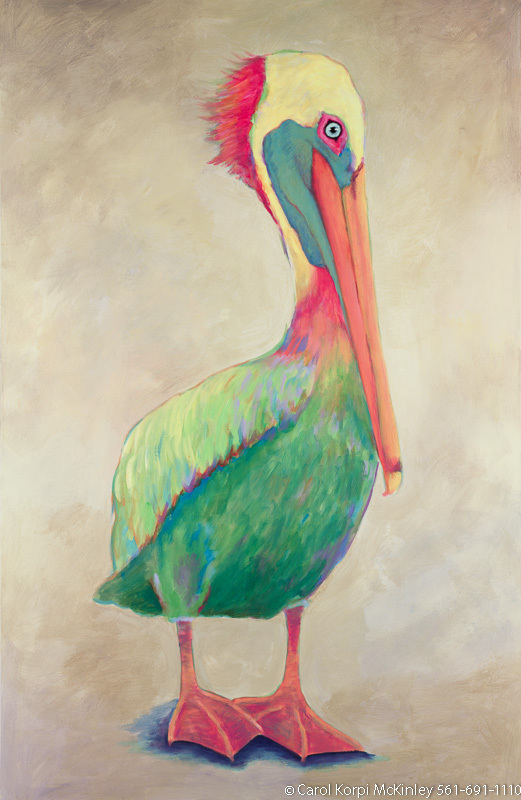 Pelican #AAX-063, Original Acrylic on Canvas: 44 x 68 inches $10500; Stretched and Gallery Wrapped Limited Edition Archival Print on Canvas: 40 x 60 inches $1590. Custom sizes, colors, and commissions are also available. For more information or to order, please visit our ABOUT page or call us at 561-691-1110. 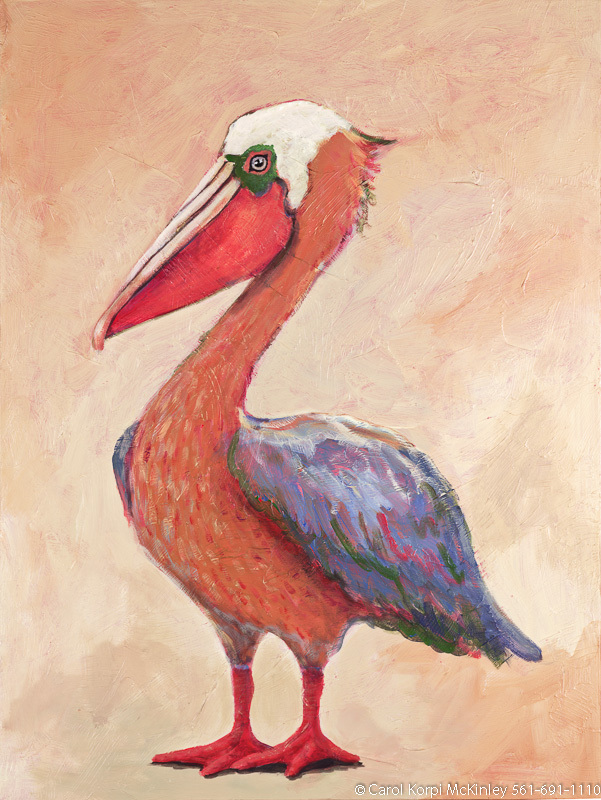 Pelican #AAX-065, Original Acrylic on Canvas: 44 x 68 inches $10500; Stretched and Gallery Wrapped Limited Edition Archival Print on Canvas: 40 x 60 inches $1590. Custom sizes, colors, and commissions are also available. For more information or to order, please visit our ABOUT page or call us at 561-691-1110. 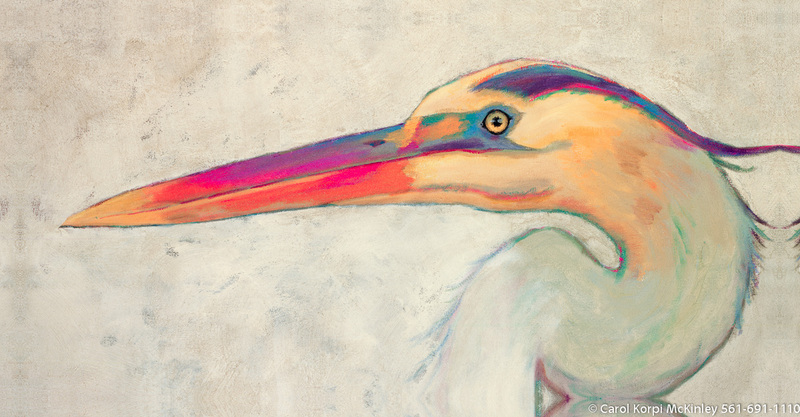 Heron #AAX-006, Original Acrylic on Canvas: 48 x 68 inches $11700; Stretched and Gallery Wrapped Limited Edition Archival Print on Canvas: 40 x 56 inches $1590. Custom sizes, colors, and commissions are also available. For more information or to order, please visit our ABOUT page or call us at 561-691-1110. 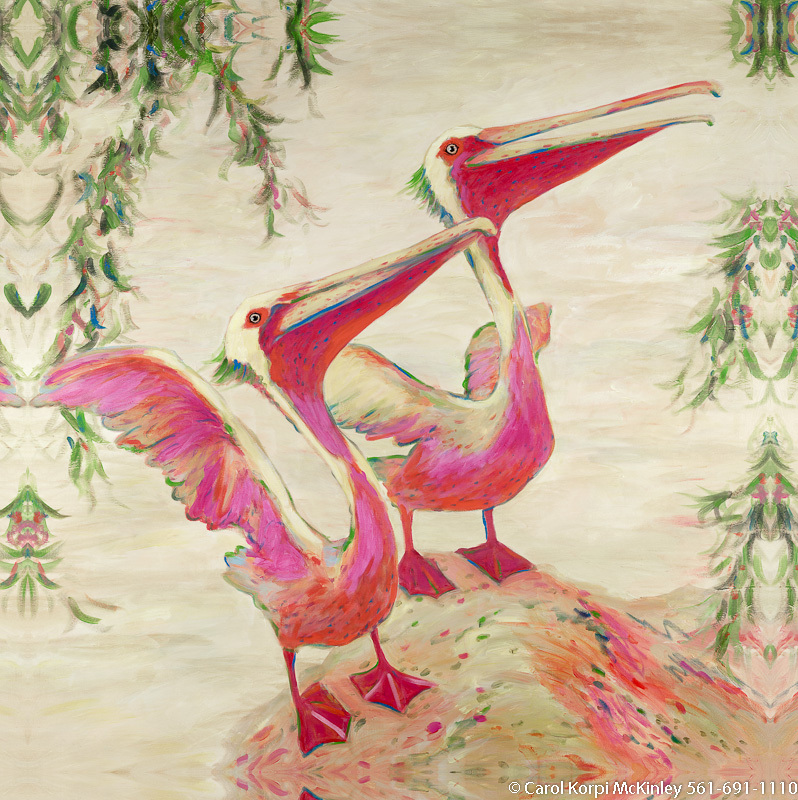 Two Pelicans #AAX-059, Original Acrylic on Canvas: 48 x 68 inches $11700; Stretched and Gallery Wrapped Limited Edition Archival Print on Canvas: 40 x 56 inches $1590. Custom sizes, colors, and commissions are also available. For more information or to order, please visit our ABOUT page or call us at 561-691-1110. 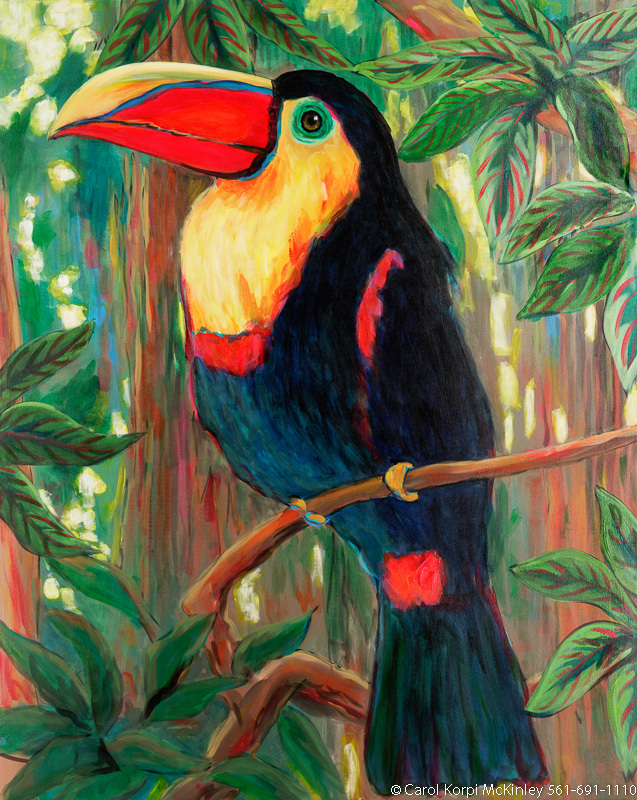 Toucan #AAX-062, Original Acrylic on Canvas: 44 x 68 inches $10500; Stretched and Gallery Wrapped Limited Edition Archival Print on Canvas: 40 x 60 inches $1590. Custom sizes, colors, and commissions are also available. For more information or to order, please visit our ABOUT page or call us at 561-691-1110. 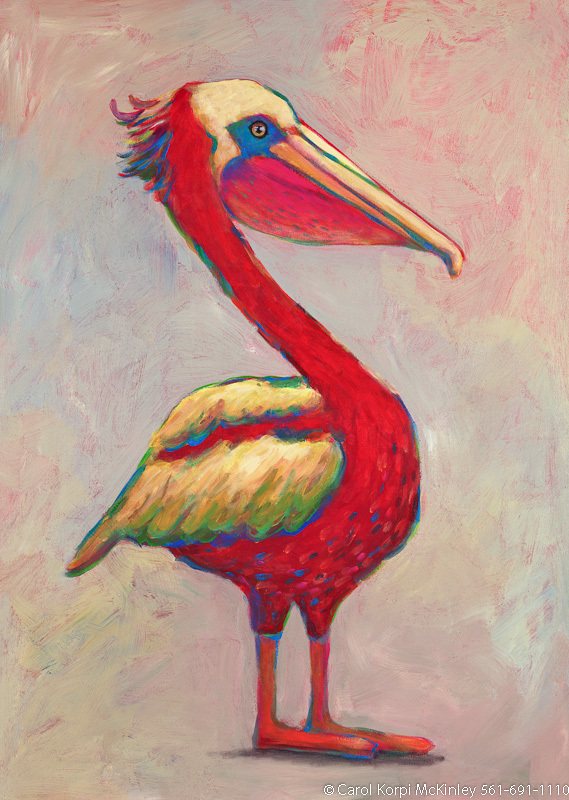 Pelican #AAX-066, Original Acrylic on Canvas: 48 x 68 inches $11700; Stretched and Gallery Wrapped Limited Edition Archival Print on Canvas: 40 x 56 inches $1590. Custom sizes, colors, and commissions are also available. For more information or to order, please visit our ABOUT page or call us at 561-691-1110. 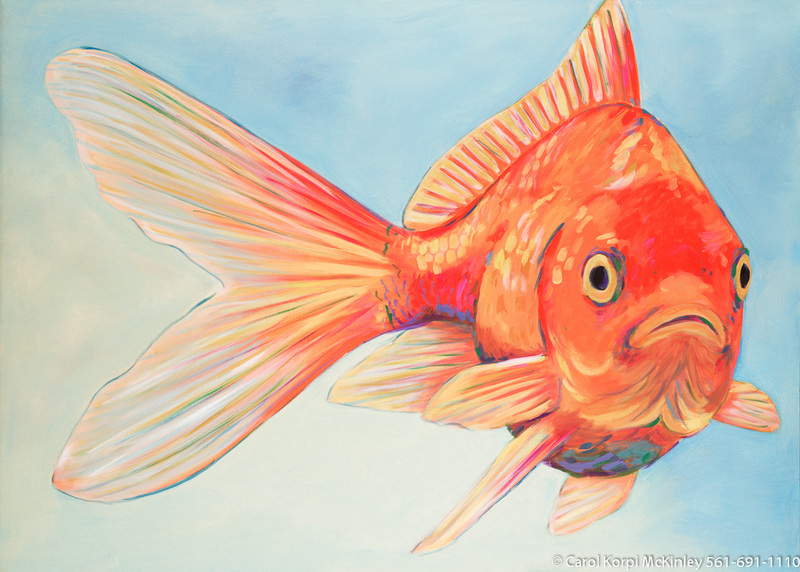 Goldfish #AAX-064, Original Acrylic on Canvas: 44” x 68” $10500; Stretched and Gallery Wrapped Limited Edition Archival Print on Canvas: 40” x 60” $1590. Custom sizes, colors, and commissions are also available. For more information or to order, please visit our “About” page or call us at 561-691-1110. 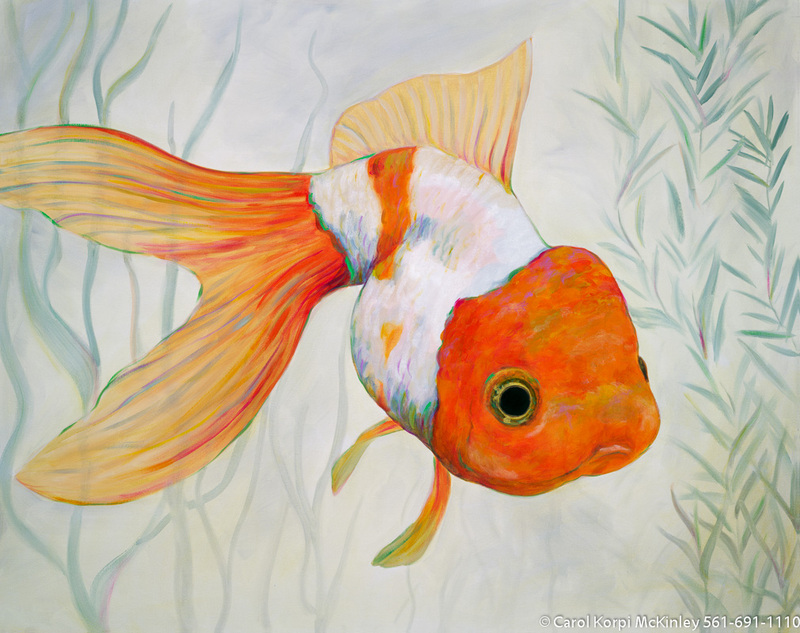 Goldfish #ANF-026, Original Acrylic on Canvas: 48 x 68 inches $10800; Stretched and Gallery Wrapped Limited Edition Archival Print on Canvas: 40 x 56 inches $1590. Custom sizes, colors, and commissions are also available. For more information or to order, please visit our ABOUT page or call us at 561-691-1110. 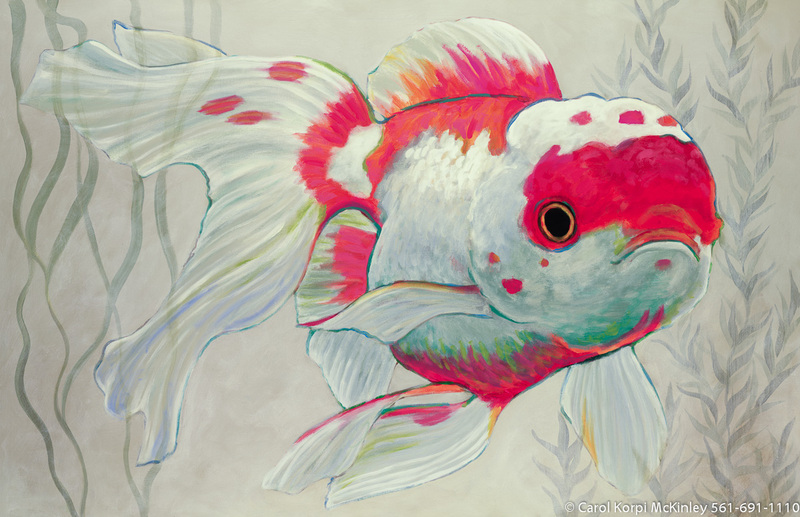 Goldfish #ANF-054, Original Acrylic on Canvas: 48 x 60 inches $10200; Stretched and Gallery Wrapped Limited Edition Archival Print on Canvas: 40 x 50 inches $1560. Custom sizes, colors, and commissions are also available. For more information or to order, please visit our ABOUT page or call us at 561-691-1110. 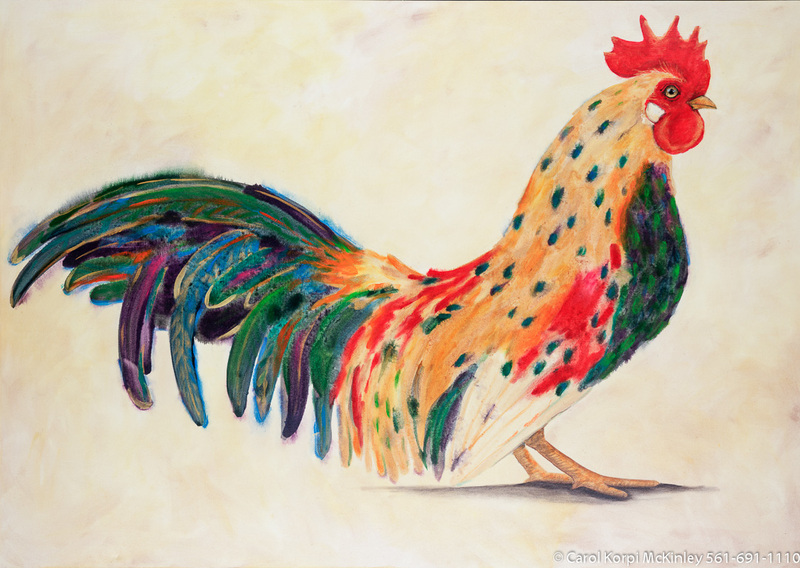 Blue Parrot #MSC-044, Original Acrylic on Canvas: 18 x 68 inches, Sold; Stretched and Gallery Wrapped Limited Edition Archival Print on Canvas: 18 x 68 inches $1530-. 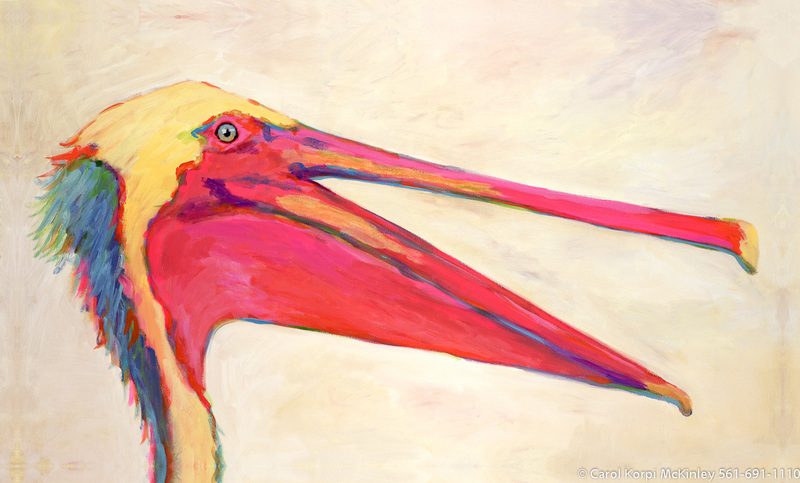 Red Parrot #MSC-045, Original Acrylic on Canvas: 18 x 68 inches, Sold; Stretched and Gallery Wrapped Limited Edition Archival Print on Canvas: 18 x 68 inches $1530-. 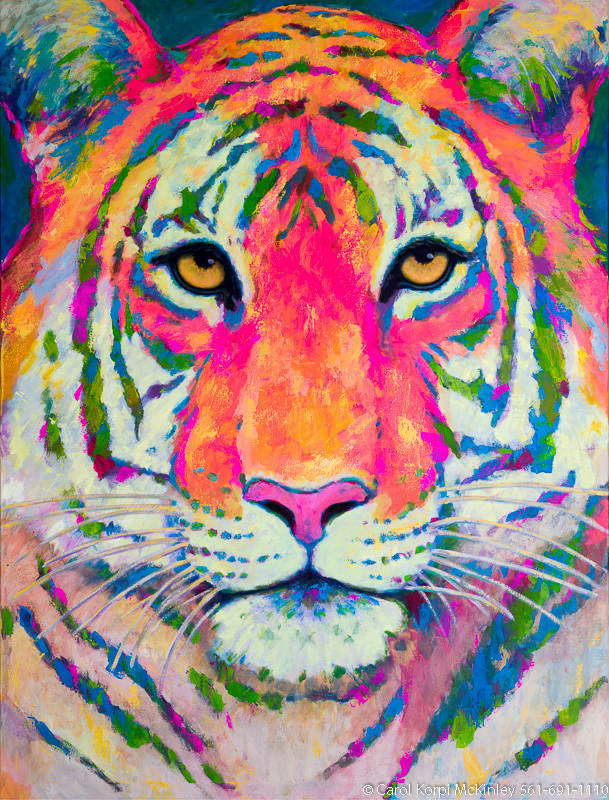 Tiger #ANF-046, Original Acrylic on Canvas: 48 x 60 inches, Sold; Stretched and Gallery Wrapped Limited Edition Archival Print on Canvas: 40 x 50 inches $1560-. Custom sizes, colors, and commissions are also available. For more information or to order, please visit our ABOUT page or call us at 561-691-1110. Tiger #ANF-041, Original Acrylic on Canvas: 48 x 48 inches $9900; Stretched and Gallery Wrapped Limited Edition Archival Print on Canvas: 40 x 40 inches $1500. Custom sizes, colors, and commissions are also available. For more information or to order, please visit our ABOUT page or call us at 561-691-1110. 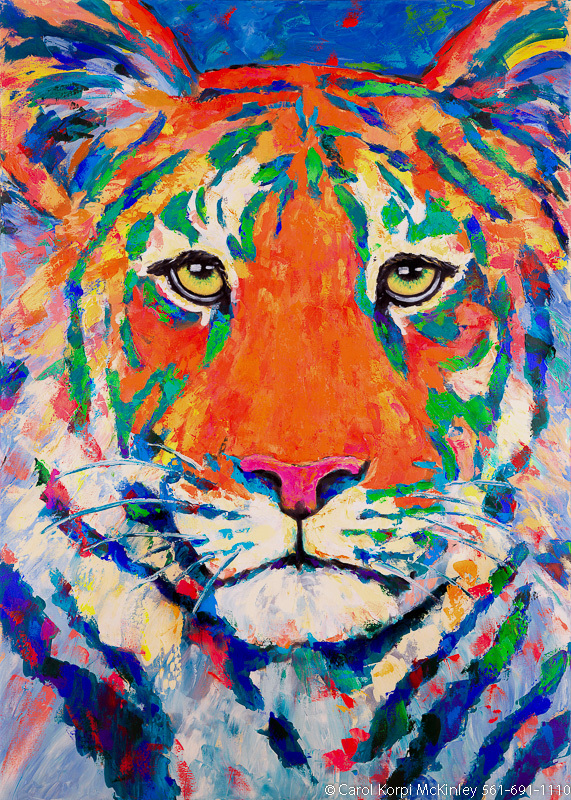 Tiger #ANF-036, Original Acrylic on Canvas: 48 x 68 inches $11700; Stretched and Gallery Wrapped Limited Edition Archival Print on Canvas: 40 x 56 inches $1590. Custom sizes, colors, and commissions are also available. For more information or to order, please visit our ABOUT page or call us at 561-691-1110. 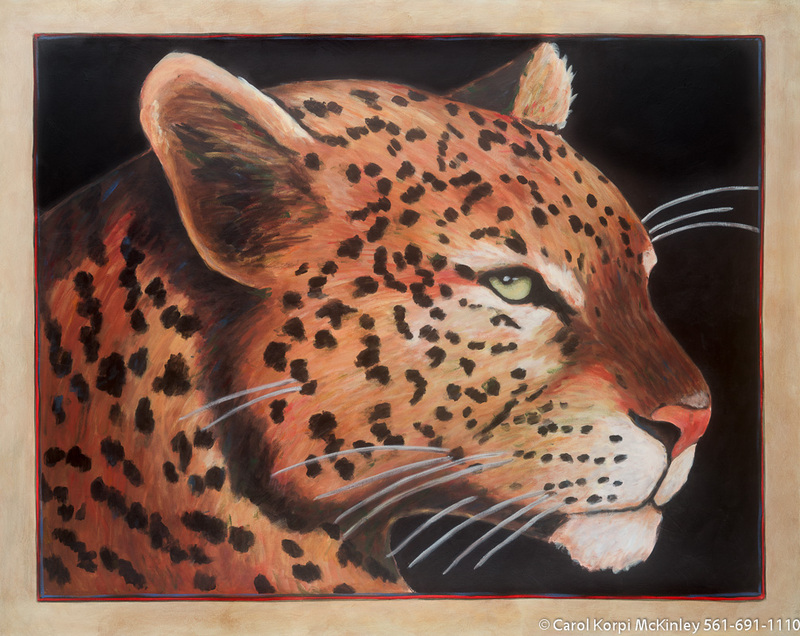 Leopard #ANF-035, Original Acrylic on Canvas: 48 x 68 inches $11700; Stretched and Gallery Wrapped Limited Edition Archival Print on Canvas: 40 x 56 inches $1590. 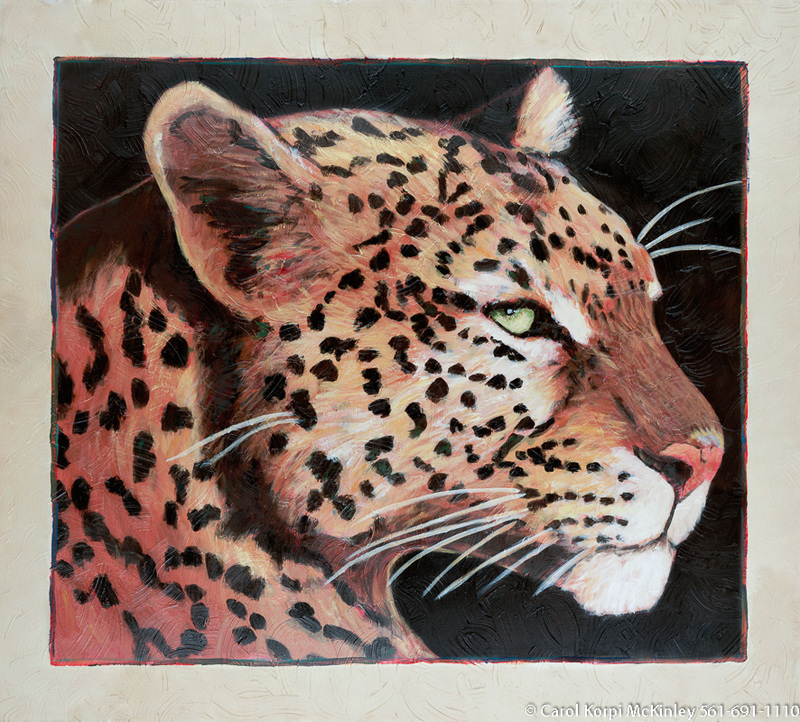 Custom sizes, colors, and commissions are also available. For more information or to order, please visit our ABOUT page or call us at 561-691-1110. 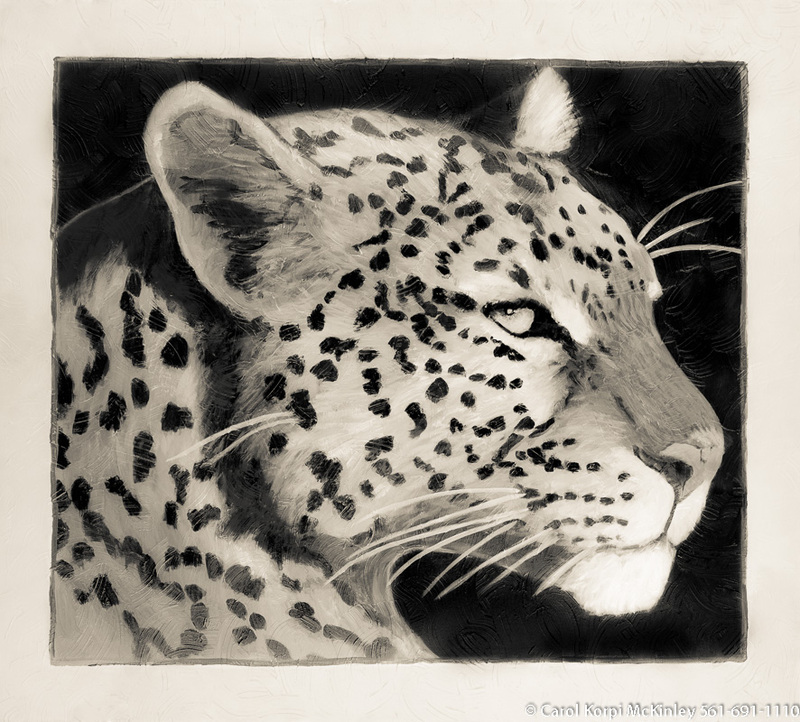 Leopard #ANF-037, Original Acrylic on Canvas: 48 x 68 inches $11700; Stretched and Gallery Wrapped Limited Edition Archival Print on Canvas: 40 x 56 inches $1590. Custom sizes, colors, and commissions are also available. For more information or to order, please visit our ABOUT page or call us at 561-691-1110. 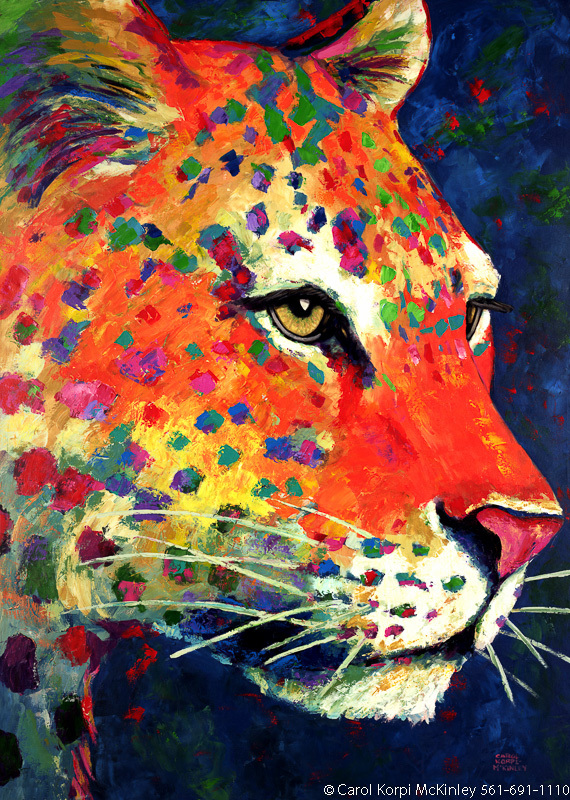 Leopard #ANF-053, Original Acrylic on Canvas: 48 x 68 inches $11700; Stretched and Gallery Wrapped Limited Edition Archival Print on Canvas: 40 x 56 inches $1590. Custom sizes, colors, and commissions are also available. For more information or to order, please visit our ABOUT page or call us at 561-691-1110. 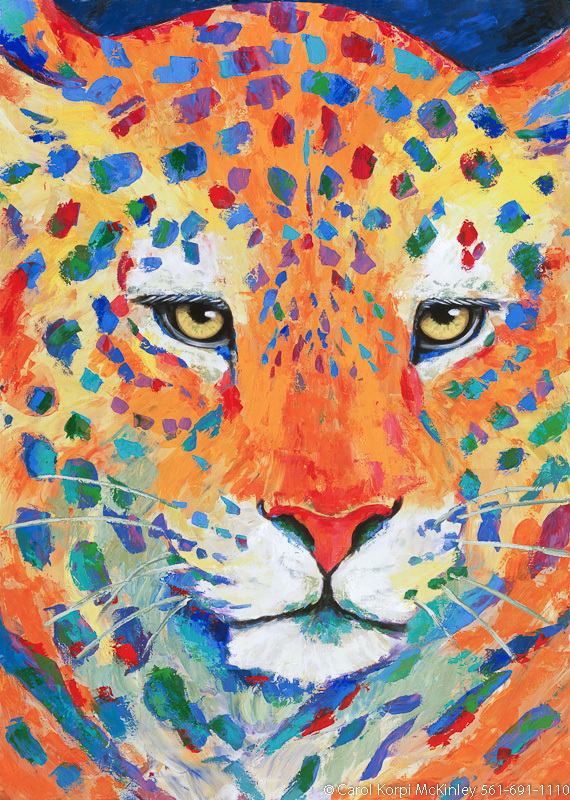 Leopard #ANF-050, Original Acrylic on Canvas: 48 x 68 inches $11700; Stretched and Gallery Wrapped Limited Edition Archival Print on Canvas: 40 x 56 inches $1590. Custom sizes, colors, and commissions are also available. For more information or to order, please visit our ABOUT page or call us at 561-691-1110. 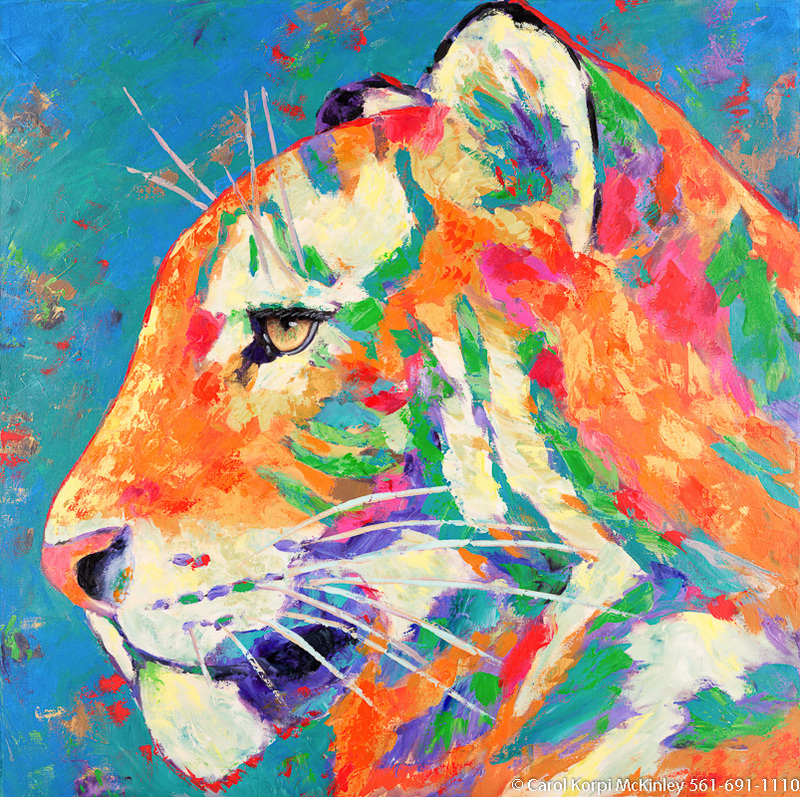 Tiger #ANF-071, Original Acrylic on Canvas: 52 x 68 inches $11700; Stretched and Gallery Wrapped Limited Edition Archival Print on Canvas: 40 x 56 inches $1590. Custom sizes, colors, and commissions are also available. For more information or to order, please visit our ABOUT page or call us at 561-691-1110. 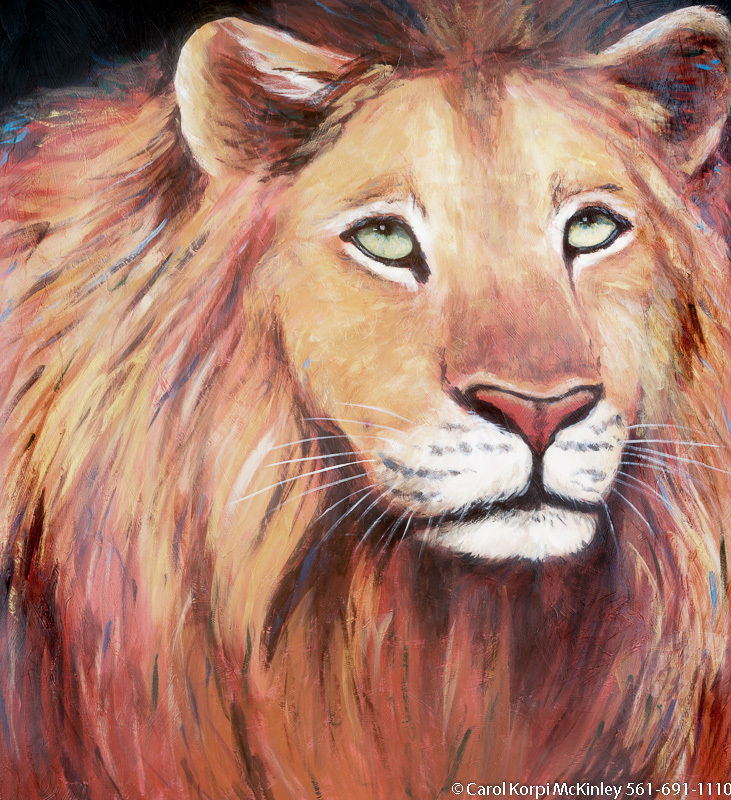 Lion #ANF-008, Original Acrylic on Canvas: 48 x 60 inches, Sold; Stretched and Gallery Wrapped Limited Edition Archival Print on Canvas: 40 x 50 inches $1560-. Custom sizes, colors, and commissions are also available. For more information or to order, please visit our ABOUT page or call us at 561-691-1110. 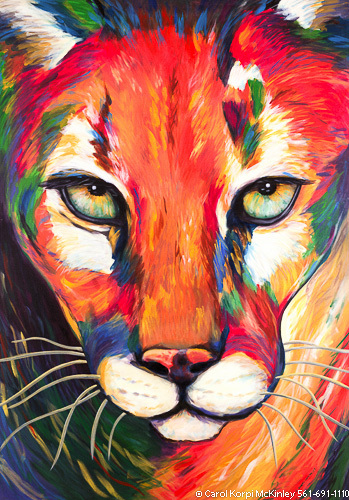 Panther #ANF-002, Original Acrylic on Canvas: 48 x 68 inches $11700; Stretched and Gallery Wrapped Limited Edition Archival Print on Canvas: 40 x 56 inches $1590. Custom sizes, colors, and commissions are also available. For more information or to order, please visit our ABOUT page or call us at 561-691-1110. 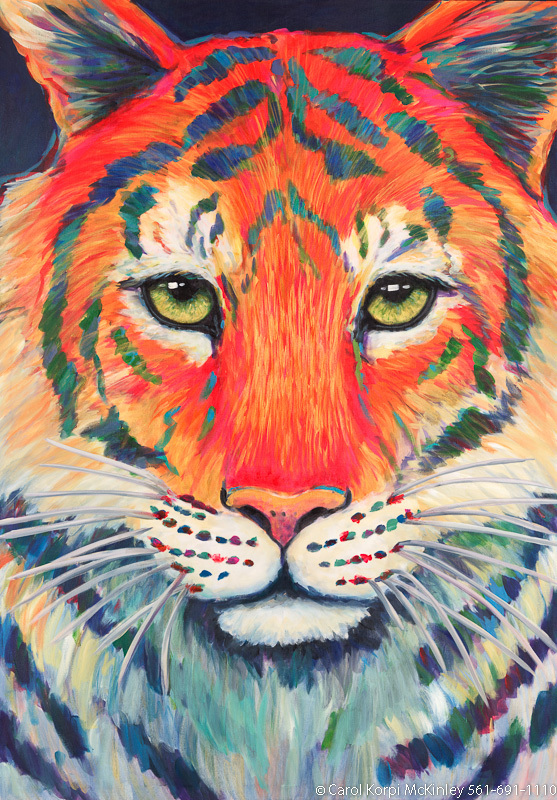 Tiger #ANF-044, Original Acrylic on Canvas: 48 x 68 inches $11700; Stretched and Gallery Wrapped Limited Edition Archival Print on Canvas: 40 x 56 inches $1590. Custom sizes, colors, and commissions are also available. For more information or to order, please visit our ABOUT page or call us at 561-691-1110. 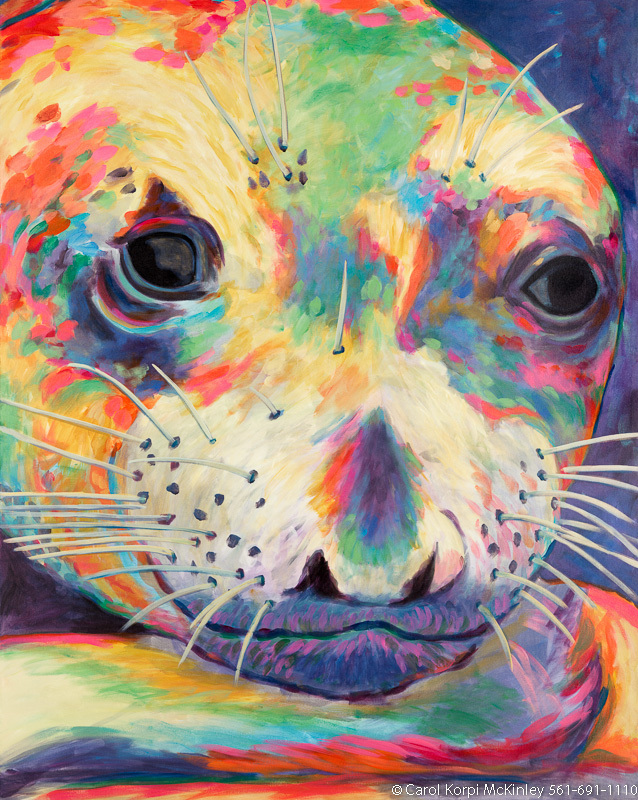 Seal #ANF-021, Original Acrylic on Canvas: 48 x 60 inches $10800; Stretched and Gallery Wrapped Limited Edition Archival Print on Canvas: 40 x 50 inches $1560. Custom sizes, colors, and commissions are also available. For more information or to order, please visit our ABOUT page or call us at 561-691-1110. 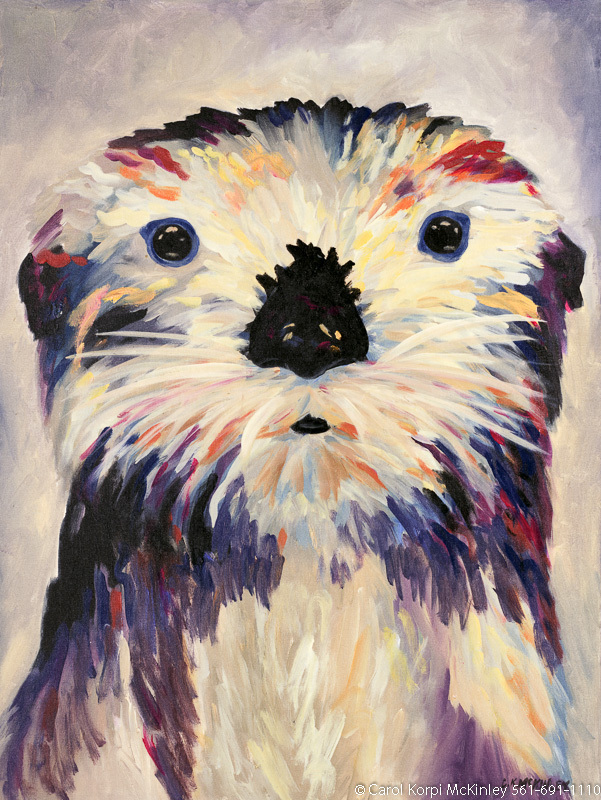 Otter #ANF-051, Original Acrylic on Canvas: 30 x 40 inches $4200; Stretched and Gallery Wrapped Limited Edition Archival Print on Canvas: 40 x 56 inches $1590. Custom sizes, colors, and commissions are also available. For more information or to order, please visit our ABOUT page or call us at 561-691-1110. 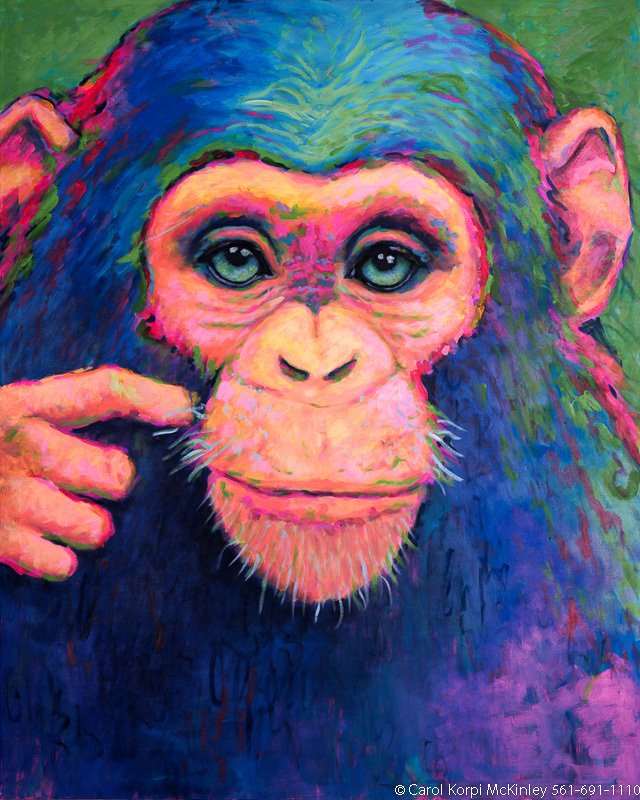 Chimp #ANF-073, Original Acrylic on Canvas: 48 x 60 inches $10200; Stretched and Gallery Wrapped Limited Edition Archival Print on Canvas: 40 x 50 inches $1560. Custom sizes, colors, and commissions are also available. For more information or to order, please visit our ABOUT page or call us at 561-691-1110. 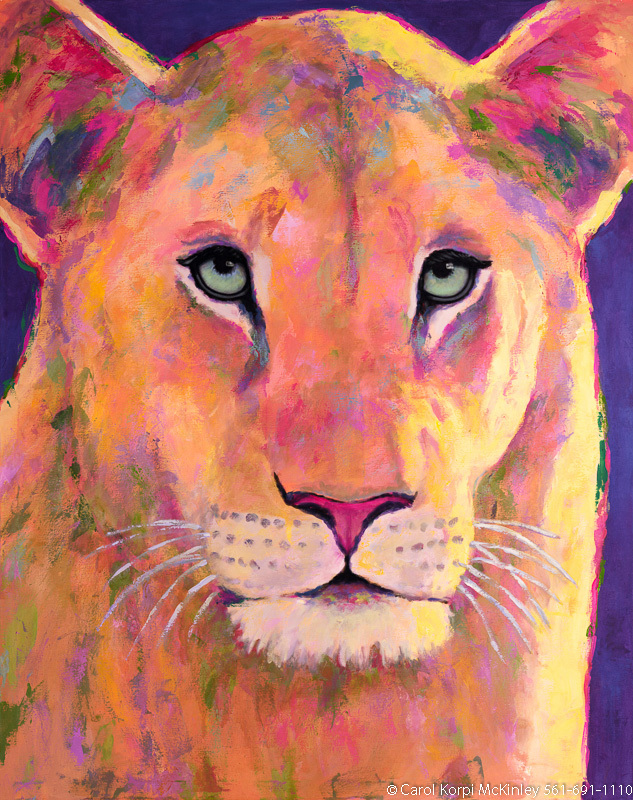 Lioness #ANF-072, Original Acrylic on Canvas: 48 x 60 inches $10200; Stretched and Gallery Wrapped Limited Edition Archival Print on Canvas: 40 x 50 inches $1560. Custom sizes, colors, and commissions are also available. For more information or to order, please visit our ABOUT page or call us at 561-691-1110. 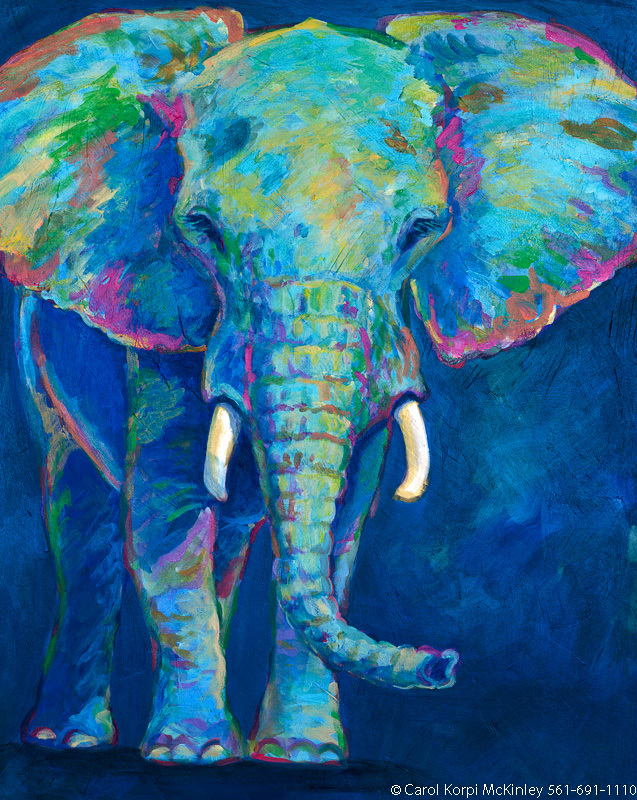 Blue Elephant #ANF-067, Original Acrylic on Canvas: 36 x 48 inches $4200; Stretched and Gallery Wrapped Limited Edition Archival Print on Canvas: 40 x 56 inches $1590. Custom sizes, colors, and commissions are also available. For more information or to order, please visit our ABOUT page or call us at 561-691-1110. 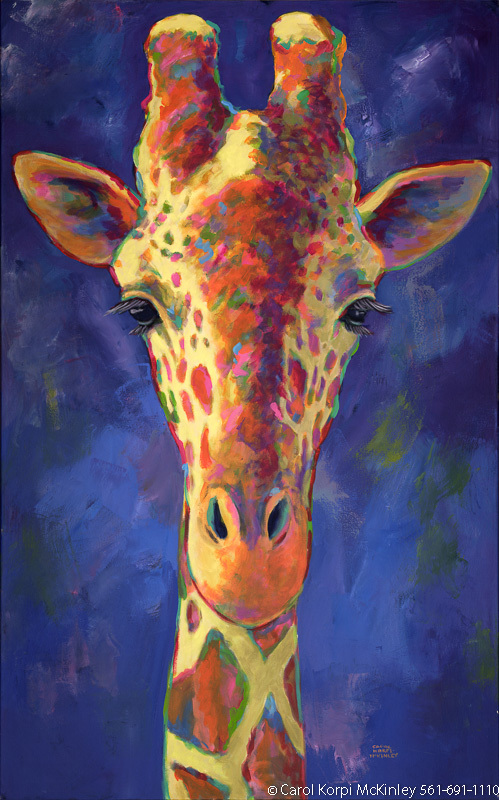 Giraffe #ANF-070, Original Acrylic on Canvas: 42 x 68 inches $7200; Stretched and Gallery Wrapped Limited Edition Archival Print on Canvas: 36 x 60 inches $1590. Custom sizes, colors, and commissions are also available. For more information or to order, please visit our ABOUT page or call us at 561-691-1110. 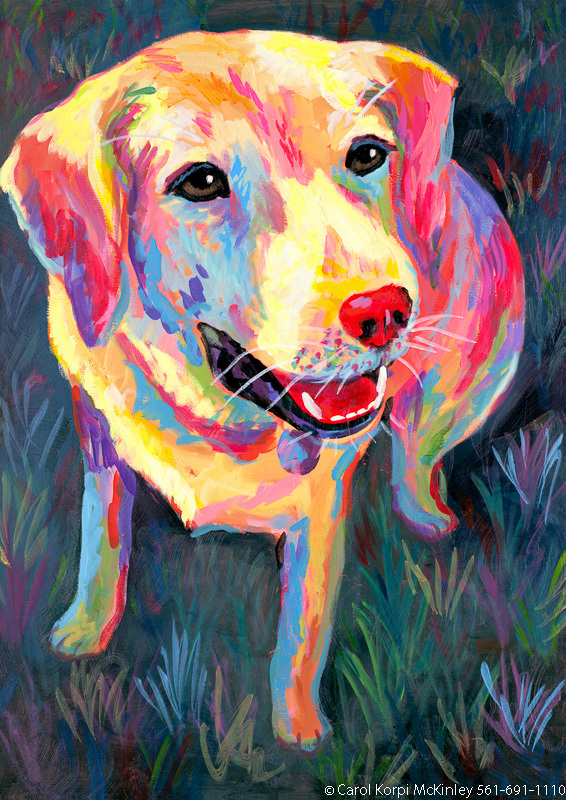 Yellow Dog #ANF-049, Original Acrylic on Canvas: 30” x 40” $4200; Stretched and Gallery Wrapped Limited Edition Archival Print on Canvas: 40” x 56” $1590. Custom sizes, colors, and commissions are also available. 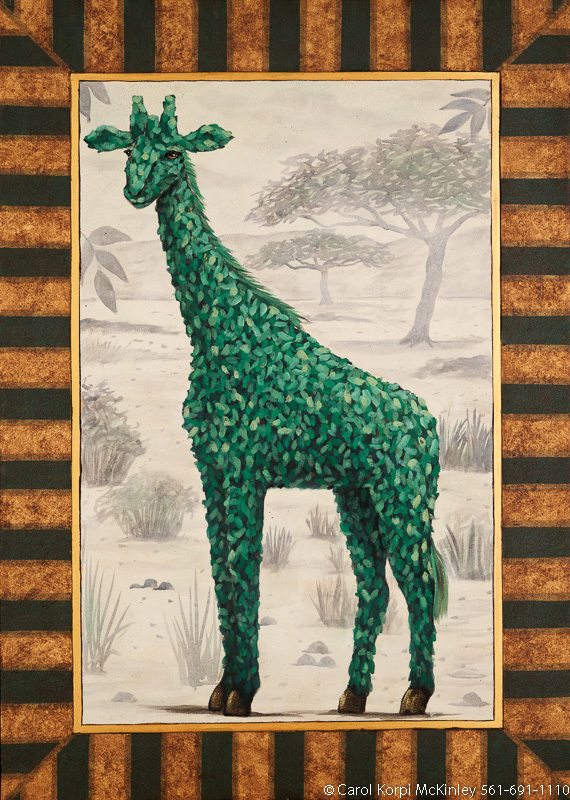 For more information or to order, please visit our “About” page or call us at 561-691-1110. 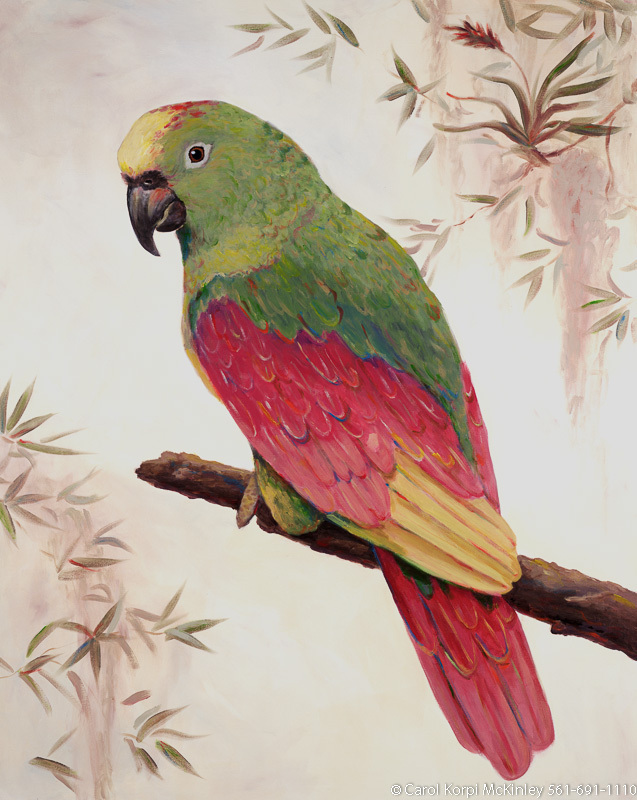 Parrot #ANF-006, Original Acrylic on Canvas: 48 x 60 inches $10800; Stretched and Gallery Wrapped Limited Edition Archival Print on Canvas: 40 x 50 inches $1560. Custom sizes, colors, and commissions are also available. For more information or to order, please visit our ABOUT page or call us at 561-691-1110. 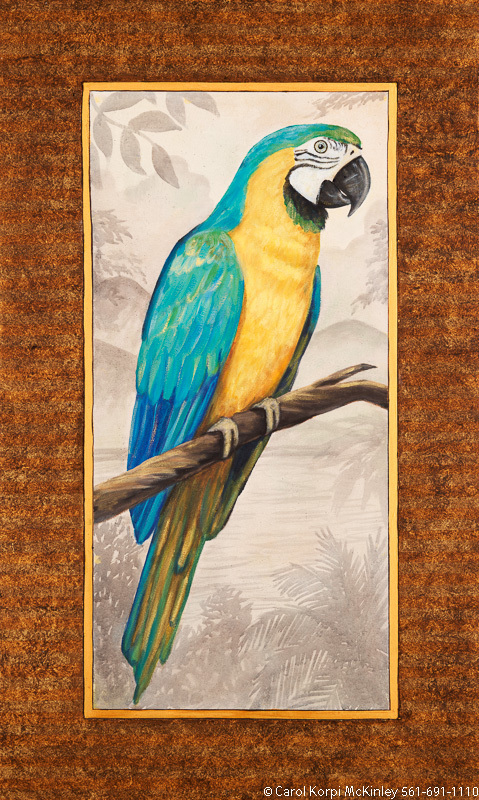 Parrot #ANF-005, Original Acrylic on Canvas: 48 x 60 inches $10800; Stretched and Gallery Wrapped Limited Edition Archival Print on Canvas: 40 x 50 inches $1560. Custom sizes, colors, and commissions are also available. For more information or to order, please visit our ABOUT page or call us at 561-691-1110. 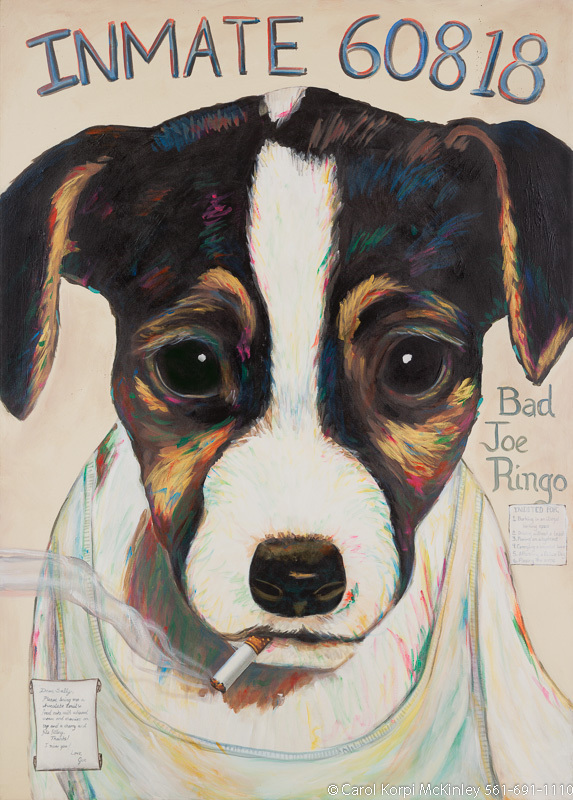 Bad Joe Ringo #VAG-004, Original Acrylic on Canvas: 48 x 68 inches $11700; Stretched and Gallery Wrapped Limited Edition Archival Print on Canvas: 40 x 56 inches $1590. Custom sizes, colors, and commissions are also available. For more information or to order, please visit our ABOUT page or call us at 561-691-1110. 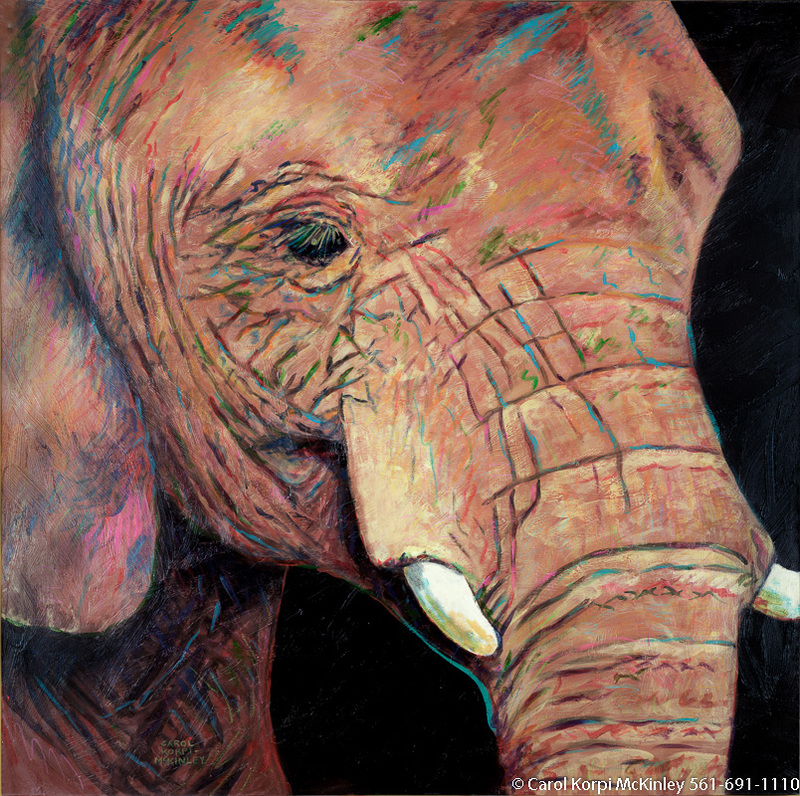 Babe #VAG-002, Original Acrylic on Canvas: 48 x 68 inches $11700; Stretched and Gallery Wrapped Limited Edition Archival Print on Canvas: 40 x 56 inches $1590. Custom sizes, colors, and commissions are also available. For more information or to order, please visit our ABOUT page or call us at 561-691-1110. 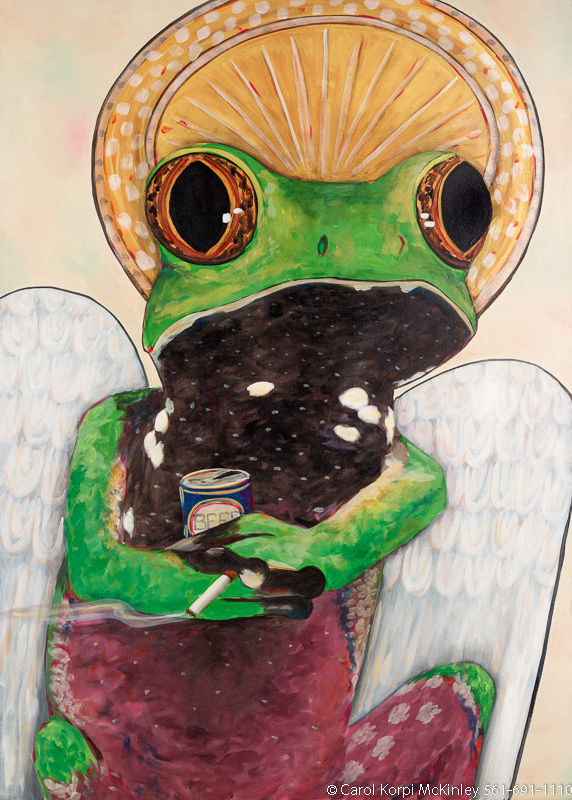 Sir Frog of Sainthood #VAG-010, Original Acrylic on Canvas: 48 x 68 inches $11700; Stretched and Gallery Wrapped Limited Edition Archival Print on Canvas: 40 x 56 inches $1590. Custom sizes, colors, and commissions are also available. For more information or to order, please visit our ABOUT page or call us at 561-691-1110. 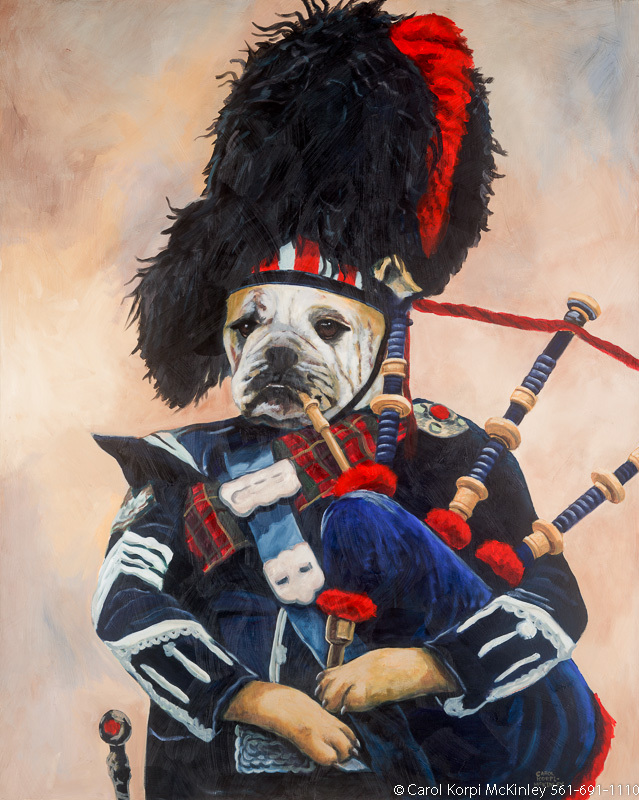 Scottish Bulldog #VAG-014, Original Acrylic on Canvas: 48 x 68 inches $11700; Stretched and Gallery Wrapped Limited Edition Archival Print on Canvas: 40 x 56 inches $1590. Custom sizes, colors, and commissions are also available. For more information or to order, please visit our ABOUT page or call us at 561-691-1110. 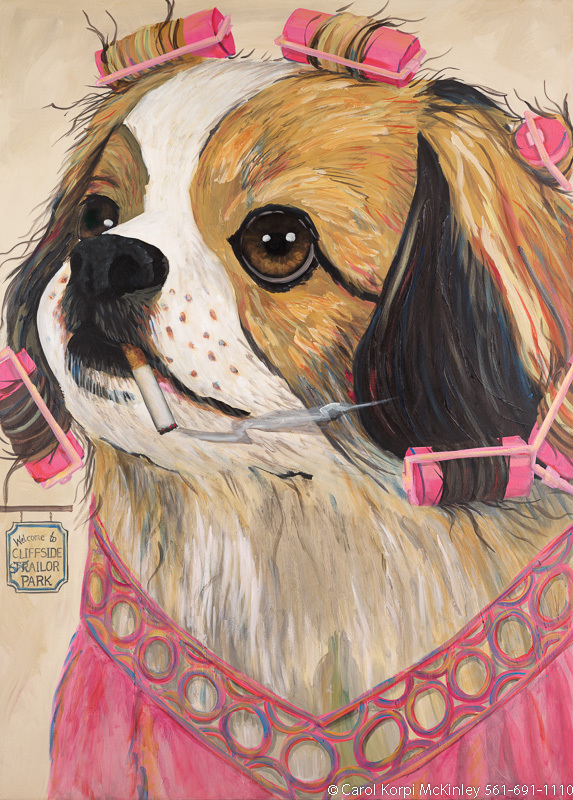 Inmate Tina #VAG-005, Original Acrylic on Canvas: 48 x 60 inches $11700; Stretched and Gallery Wrapped Limited Edition Archival Print on Canvas: 40 x 50 inches $1560. Custom sizes, colors, and commissions are also available. For more information or to order, please visit our ABOUT page or call us at 561-691-1110. 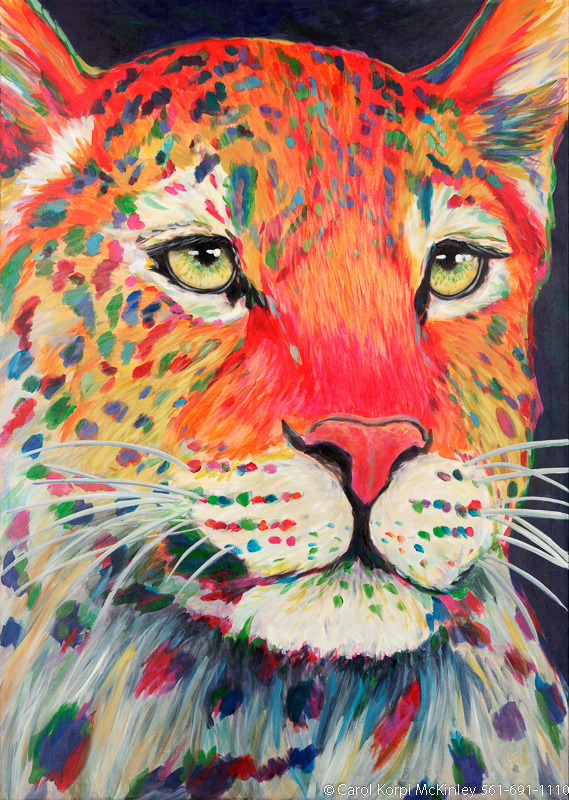 Nuts #VAG-012, Original Acrylic on Canvas: 48 x 68 inches $11700; Stretched and Gallery Wrapped Limited Edition Archival Print on Canvas: 40 x 56 inches $1590. Custom sizes, colors, and commissions are also available. For more information or to order, please visit our ABOUT page or call us at 561-691-1110. 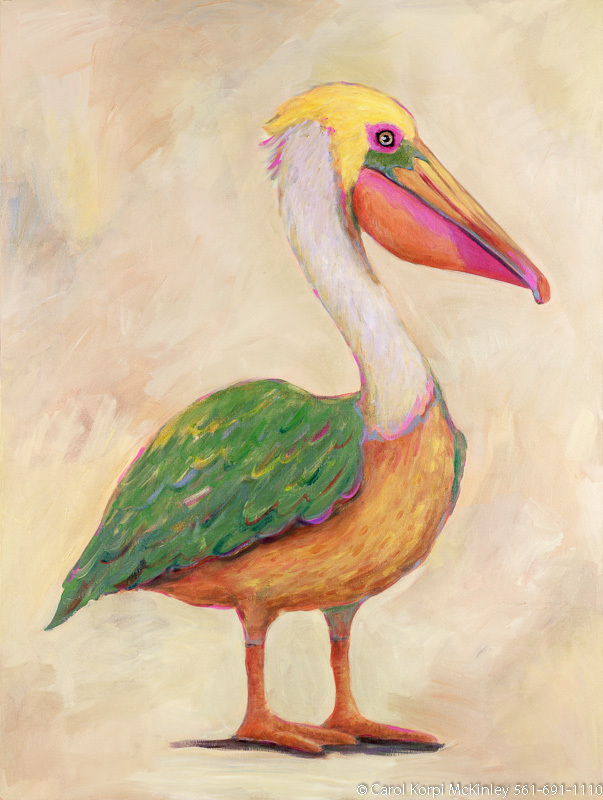 Pelican Green and Yellow #ANF-056, Original Acrylic on Canvas: 30 x 40 inches $2700-, Sold; Stretched and Gallery Wrapped Limited Edition Archival Print on Canvas: 40 x 56 inches $1590-. Custom sizes, colors, and commissions are also available. For more information or to order, please visit our ABOUT page or call us at 561-691-1110. 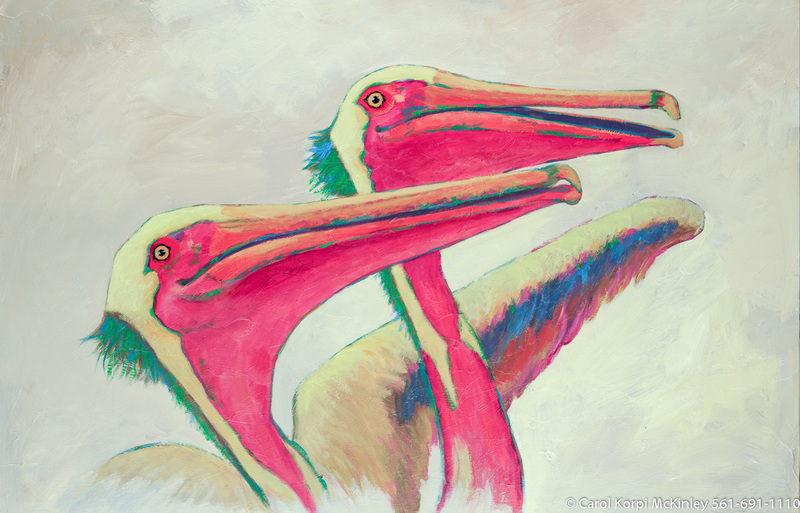 Pelican #ANF-065, Original Acrylic on Canvas: 30 x 40 inches $2100-, Sold; Stretched and Gallery Wrapped Limited Edition Archival Print on Canvas: 40 x 56 inches $1590-. Custom sizes, colors, and commissions are also available. For more information or to order, please visit our ABOUT page or call us at 561-691-1110. 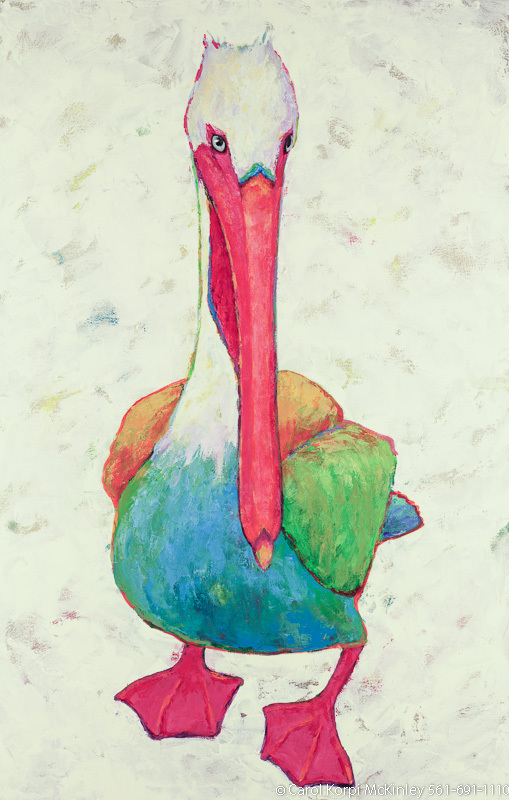 Pelican Green and Orange #ANF-057, Original Acrylic on Canvas: 30 x 40 inches $2700-, Sold; Stretched and Gallery Wrapped Limited Edition Archival Print on Canvas: 40 x 56 inches $1590-. Custom sizes, colors, and commissions are also available. For more information or to order, please visit our ABOUT page or call us at 561-691-1110. 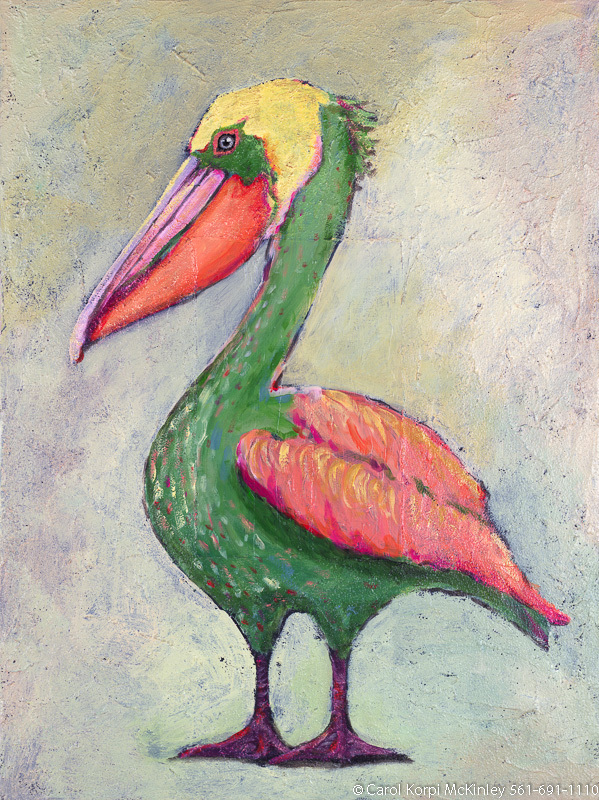 Pelican #ANF-066, Original Acrylic on Canvas: 30 x 40 inches $2100-, Sold; Stretched and Gallery Wrapped Limited Edition Archival Print on Canvas: 40 x 56 inches $1590-. Custom sizes, colors, and commissions are also available. For more information or to order, please visit our ABOUT page or call us at 561-691-1110. 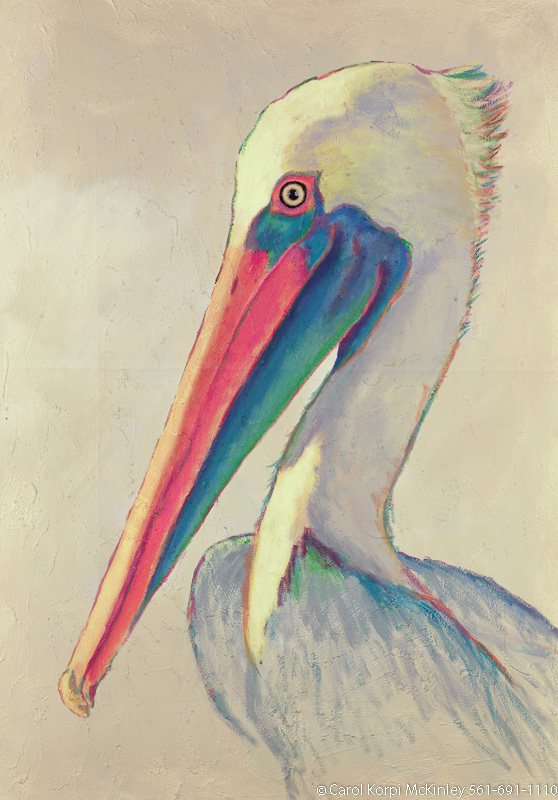 Pelican Ochre and Blue #ANF-060, Original Acrylic on Canvas: 30 x 40 inches $2700; Stretched and Gallery Wrapped Limited Edition Archival Print on Canvas: 40 x 56 inches $1590. Custom sizes, colors, and commissions are also available. For more information or to order, please visit our ABOUT page or call us at 561-691-1110. 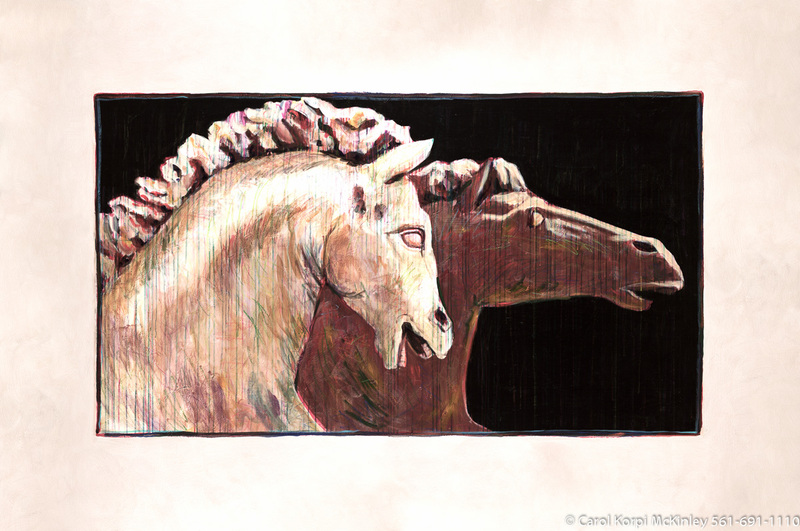 Red Parrot #NFR-004, Original Acrylic on Canvas: 24 x 68 inches $2700; Stretched and Gallery Wrapped Limited Edition Archival Print on Canvas: 24 x 68 inches $1560. 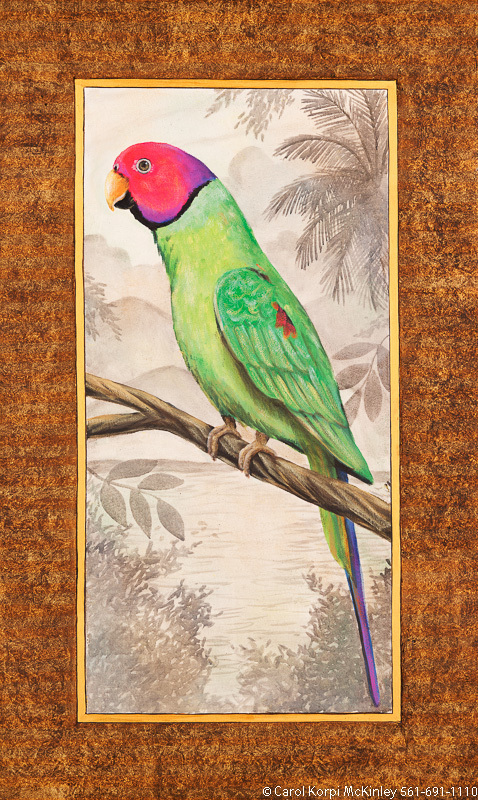 Green Parrot #NFR-005, Original Acrylic on Canvas: 24 x 68 inches $2700-, Sold; Stretched and Gallery Wrapped Limited Edition Archival Print on Canvas: 24 x 68 inches $1560-. 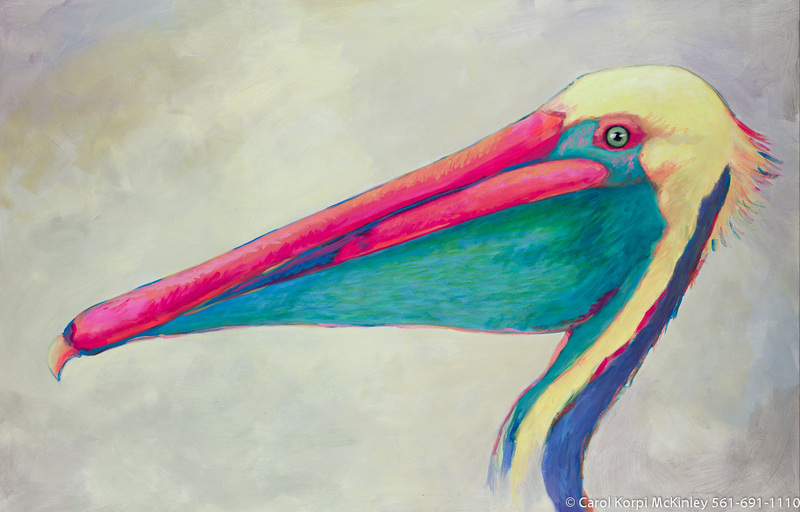 Pelican Blue and Orange #ANF-059, Original Acrylic on Canvas: 30 x 40 inches $2700-, Sold; Stretched and Gallery Wrapped Limited Edition Archival Print on Canvas: 40 x 56 inches $1590-. Custom sizes, colors, and commissions are also available. For more information or to order, please visit our ABOUT page or call us at 561-691-1110. 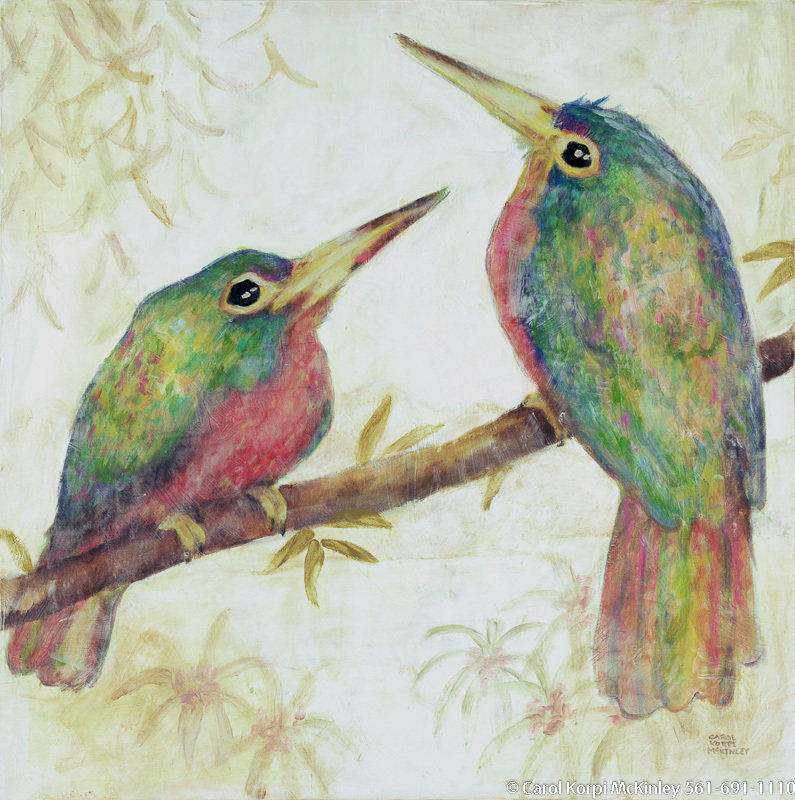 Two Pelicans #ANF-062, Original Acrylic on Canvas: 60 x 60 inches $8400-, Sold; Stretched and Gallery Wrapped Limited Edition Archival Print on Canvas: 40 x 40 inches $1500-. Custom sizes, colors, and commissions are also available. For more information or to order, please visit our ABOUT page or call us at 561-691-1110. 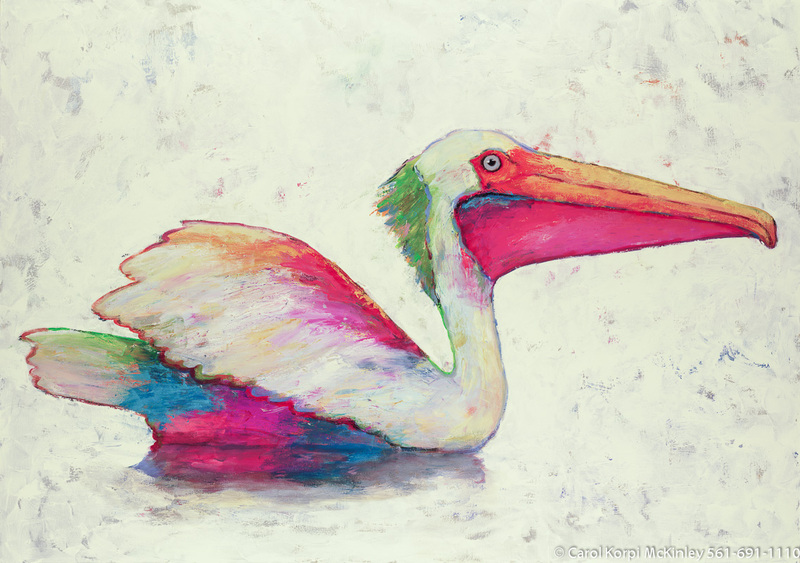 Pelican #ANF-063, Original Acrylic on Canvas: 48 x 68 inches $3600-, Sold; Stretched and Gallery Wrapped Limited Edition Archival Print on Canvas: 40 x 56 inches $1590-. Custom sizes, colors, and commissions are also available. For more information or to order, please visit our ABOUT page or call us at 561-691-1110. 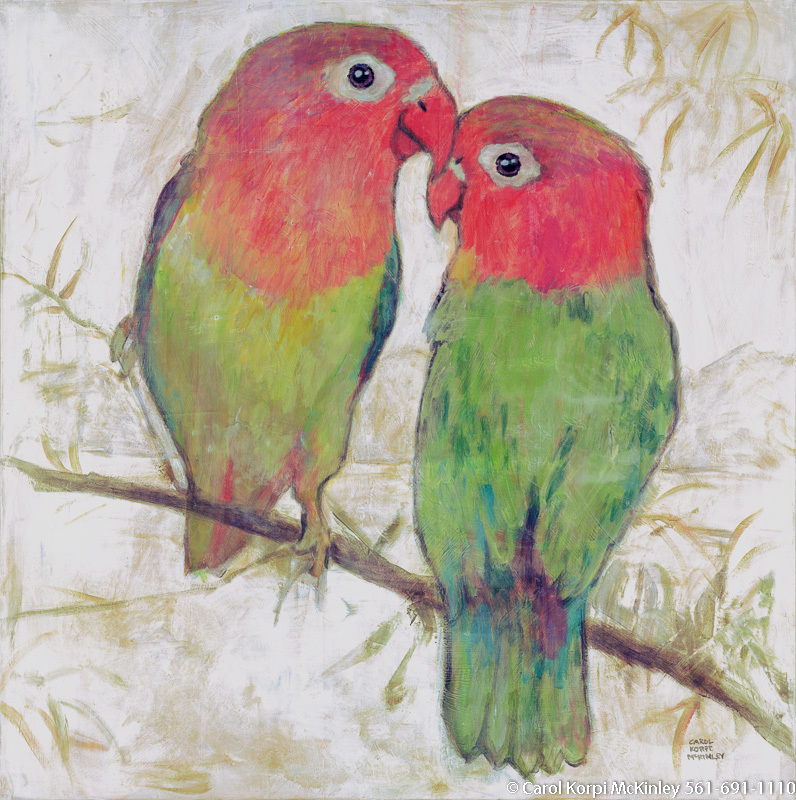 Love Birds #SMR-008, Original Acrylic on Canvas: 40 x 40 inches $3600; Stretched and Gallery Wrapped Limited Edition Archival Print on Canvas: 40 x 40 inches $1500. Custom sizes, colors, and commissions are also available. For more information or to order, please visit our ABOUT page or call us at 561-691-1110. 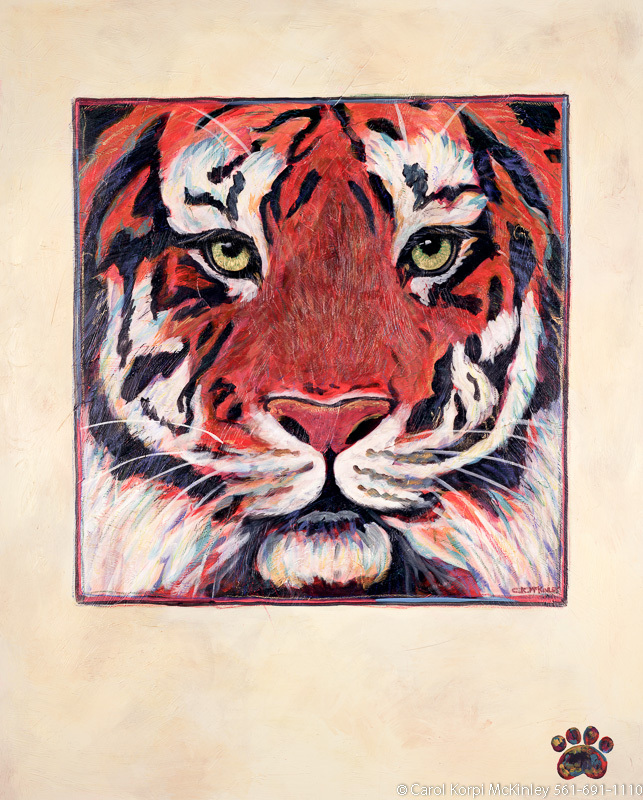 Tiger Bird #SMR-010, Original Acrylic on Canvas: 40 x 40 inches $3600; Stretched and Gallery Wrapped Limited Edition Archival Print on Canvas: 40 x 40 inches $1500. Custom sizes, colors, and commissions are also available. For more information or to order, please visit our ABOUT page or call us at 561-691-1110. 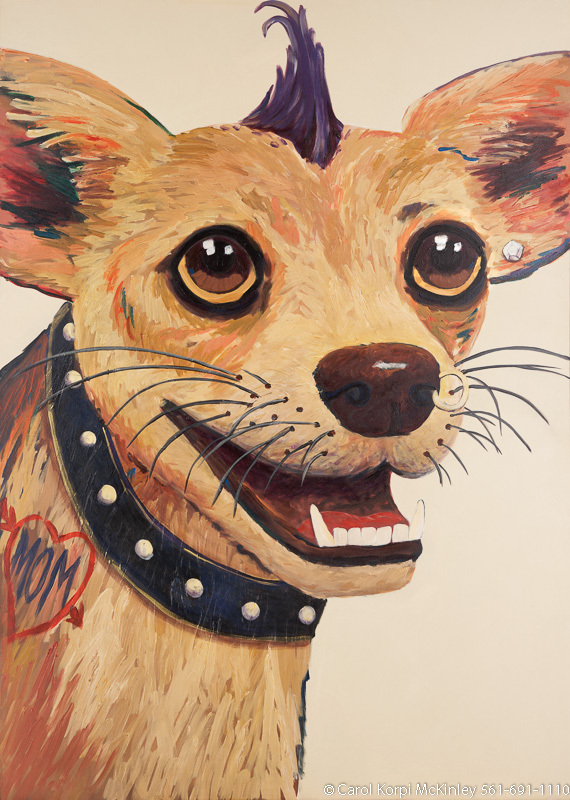 Mot Mots #SMR-009, Original Acrylic on Canvas: 40 x 40 inches $3600; Stretched and Gallery Wrapped Limited Edition Archival Print on Canvas: 40 x 40 inches $1500. Custom sizes, colors, and commissions are also available. For more information or to order, please visit our ABOUT page or call us at 561-691-1110. 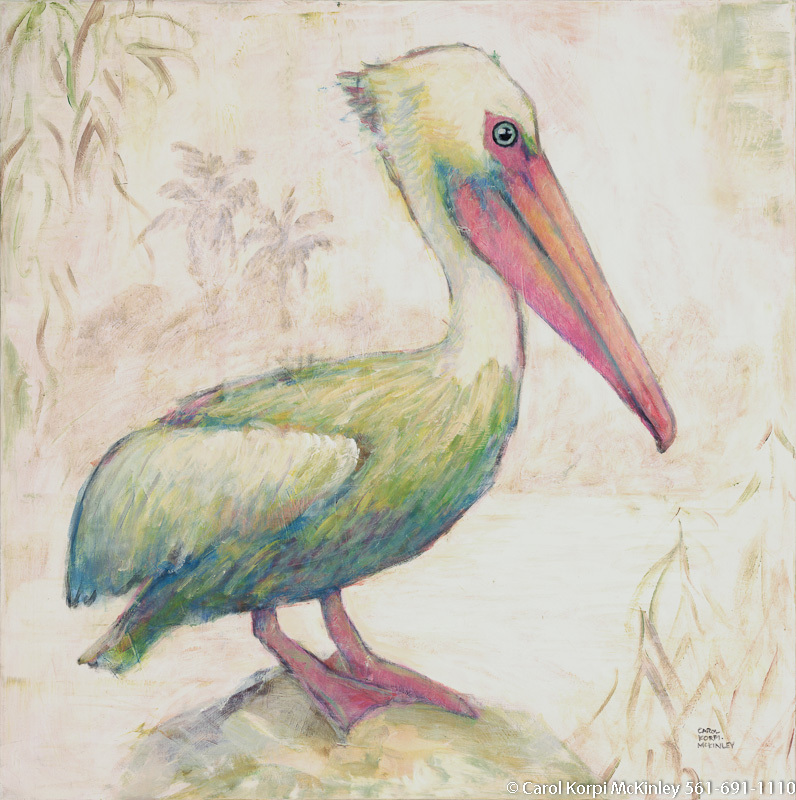 Pelican #SMR-007, Original Acrylic on Canvas: 40 x 40 inches $3600; Stretched and Gallery Wrapped Limited Edition Archival Print on Canvas: 40 x 40 inches $1500. Custom sizes, colors, and commissions are also available. For more information or to order, please visit our ABOUT page or call us at 561-691-1110. 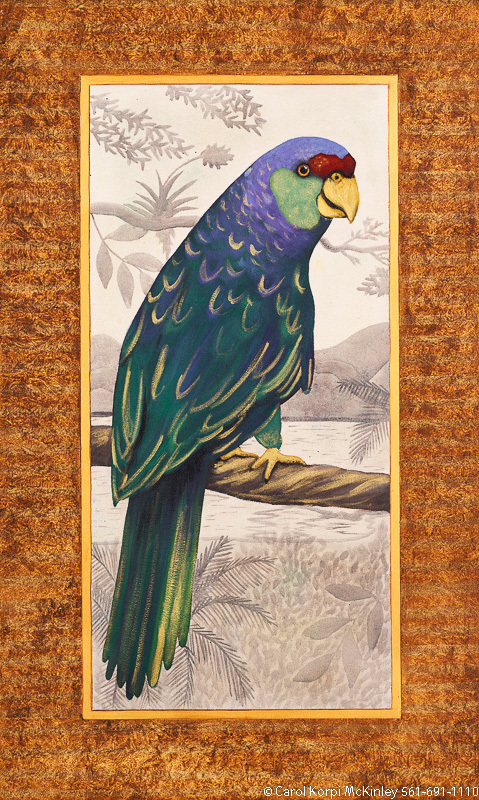 Parrot #AAX-071, Original Acrylic on Canvas: 18 x 68 inches $4200; Stretched and Gallery Wrapped Limited Edition Archival Print on Canvas: 18 x 68 inches $1530. 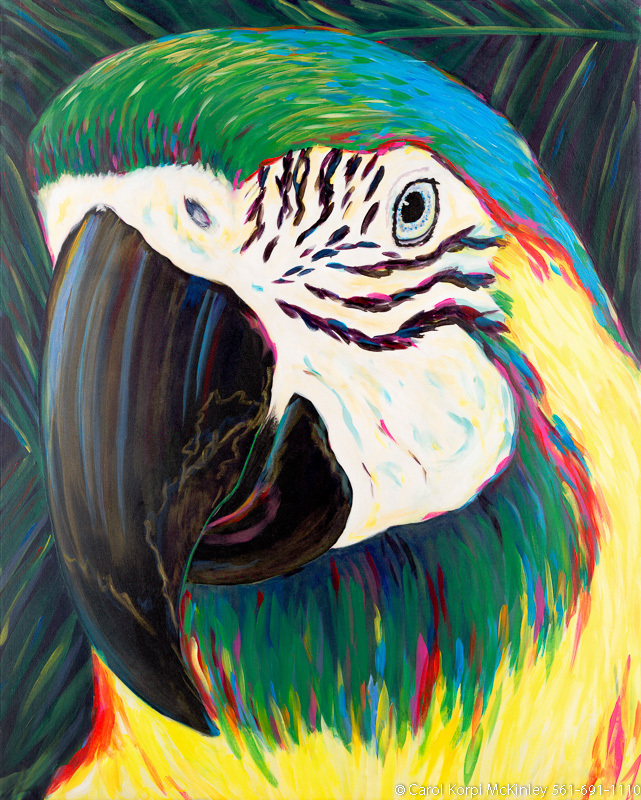 Parrot #FBI-007, Original Acrylic on Canvas: 36 x 60 inches $2700; Stretched and Gallery Wrapped Limited Edition Archival Print on Canvas: 36 x 60 inches $1590. 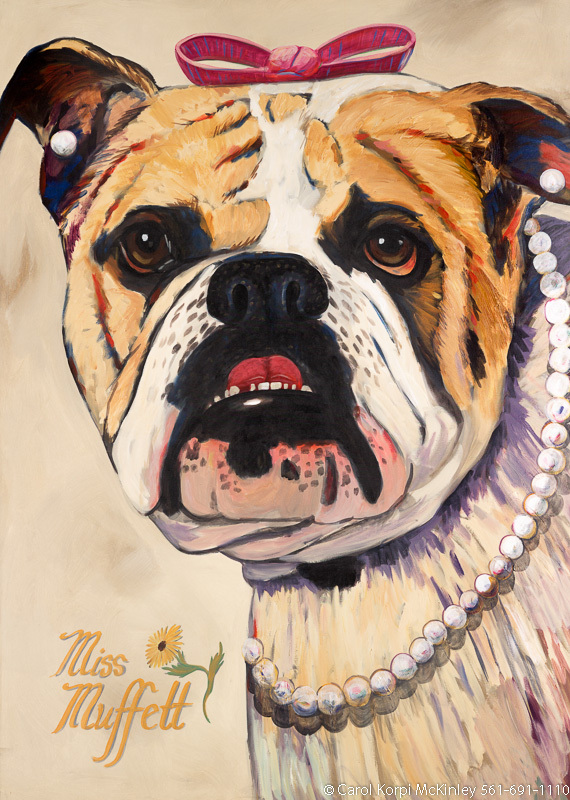 Custom sizes, colors, and commissions are also available. For more information or to order, please visit our ABOUT page or call us at 561-691-1110. 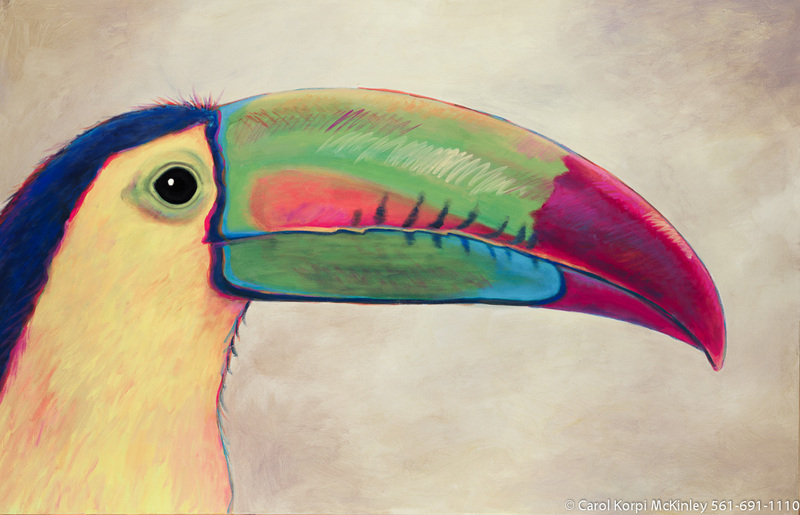 Parrot #FBI-002, Original Acrylic on Canvas: 36 x 60 inches $2700; Stretched and Gallery Wrapped Limited Edition Archival Print on Canvas: 36 x 60 inches $1590. Custom sizes, colors, and commissions are also available. For more information or to order, please visit our ABOUT page or call us at 561-691-1110. 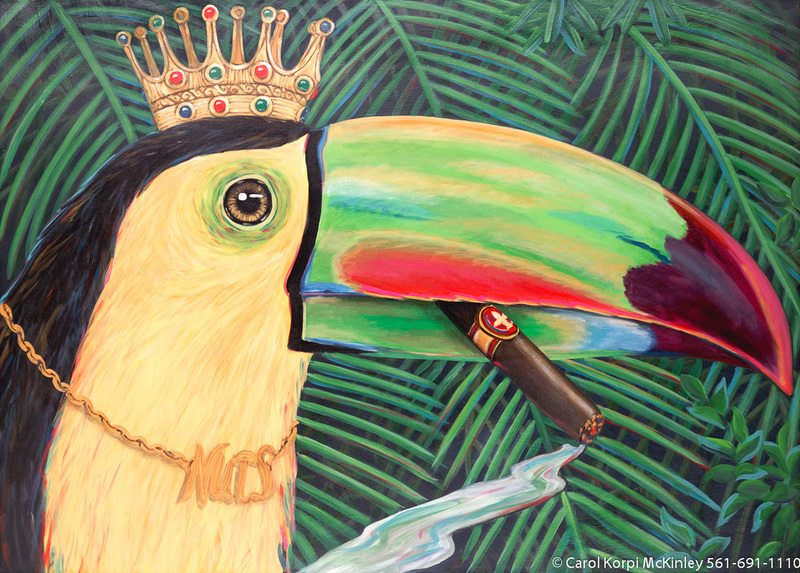 Toucan #FBI-006, Original Acrylic on Canvas: 48 x 60 inches $2850; Stretched and Gallery Wrapped Limited Edition Archival Print on Canvas: 40 x 50 inches $1560. Custom sizes, colors, and commissions are also available. For more information or to order, please visit our ABOUT page or call us at 561-691-1110. 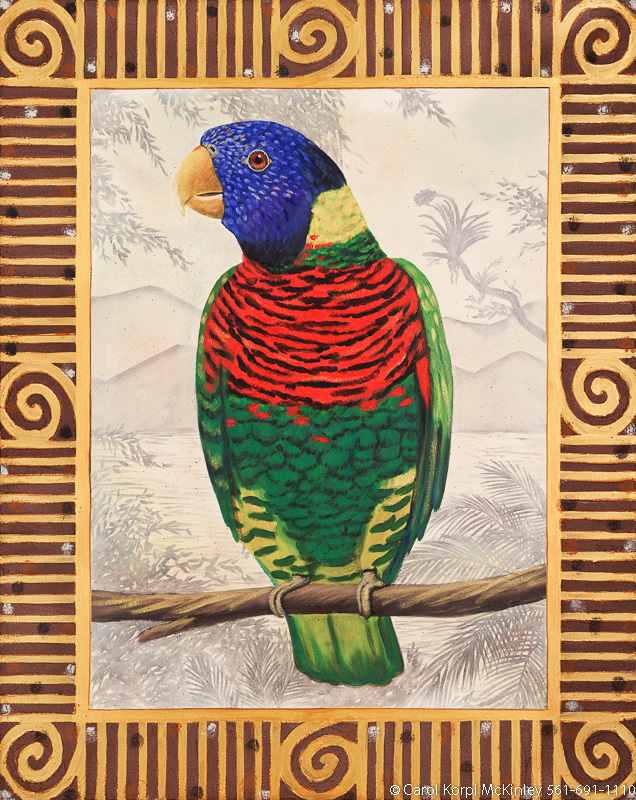 Lorikeet #FBI-017, Original Acrylic on Canvas: 48 x 60 inches, Sold; Stretched and Gallery Wrapped Limited Edition Archival Print on Canvas: 40 x 50 inches $1560-. Custom sizes, colors, and commissions are also available. For more information or to order, please visit our ABOUT page or call us at 561-691-1110. 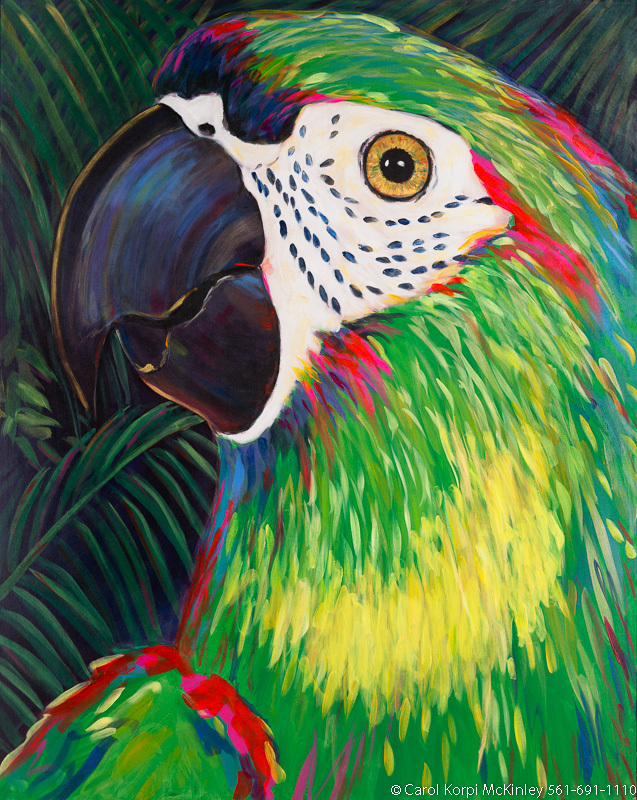 Parrot #FBI-001, Original Acrylic on Canvas: 36 x 60 inches $2700; Stretched and Gallery Wrapped Limited Edition Archival Print on Canvas: 36 x 60 inches $1590. Custom sizes, colors, and commissions are also available. For more information or to order, please visit our ABOUT page or call us at 561-691-1110. 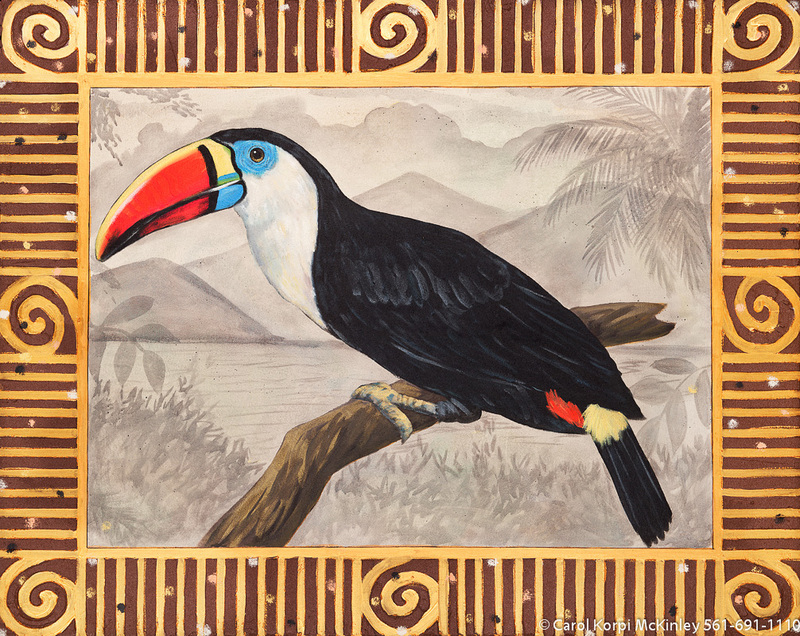 Toucan #ANF-048, Original Acrylic on Canvas: 48 x 60 inches, Sold; Stretched and Gallery Wrapped Limited Edition Archival Print on Canvas: 40 x 50 inches $1560-. Custom sizes, colors, and commissions are also available. For more information or to order, please visit our ABOUT page or call us at 561-691-1110. 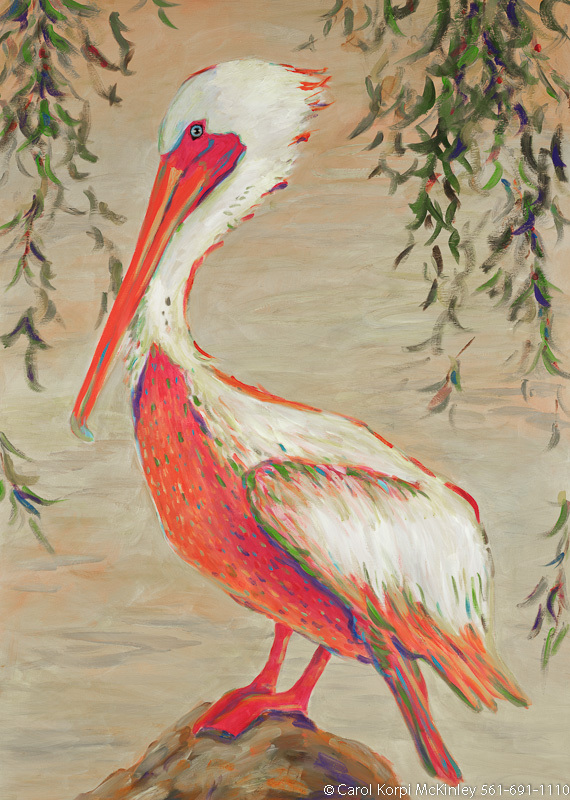 Pelican #BBB-098, Original Acrylic on Canvas: 48 x 68 inches, Sold; Stretched and Gallery Wrapped Limited Edition Archival Print on Canvas: 40 x 56 inches $1590-. Custom sizes, colors, and commissions are also available. For more information or to order, please visit our ABOUT page or call us at 561-691-1110. 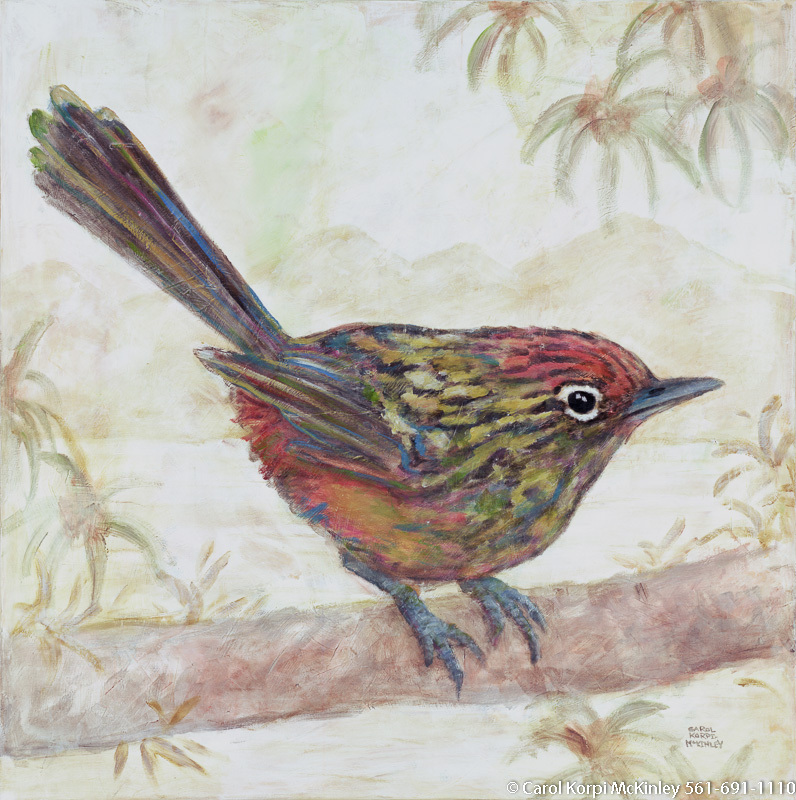 Parrot #ANF-055, Original Acrylic on Canvas: 48 x 60 inches $5250; Stretched and Gallery Wrapped Limited Edition Archival Print on Canvas: 40 x 50 inches $1560. Custom sizes, colors, and commissions are also available. For more information or to order, please visit our ABOUT page or call us at 561-691-1110. 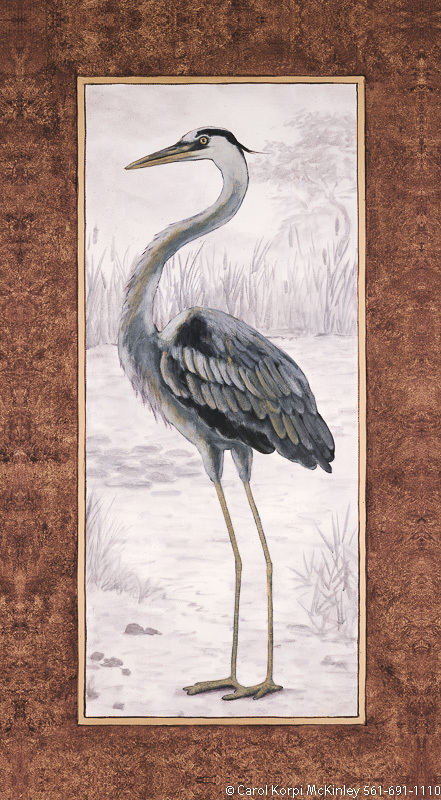 Heron #FBI-018, Original Acrylic on Canvas: 36 x 68 inches $2700; Stretched and Gallery Wrapped Limited Edition Archival Print on Canvas: 36 x 68 inches $1620. 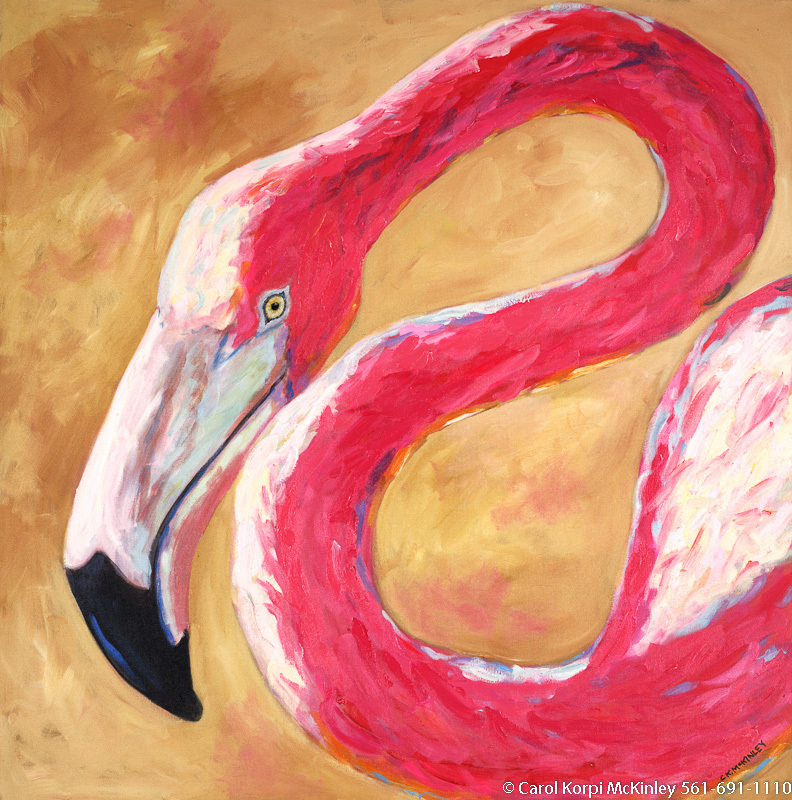 Flamingo #ANF-025, Original Acrylic on Canvas: 48 x 48 inches $4800; Stretched and Gallery Wrapped Limited Edition Archival Print on Canvas: 40 x 40 inches $1500. Custom sizes, colors, and commissions are also available. For more information or to order, please visit our ABOUT page or call us at 561-691-1110. 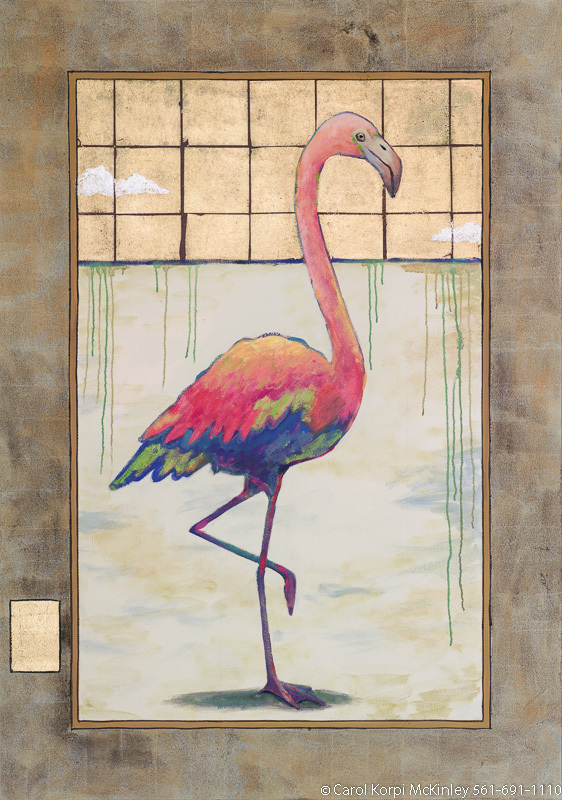 Flamingo #FBI-009, Original Acrylic on Canvas: 48 x 68 inches $2925; Stretched and Gallery Wrapped Limited Edition Archival Print on Canvas: 40 x 56 inches $1590. Custom sizes, colors, and commissions are also available. For more information or to order, please visit our ABOUT page or call us at 561-691-1110. 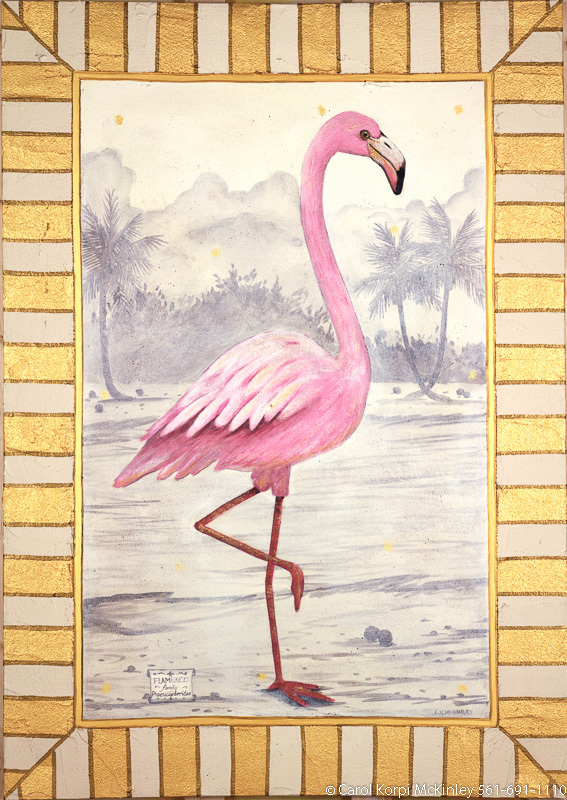 Flamingo #FBI-010, Original Acrylic on Canvas: 48 x 68 inches $2925; Stretched and Gallery Wrapped Limited Edition Archival Print on Canvas: 40 x 56 inches $1590. Custom sizes, colors, and commissions are also available. For more information or to order, please visit our ABOUT page or call us at 561-691-1110. 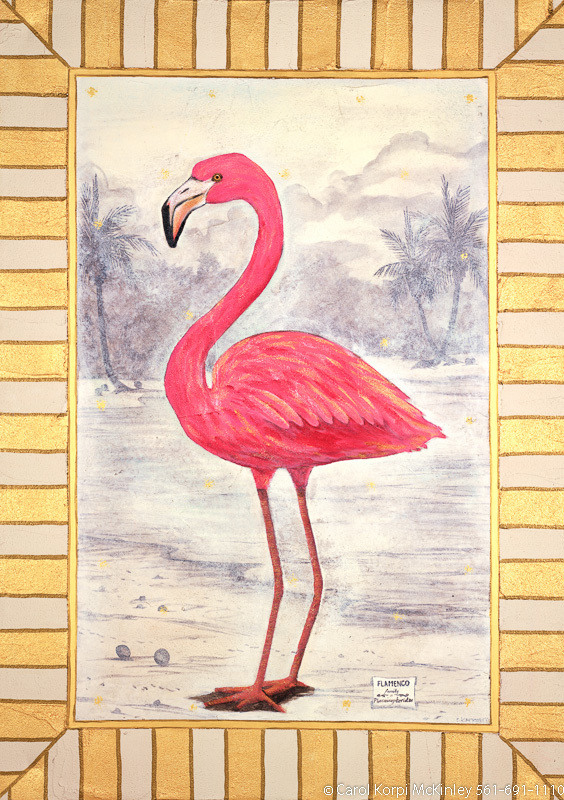 Flamingo #ANF-080, Original Acrylic on Canvas: 48 x 68 inches $2925; Stretched and Gallery Wrapped Limited Edition Archival Print on Canvas: 40 x 56 inches $1590. Custom sizes, colors, and commissions are also available. For more information or to order, please visit our ABOUT page or call us at 561-691-1110. 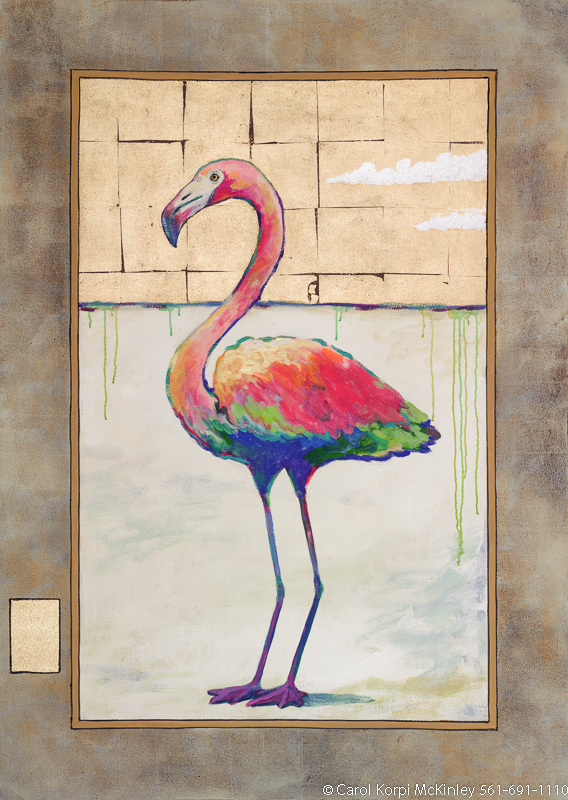 Flamingo #ANF-079, Original Acrylic on Canvas: 48 x 68 inches $2925; Stretched and Gallery Wrapped Limited Edition Archival Print on Canvas: 40 x 56 inches $1590. Custom sizes, colors, and commissions are also available. For more information or to order, please visit our ABOUT page or call us at 561-691-1110. 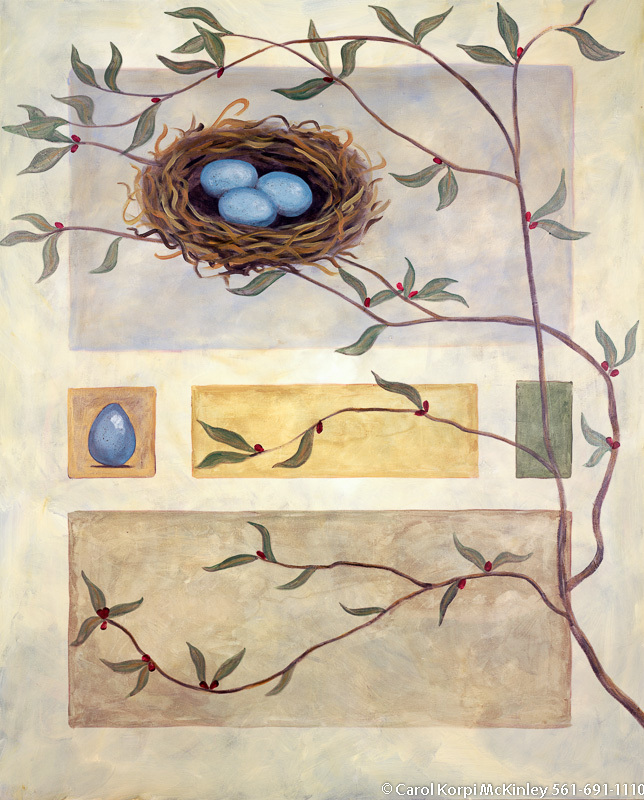 Birds Nest #MSC-049, Original Acrylic on Canvas: 48 x 60 inches $3600; Stretched and Gallery Wrapped Limited Edition Archival Print on Canvas: 40 x 50 inches $1560. Custom sizes, colors, and commissions are also available. For more information or to order, please visit our ABOUT page or call us at 561-691-1110. 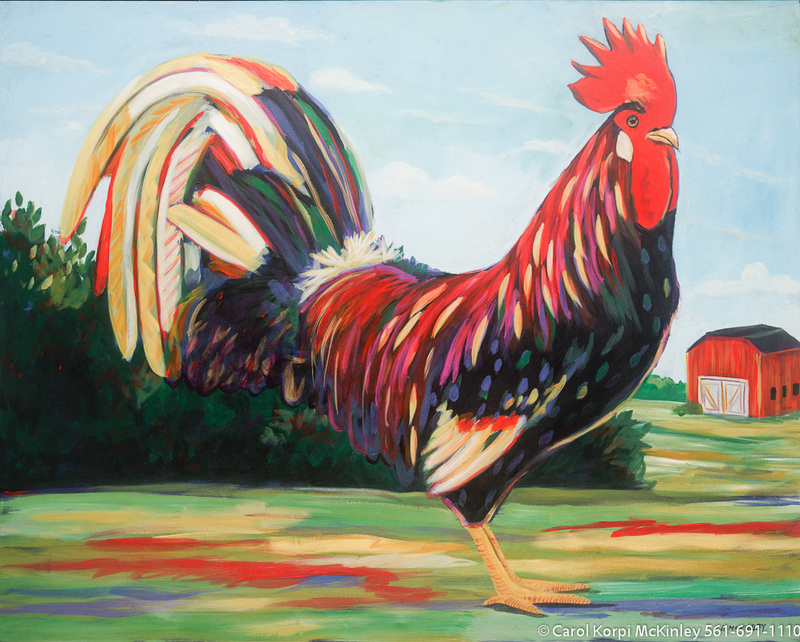 Rooster #MSC-032, Original Acrylic on Canvas: 48 x 60 inches, Sold; Stretched and Gallery Wrapped Limited Edition Archival Print on Canvas: 40 x 50 inches $1560-. Custom sizes, colors, and commissions are also available. For more information or to order, please visit our ABOUT page or call us at 561-691-1110. 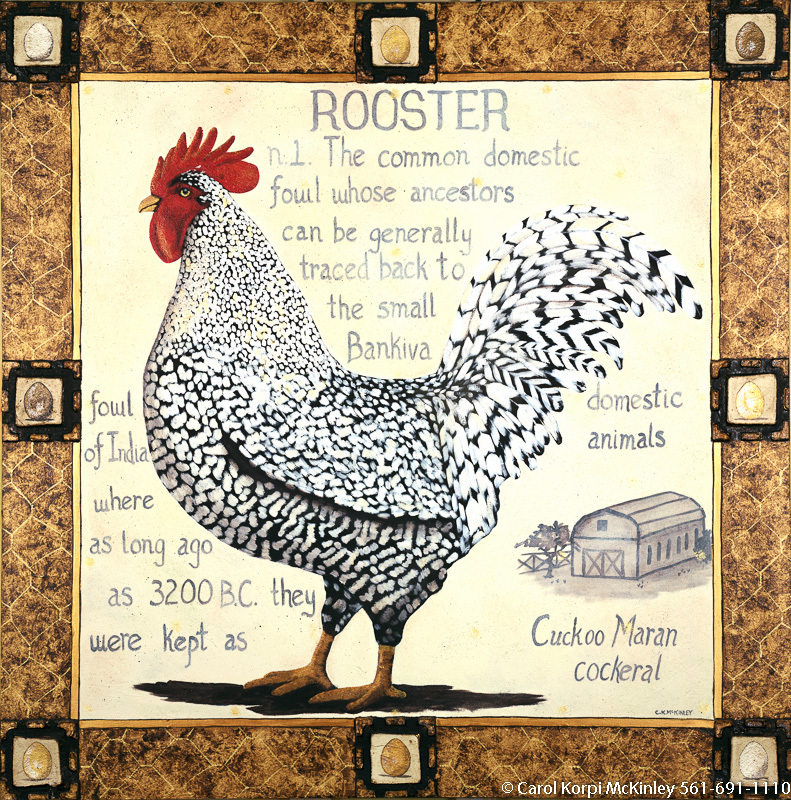 Rooster #MSC-036, Original Acrylic on Canvas: 65 x 72 inches $4950; Stretched and Gallery Wrapped Limited Edition Archival Print on Canvas: 40 x 44 inches $1530. Custom sizes, colors, and commissions are also available. For more information or to order, please visit our ABOUT page or call us at 561-691-1110. 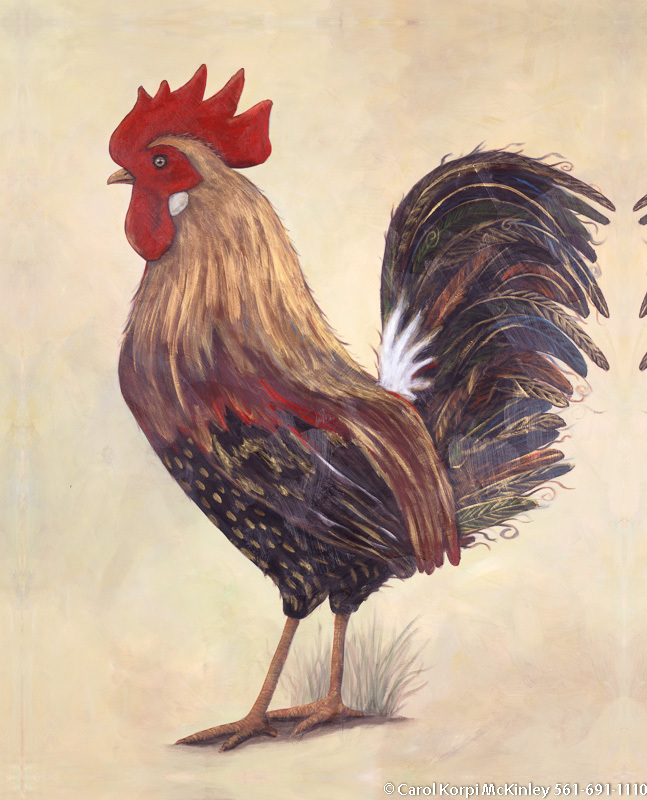 Rooster #ANF-009, Original Acrylic on Canvas: x inches, Sold; Stretched and Gallery Wrapped Limited Edition Archival Print on Canvas: 40 x 50 inches $1560-. Custom sizes, colors, and commissions are also available. For more information or to order, please visit our ABOUT page or call us at 561-691-1110. 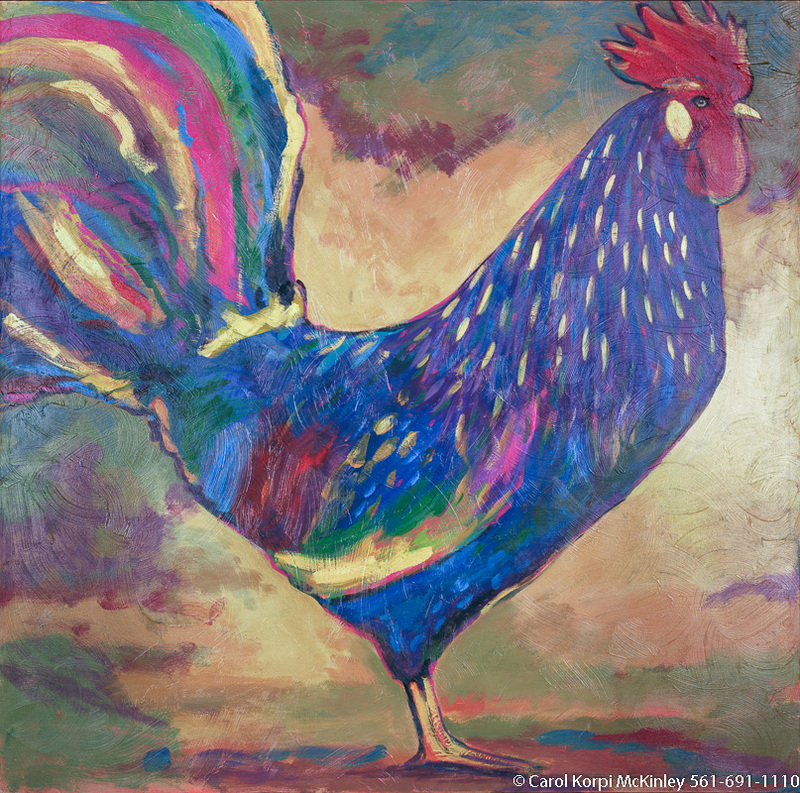 Rooster #ANF-010, Original Acrylic on Canvas: x inches, Sold; Stretched and Gallery Wrapped Limited Edition Archival Print on Canvas: 40 x 50 inches $1560-. Custom sizes, colors, and commissions are also available. For more information or to order, please visit our ABOUT page or call us at 561-691-1110. 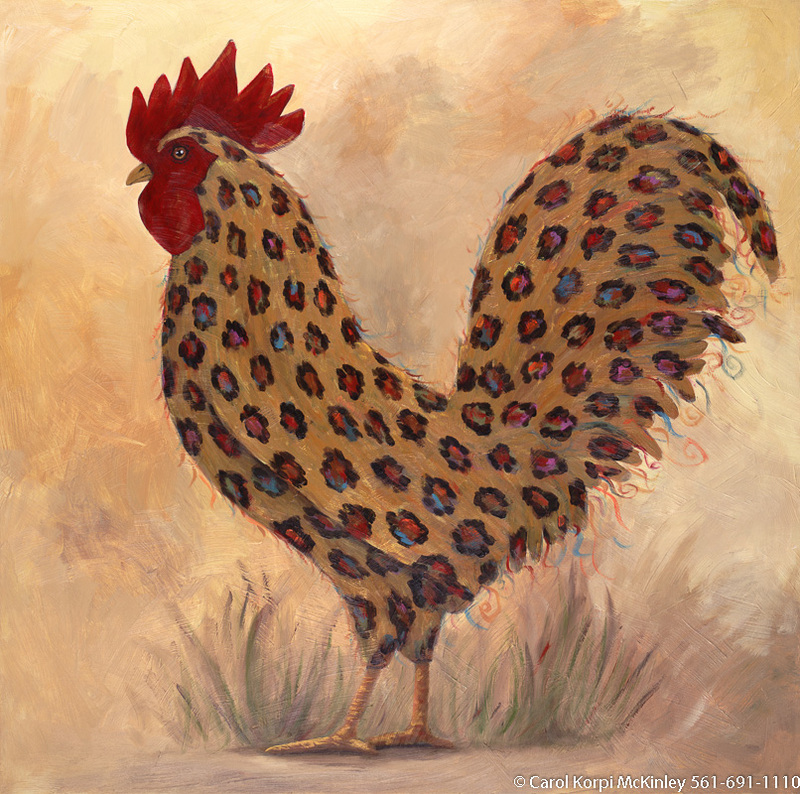 Leopard Rooster #MSC-062, Original Acrylic on Canvas: 48 x 48 inches, Sold; Stretched and Gallery Wrapped Limited Edition Archival Print on Canvas: 40 x 40 inches $1500-. Custom sizes, colors, and commissions are also available. For more information or to order, please visit our ABOUT page or call us at 561-691-1110. 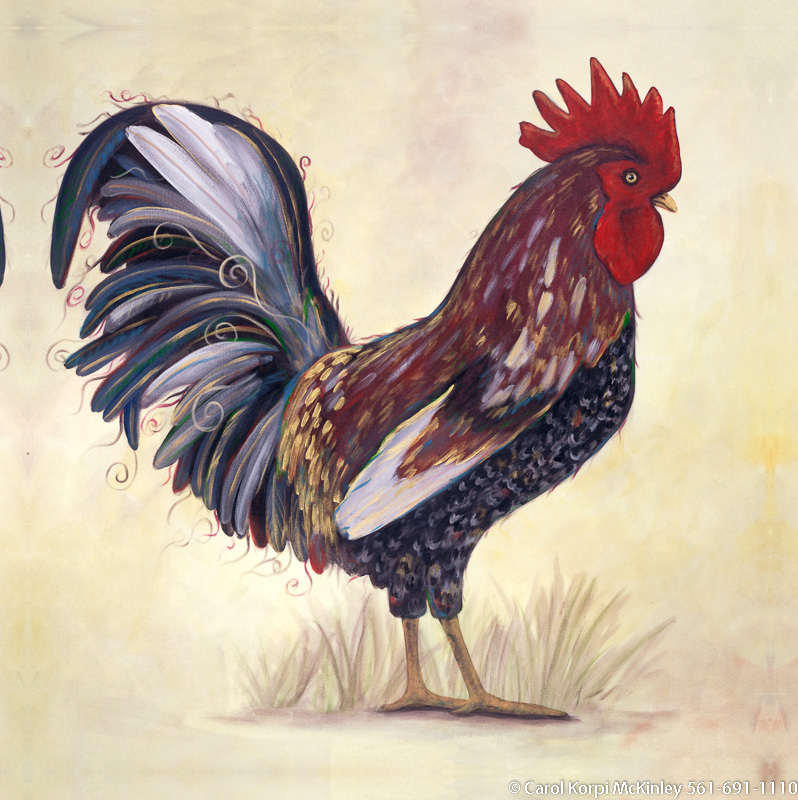 Rooster #MSC-056, Original Acrylic on Canvas: 54 x 54 inches $4050; Stretched and Gallery Wrapped Limited Edition Archival Print on Canvas: 40 x 40 inches $1500. Custom sizes, colors, and commissions are also available. For more information or to order, please visit our ABOUT page or call us at 561-691-1110. 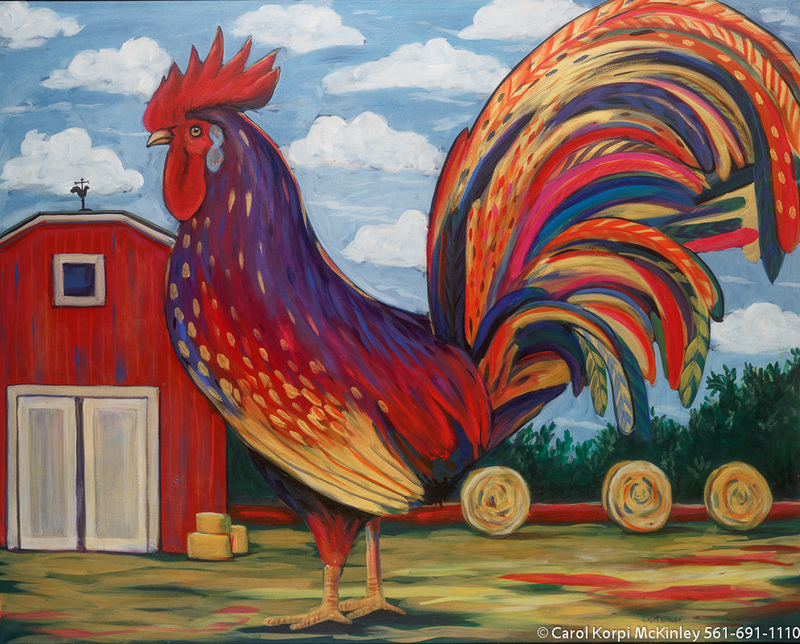 Rooster #MSC-057, Original Acrylic on Canvas: 48 x 60 inches $4050; Stretched and Gallery Wrapped Limited Edition Archival Print on Canvas: 40 x 50 inches $1560. Custom sizes, colors, and commissions are also available. For more information or to order, please visit our ABOUT page or call us at 561-691-1110. 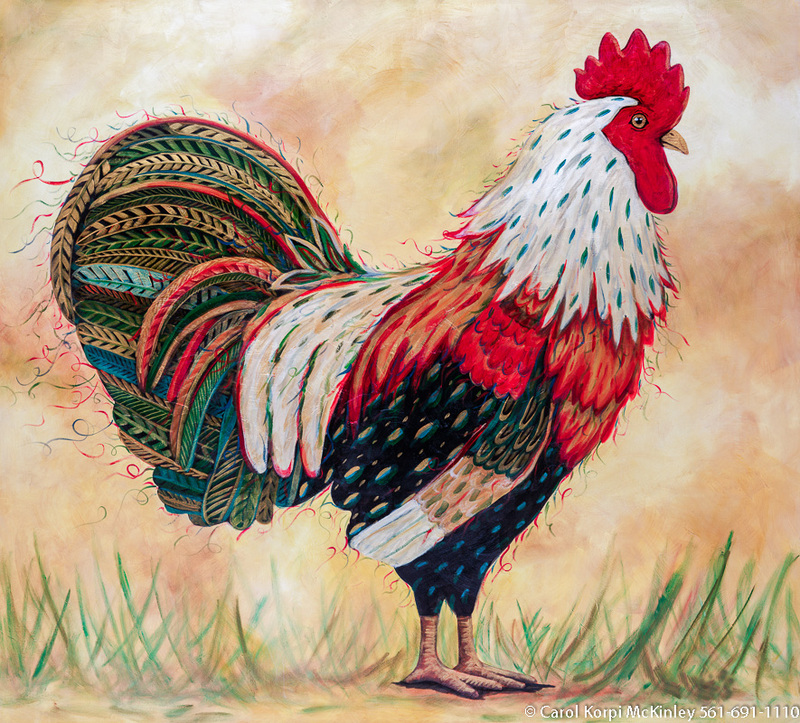 Rooster #MSC-058, Original Acrylic on Canvas: 48 x 60 inches $4050; Stretched and Gallery Wrapped Limited Edition Archival Print on Canvas: 40 x 50 inches $1560. Custom sizes, colors, and commissions are also available. For more information or to order, please visit our ABOUT page or call us at 561-691-1110. 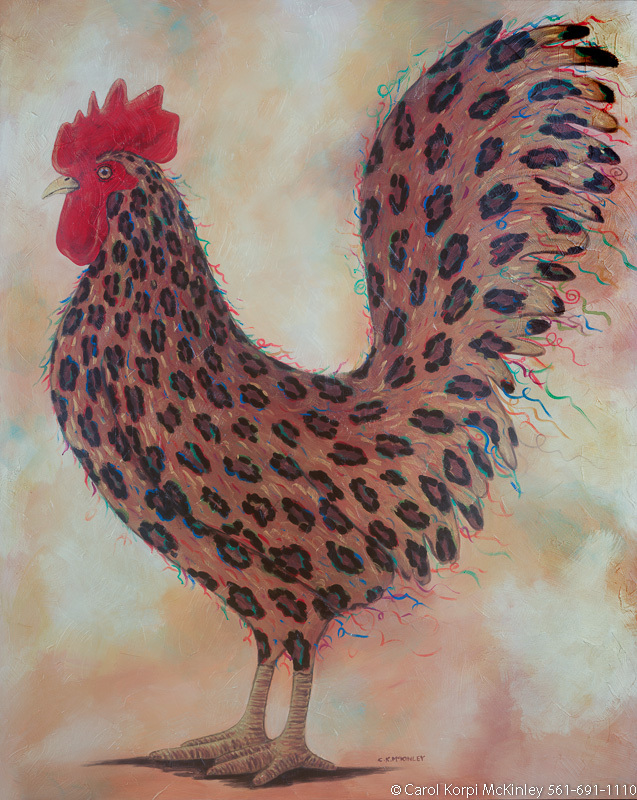 Leopard Rooster #MSC-047, Original Acrylic on Canvas: 48 x 60 inches, Sold; Stretched and Gallery Wrapped Limited Edition Archival Print on Canvas: 40 x 50 inches $1560-. Custom sizes, colors, and commissions are also available. For more information or to order, please visit our ABOUT page or call us at 561-691-1110. 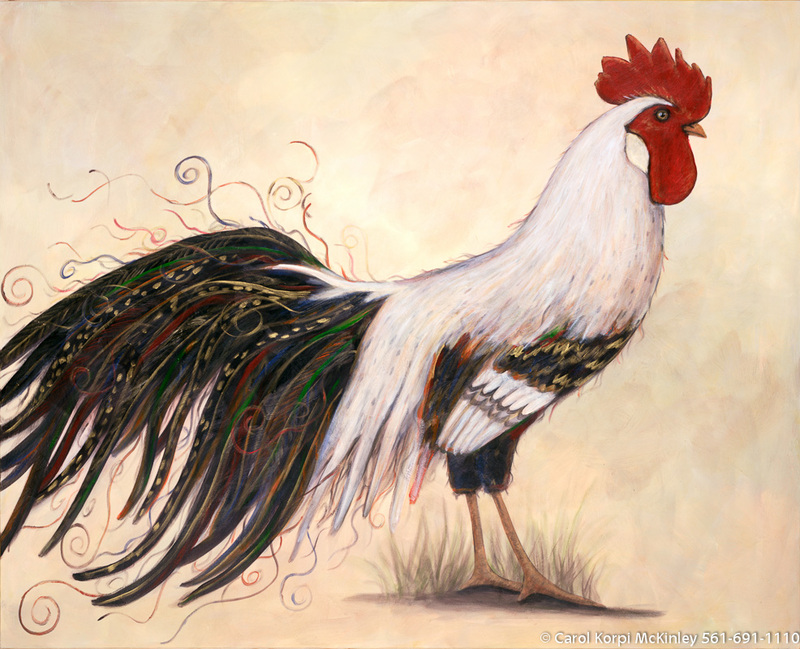 Rooster #ANF-077, Original Acrylic on Canvas: 54 x 54 inches $7500; Stretched and Gallery Wrapped Limited Edition Archival Print on Canvas: 40 x 40 inches $1500. Custom sizes, colors, and commissions are also available. For more information or to order, please visit our ABOUT page or call us at 561-691-1110. 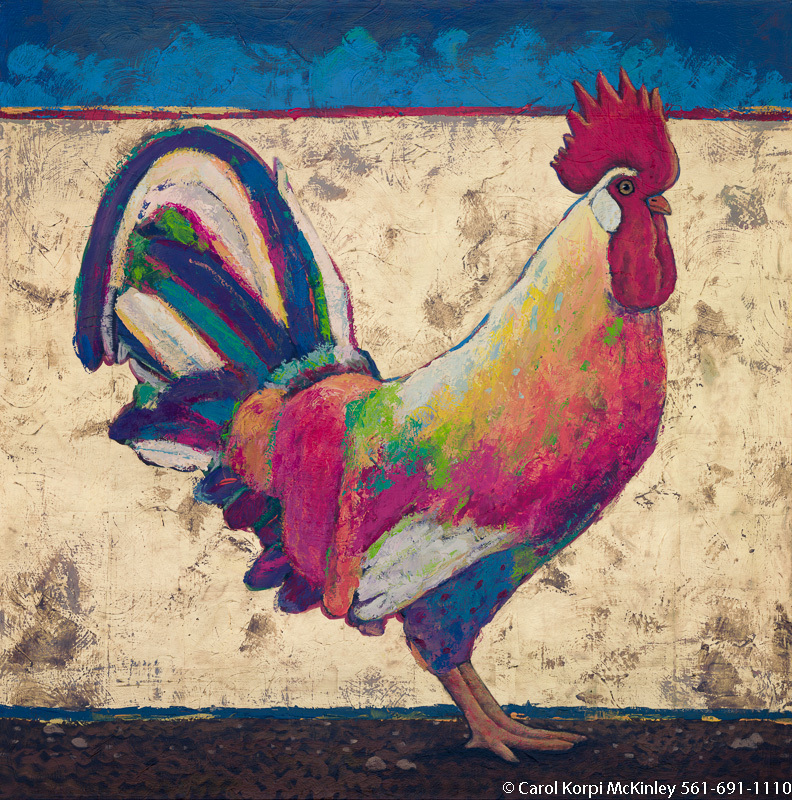 Rooster #ANF-078, Original Acrylic on Canvas: 54 x 54 inches $7500; Stretched and Gallery Wrapped Limited Edition Archival Print on Canvas: 40 x 40 inches $1500. Custom sizes, colors, and commissions are also available. For more information or to order, please visit our ABOUT page or call us at 561-691-1110. 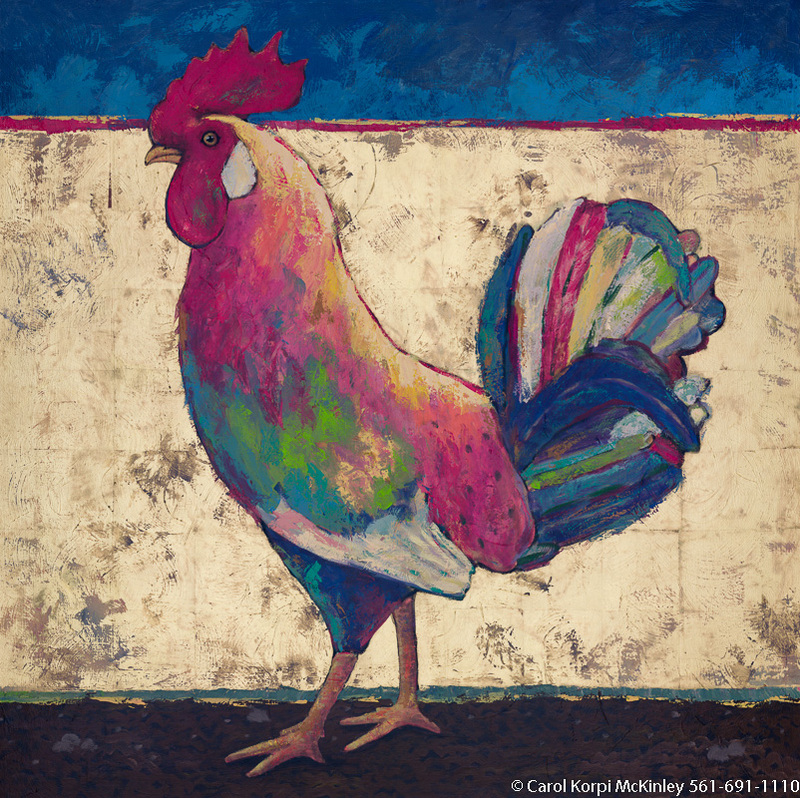 Rooster #ANF-023, Original Acrylic on Canvas: x inches, Sold; Stretched and Gallery Wrapped Limited Edition Archival Print on Canvas: 40 x 40 inches $1500-. Custom sizes, colors, and commissions are also available. For more information or to order, please visit our ABOUT page or call us at 561-691-1110. 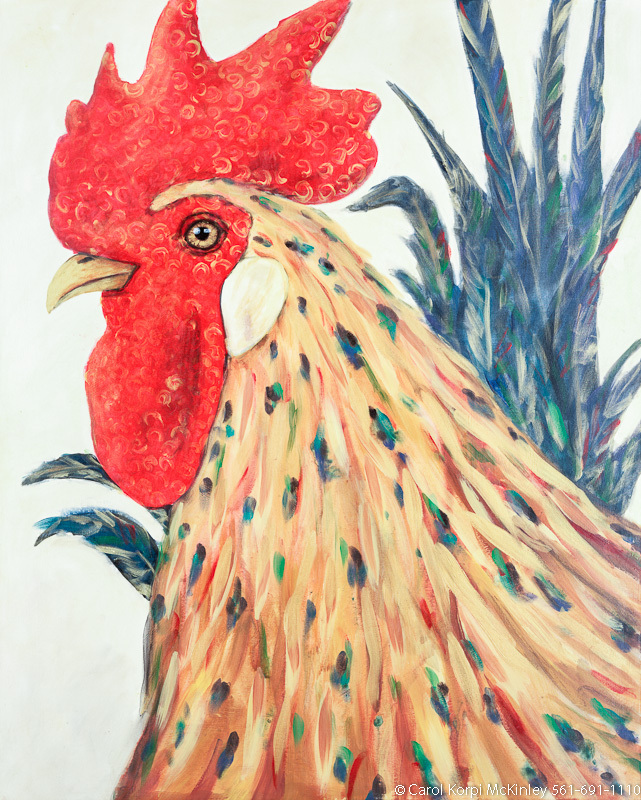 Rooster #FAN-001, Original Acrylic on Canvas: 65 x 65 inches $3075; Stretched and Gallery Wrapped Limited Edition Archival Print on Canvas: 40 x 40 inches $1500. Custom sizes, colors, and commissions are also available. For more information or to order, please visit our ABOUT page or call us at 561-691-1110. 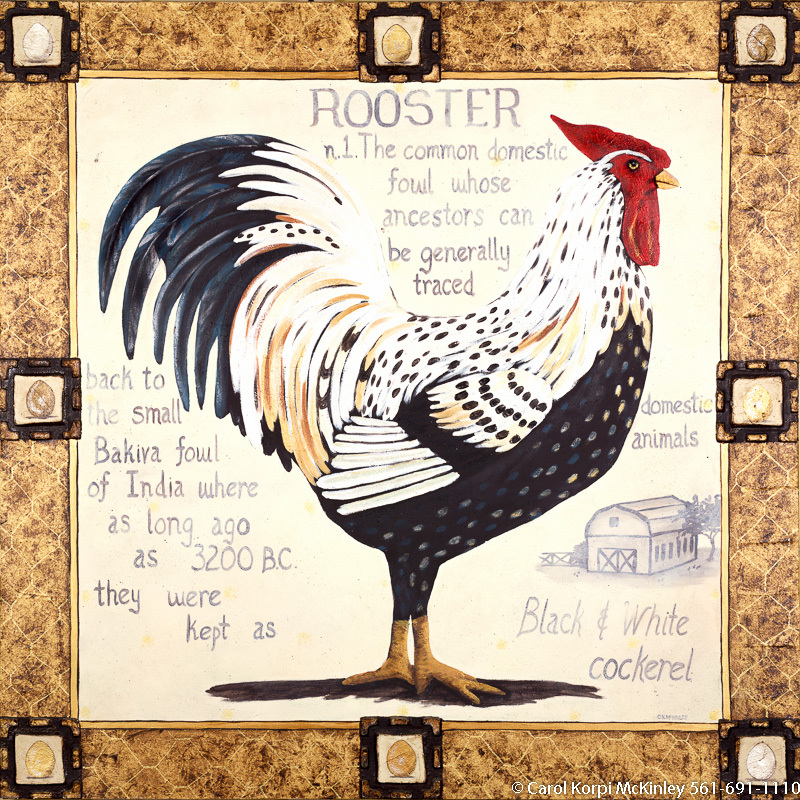 Rooster #FAN-002, Original Acrylic on Canvas: 65 x 65 inches $3075; Stretched and Gallery Wrapped Limited Edition Archival Print on Canvas: 40 x 40 inches $1500. Custom sizes, colors, and commissions are also available. For more information or to order, please visit our ABOUT page or call us at 561-691-1110. 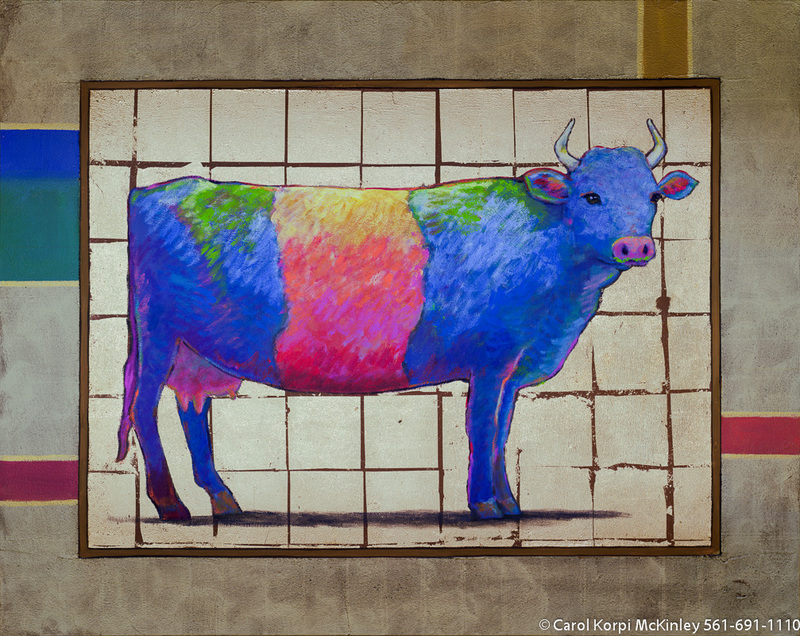 Blue Cow Blue #ANF-081, Original Acrylic on Canvas: 48 x 60 inches $3600; Stretched and Gallery Wrapped Limited Edition Archival Print on Canvas: 40 x 50 inches $1560. Custom sizes, colors, and commissions are also available. For more information or to order, please visit our ABOUT page or call us at 561-691-1110. 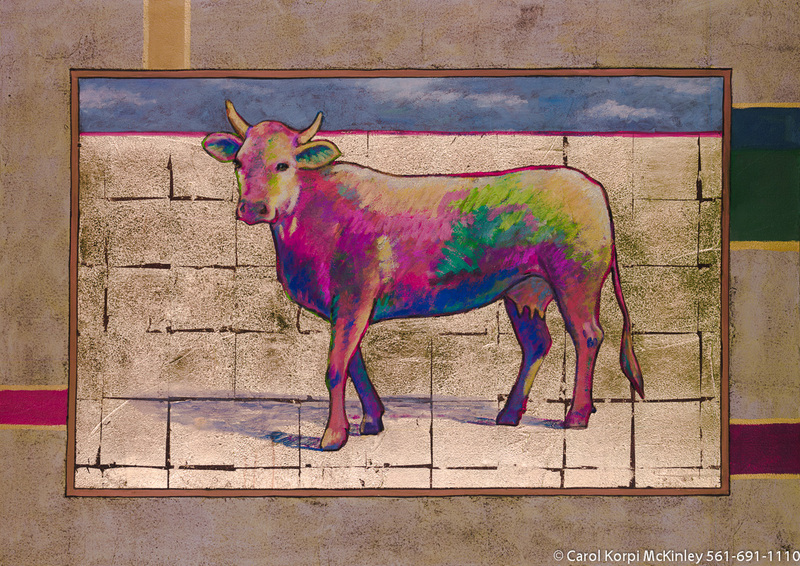 Red Cow #ANF-082, Original Acrylic on Canvas: 48 x 68 inches $3900; Stretched and Gallery Wrapped Limited Edition Archival Print on Canvas: 40 x 56 inches $1590. Custom sizes, colors, and commissions are also available. For more information or to order, please visit our ABOUT page or call us at 561-691-1110. 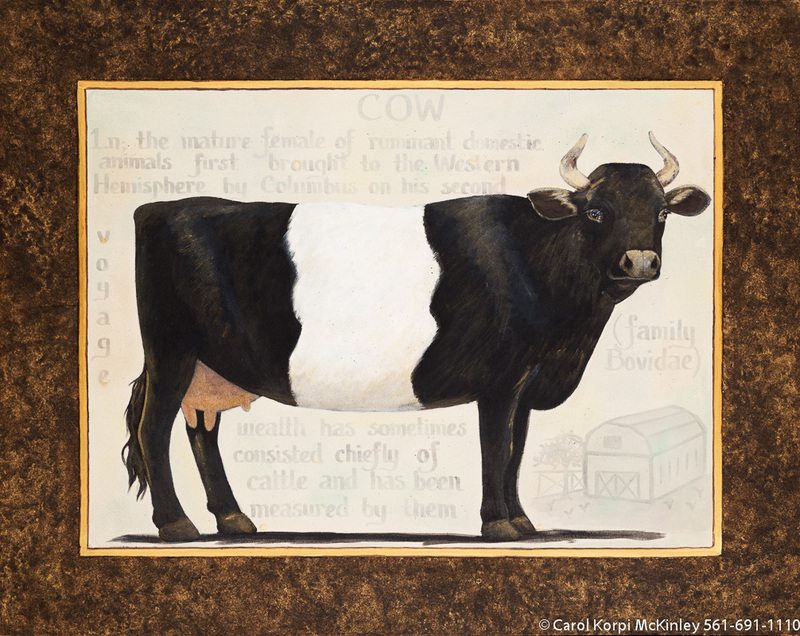 Cow #FAN-005, Original Acrylic on Canvas: 48 x 60 inches $2850; Stretched and Gallery Wrapped Limited Edition Archival Print on Canvas: 40 x 50 inches $1560. Custom sizes, colors, and commissions are also available. For more information or to order, please visit our ABOUT page or call us at 561-691-1110. 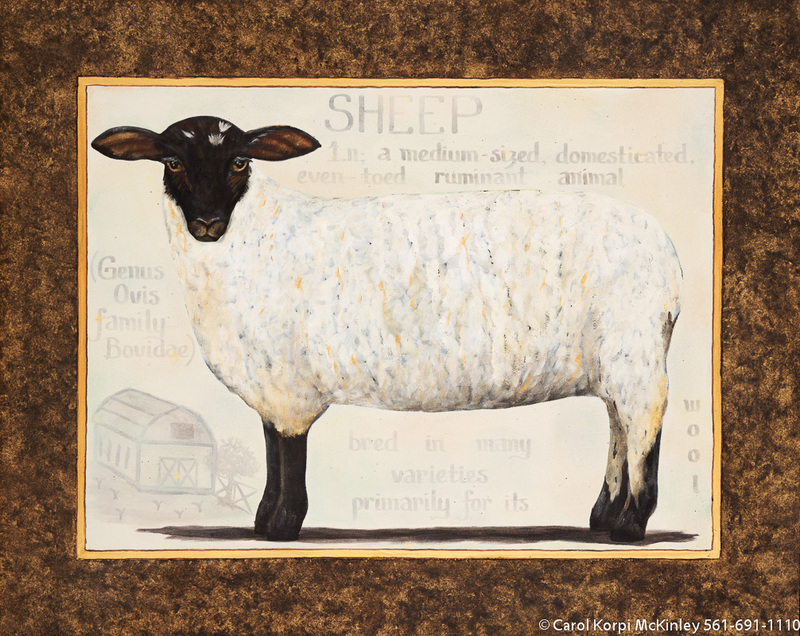 Sheep #FAN-006, Original Acrylic on Canvas: 48 x 60 inches $2850; Stretched and Gallery Wrapped Limited Edition Archival Print on Canvas: 40 x 50 inches $1560. Custom sizes, colors, and commissions are also available. For more information or to order, please visit our ABOUT page or call us at 561-691-1110. 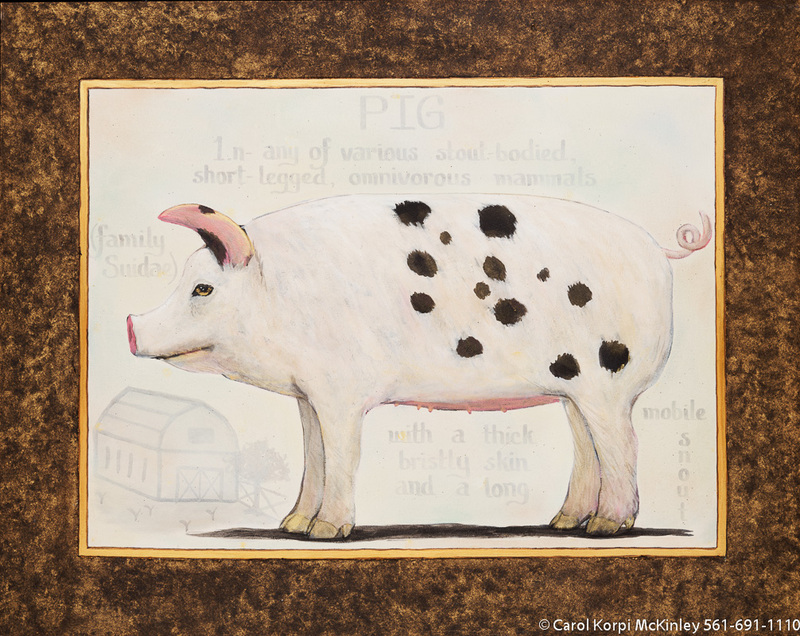 Pig #FAN-007, Original Acrylic on Canvas: 48 x 60 inches $2850; Stretched and Gallery Wrapped Limited Edition Archival Print on Canvas: 40 x 50 inches $1560. Custom sizes, colors, and commissions are also available. For more information or to order, please visit our ABOUT page or call us at 561-691-1110. 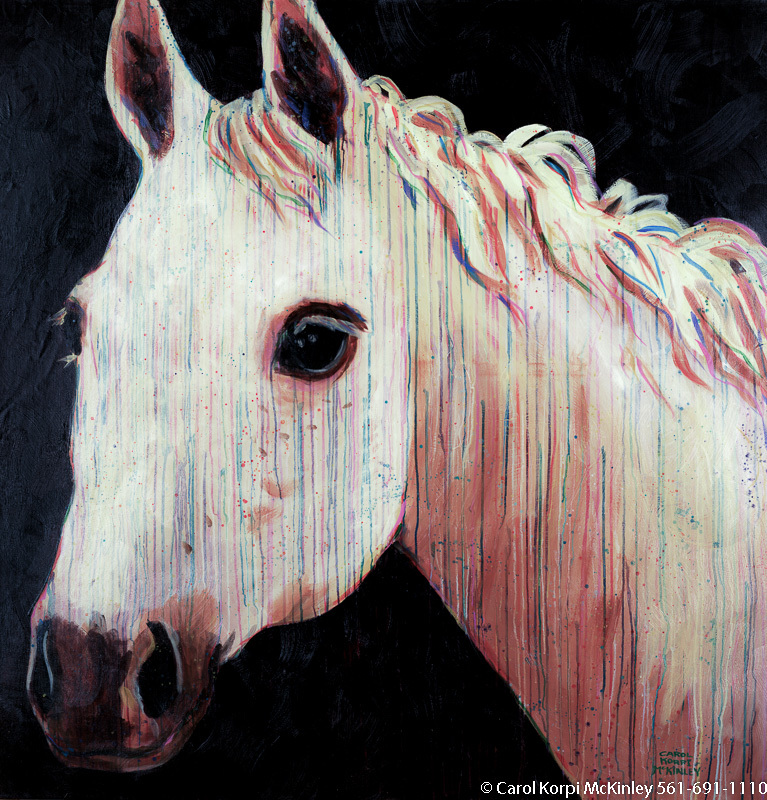 White Horse #BBB-010, Original Acrylic on Canvas: 54 x 54 inches $10200; Stretched and Gallery Wrapped Limited Edition Archival Print on Canvas: 40 x 40 inches $1500. Custom sizes, colors, and commissions are also available. For more information or to order, please visit our ABOUT page or call us at 561-691-1110. Two Horse Sculptures #BBB-073, Original Acrylic on Canvas: 65 x 96 inches $12750; Stretched and Gallery Wrapped Limited Edition Archival Print on Canvas: 40 x 60 inches $1590. Custom sizes, colors, and commissions are also available. For more information or to order, please visit our ABOUT page or call us at 561-691-1110. 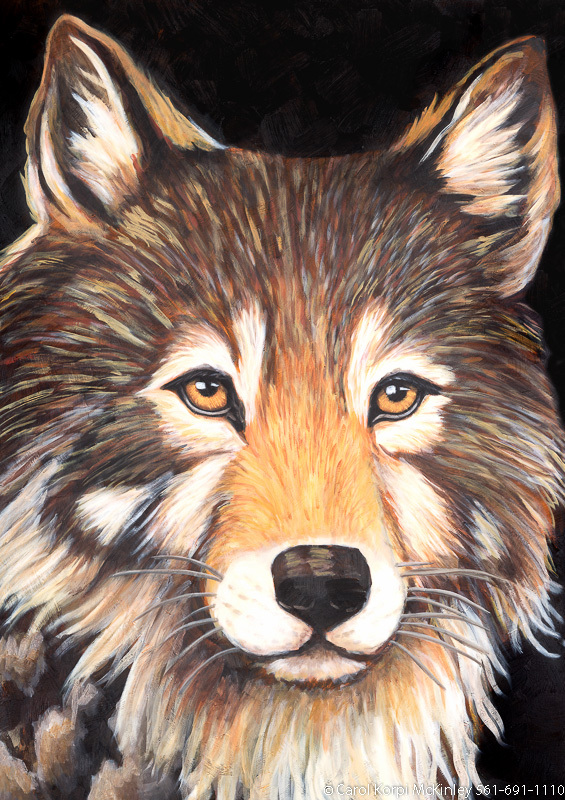 Wolf #BBB-096, Original Acrylic on Canvas: 48 x 68 inches, Sold; Stretched and Gallery Wrapped Limited Edition Archival Print on Canvas: 40 x 56 inches $1590-. Custom sizes, colors, and commissions are also available. For more information or to order, please visit our ABOUT page or call us at 561-691-1110. 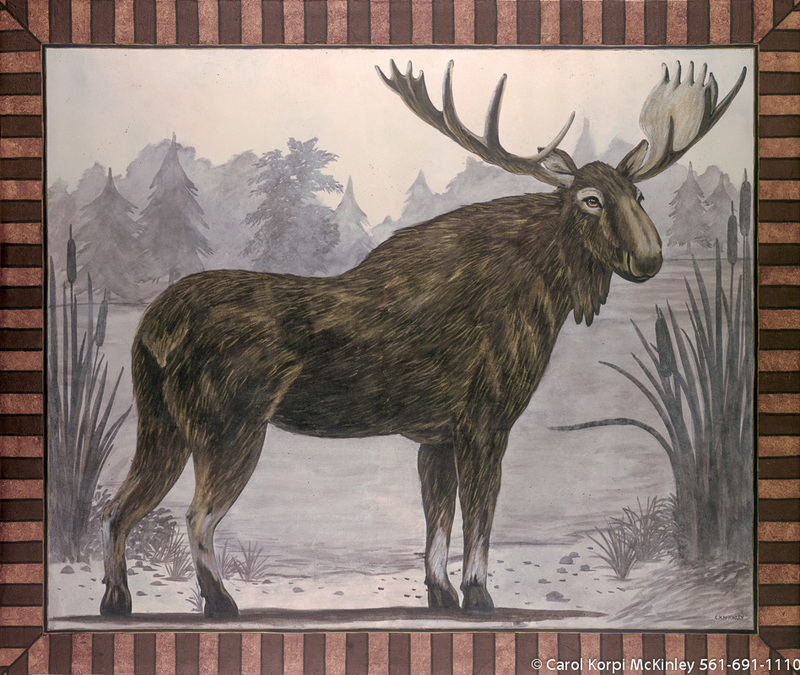 Moose #BBB-113, Original Acrylic on Canvas: 96 x 120 inches $8600; Stretched and Gallery Wrapped Limited Edition Archival Print on Canvas: 40 x 50 inches $1560. Custom sizes, colors, and commissions are also available. For more information or to order, please visit our ABOUT page or call us at 561-691-1110. 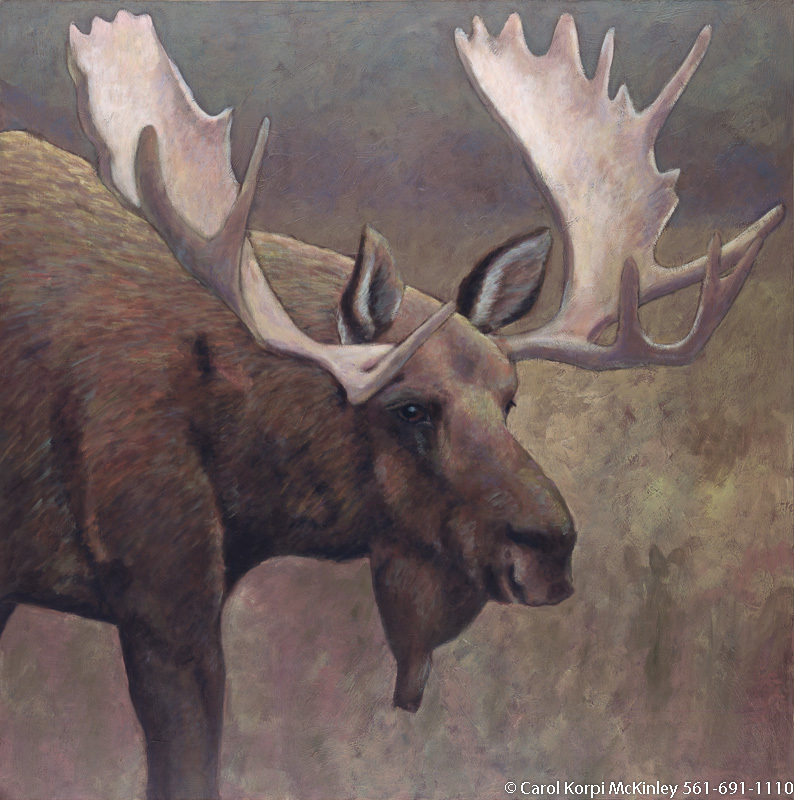 Moose #BBB-106, Original Acrylic on Canvas: 65 x 65 inches $8100-, Sold; Stretched and Gallery Wrapped Limited Edition Archival Print on Canvas: 40 x 40 inches $1500-. Custom sizes, colors, and commissions are also available. For more information or to order, please visit our ABOUT page or call us at 561-691-1110. 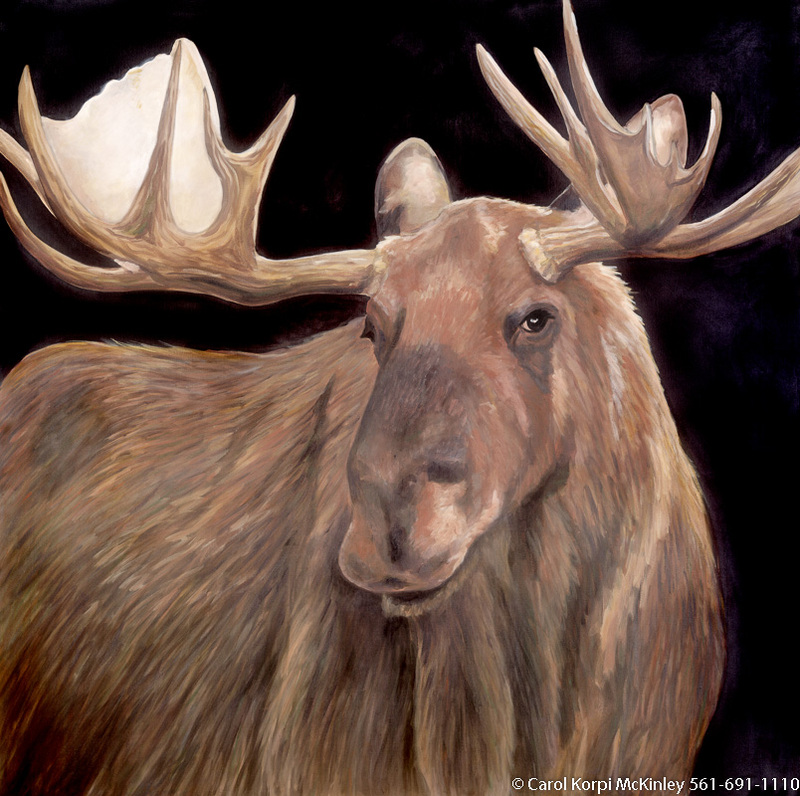 Moose #BBB-097, Original Acrylic on Canvas: x inches, Sold; Stretched and Gallery Wrapped Limited Edition Archival Print on Canvas: 40 x 40 inches $1500-. Custom sizes, colors, and commissions are also available. For more information or to order, please visit our ABOUT page or call us at 561-691-1110. 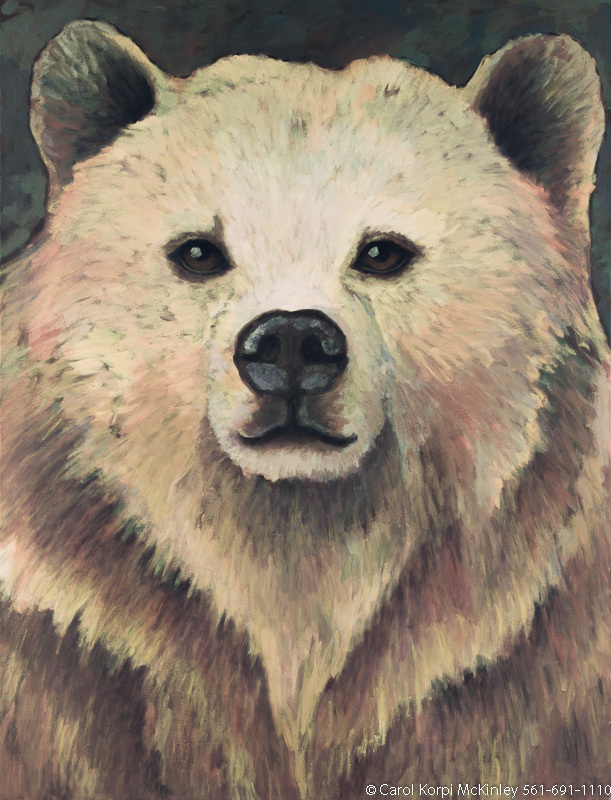 Bear #BBB-104, Original Acrylic on Canvas: 48 x 68 inches $5400-, Sold; Stretched and Gallery Wrapped Limited Edition Archival Print on Canvas: 40 x 56 inches $1590-. Custom sizes, colors, and commissions are also available. For more information or to order, please visit our ABOUT page or call us at 561-691-1110. 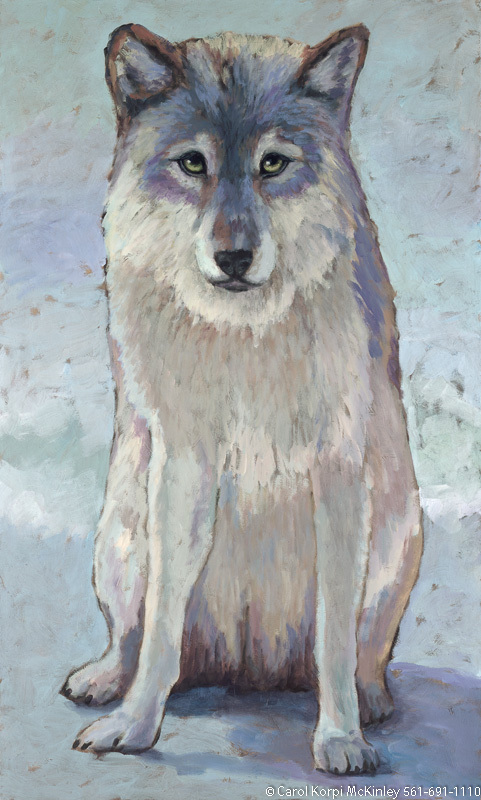 Wolf #BBB-108, Original Acrylic on Canvas: 36 x 60 inches $5700; Stretched and Gallery Wrapped Limited Edition Archival Print on Canvas: 36 x 60 inches $1590. Custom sizes, colors, and commissions are also available. For more information or to order, please visit our ABOUT page or call us at 561-691-1110. 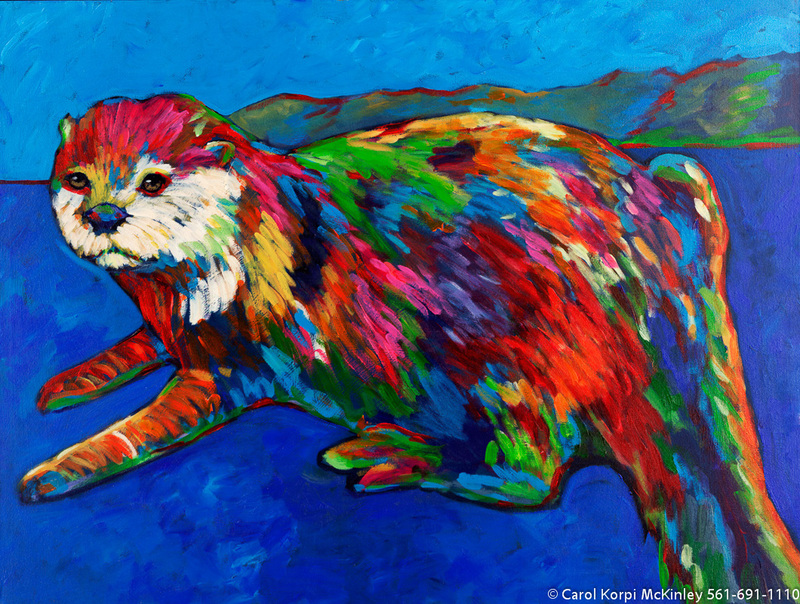 Otter #ANF-052, Original Acrylic on Canvas: 30 x 40 inches $4200; Stretched and Gallery Wrapped Limited Edition Archival Print on Canvas: 40 x 56 inches $1590. Custom sizes, colors, and commissions are also available. For more information or to order, please visit our ABOUT page or call us at 561-691-1110. 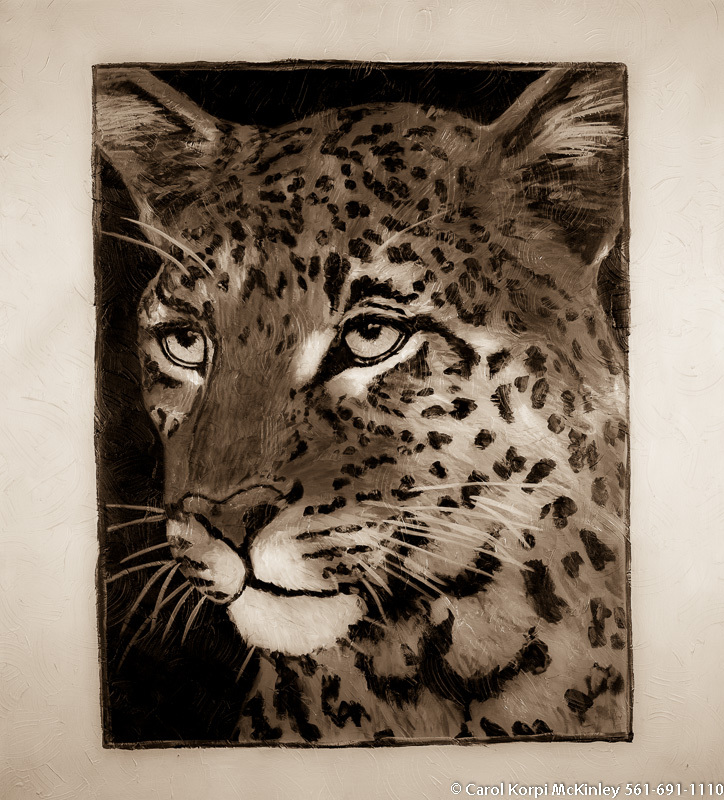 Leopard #BBB-077, Original Acrylic on Canvas: 68 x 72 inches $11700; Stretched and Gallery Wrapped Limited Edition Archival Print on Canvas: 40 x 44 inches $1530. Custom sizes, colors, and commissions are also available. For more information or to order, please visit our ABOUT page or call us at 561-691-1110. Leopard #BBB-070, Original Acrylic on Canvas: 65 x 72 inches $11700; Stretched and Gallery Wrapped Limited Edition Archival Print on Canvas: 40 x 44 inches $1530. Custom sizes, colors, and commissions are also available. For more information or to order, please visit our ABOUT page or call us at 561-691-1110. 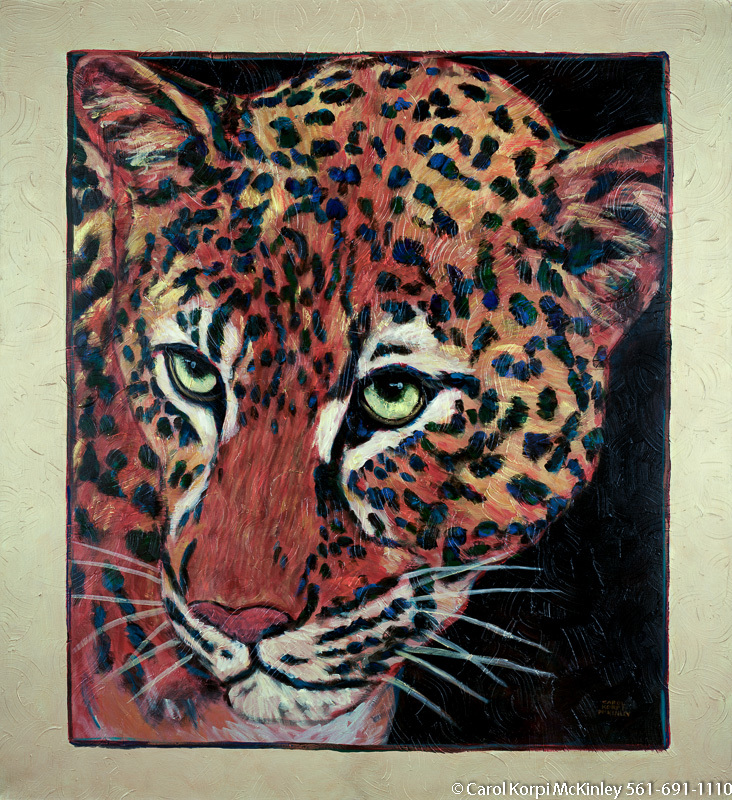 Leopard #BBB-072, Original Acrylic on Canvas: 65 x 72 inches $11700; Stretched and Gallery Wrapped Limited Edition Archival Print on Canvas: 40 x 44 inches $1530. Custom sizes, colors, and commissions are also available. For more information or to order, please visit our ABOUT page or call us at 561-691-1110. 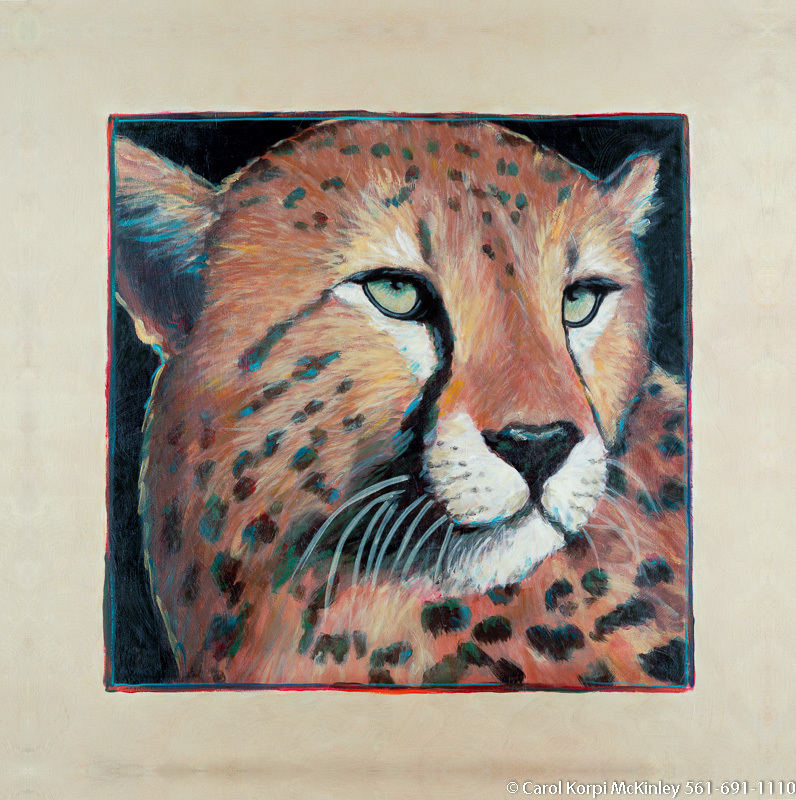 Cheetah #BBB-095, Original Acrylic on Canvas: 54 x 54 inches $8100; Stretched and Gallery Wrapped Limited Edition Archival Print on Canvas: 40 x 40 inches $1500. Custom sizes, colors, and commissions are also available. For more information or to order, please visit our ABOUT page or call us at 561-691-1110. 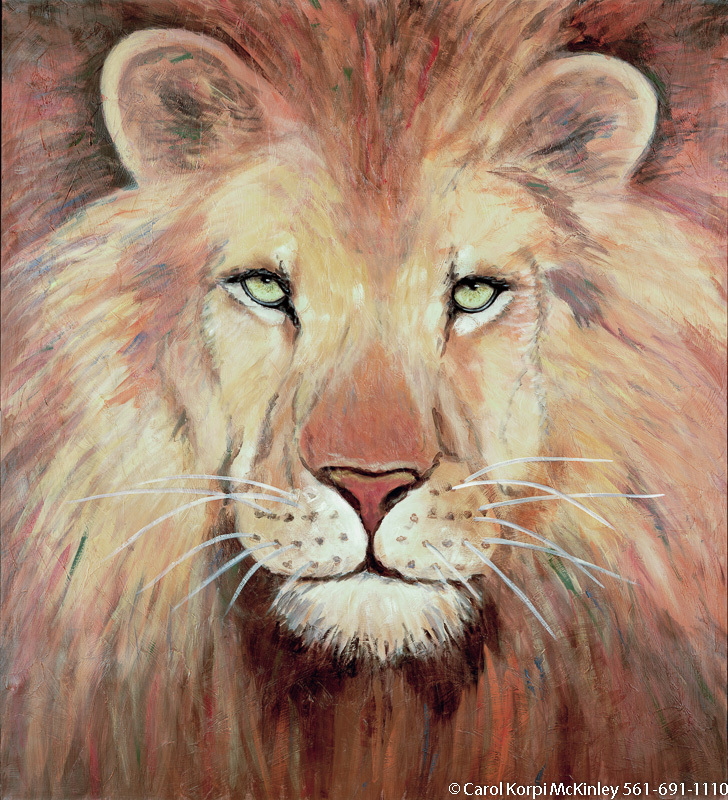 Lion #BBB-016, Original Acrylic on Canvas: 65 x 72 inches $11700; Stretched and Gallery Wrapped Limited Edition Archival Print on Canvas: 40 x 44 inches $1530. Custom sizes, colors, and commissions are also available. For more information or to order, please visit our ABOUT page or call us at 561-691-1110. 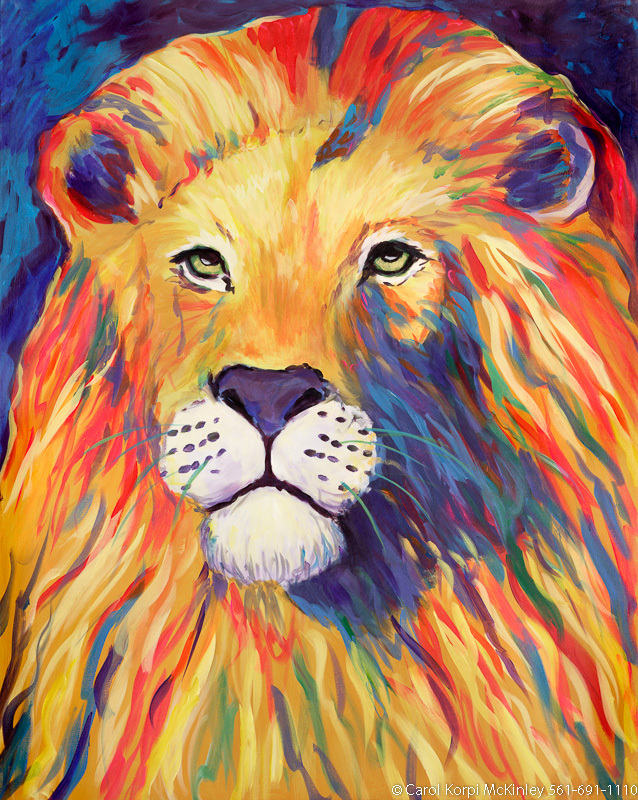 Lion #BBB-018, Original Acrylic on Canvas: 65 x 72 inches $11700; Stretched and Gallery Wrapped Limited Edition Archival Print on Canvas: 40 x 44 inches $1530. Custom sizes, colors, and commissions are also available. For more information or to order, please visit our ABOUT page or call us at 561-691-1110. 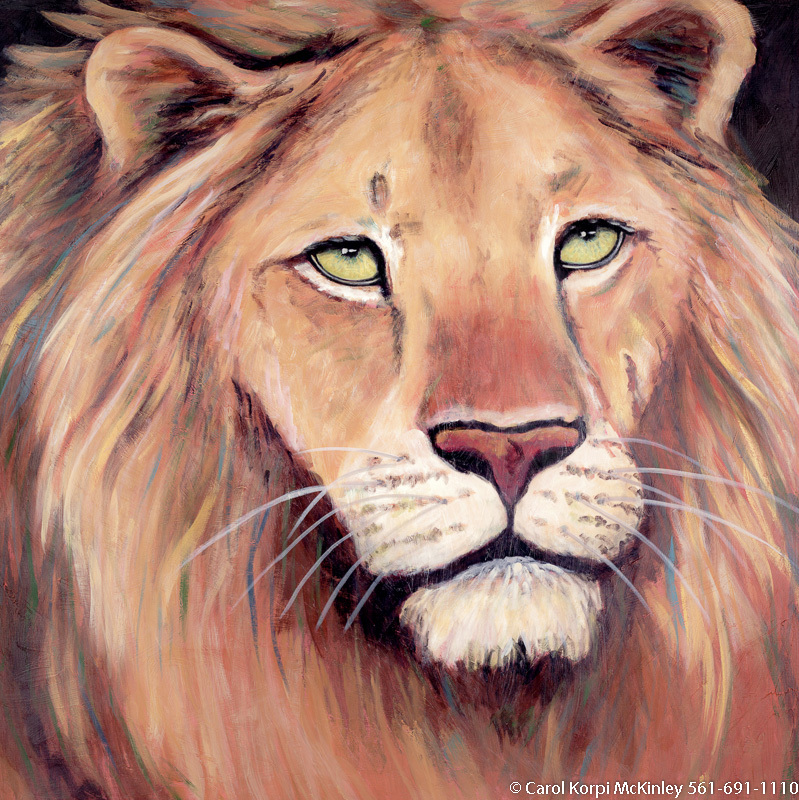 Lion #BBB-020, Original Acrylic on Canvas: 65 x 65 inches $11700; Stretched and Gallery Wrapped Limited Edition Archival Print on Canvas: 40 x 40 inches $1500. Custom sizes, colors, and commissions are also available. For more information or to order, please visit our ABOUT page or call us at 561-691-1110. 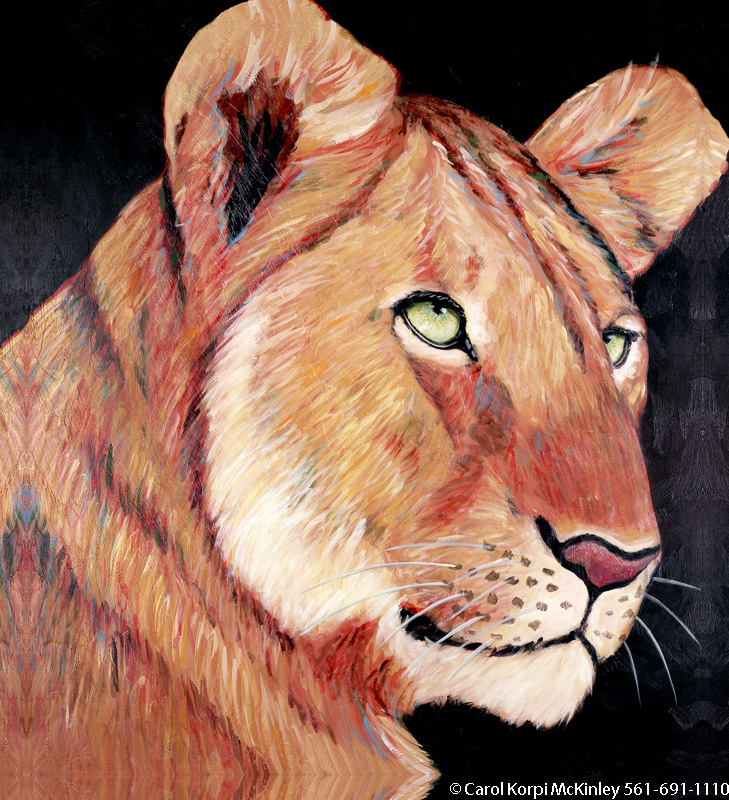 Lioness #BBB-069, Original Acrylic on Canvas: 65 x 72 inches $11700; Stretched and Gallery Wrapped Limited Edition Archival Print on Canvas: 40 x 44 inches $1530. Custom sizes, colors, and commissions are also available. For more information or to order, please visit our ABOUT page or call us at 561-691-1110. 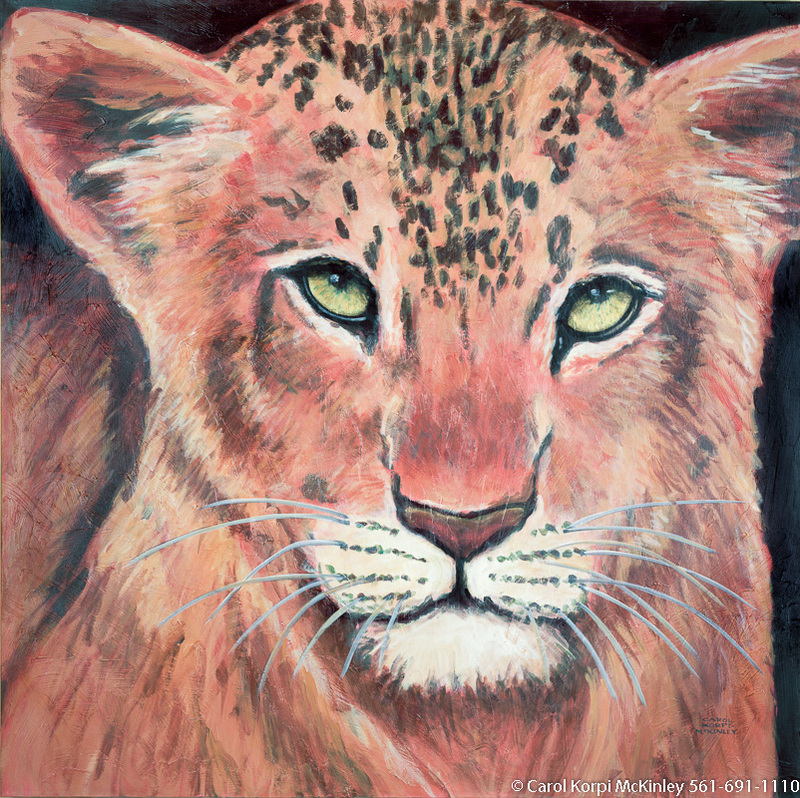 Baby Lion #BBB-015, Original Acrylic on Canvas: 65 x 65 inches $11400; Stretched and Gallery Wrapped Limited Edition Archival Print on Canvas: 40 x 40 inches $1500. Custom sizes, colors, and commissions are also available. For more information or to order, please visit our ABOUT page or call us at 561-691-1110. 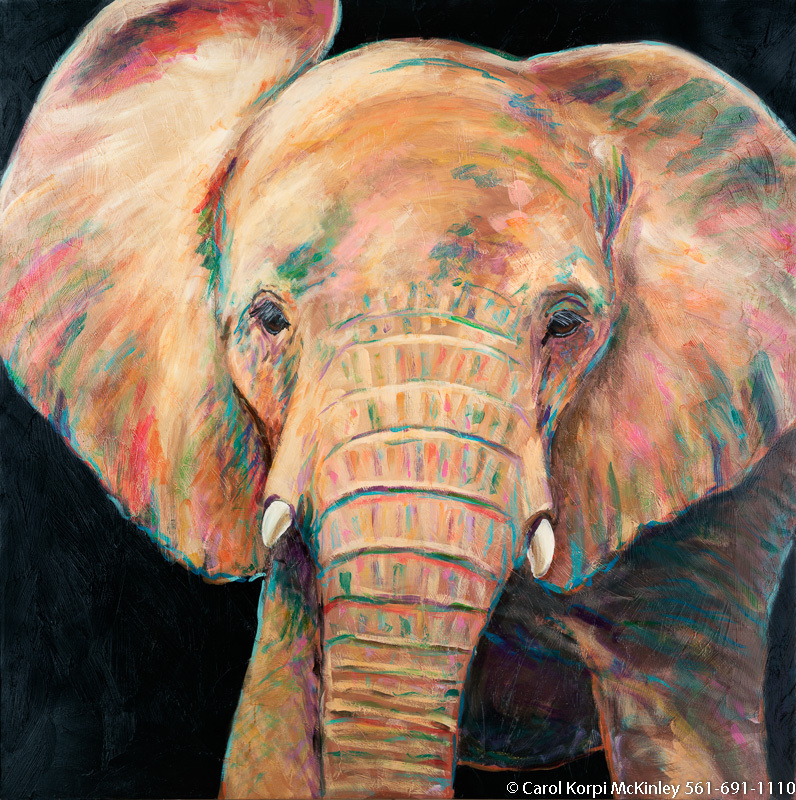 Elephant #BBB-081, Original Acrylic on Canvas: 65 x 65 inches $11700; Stretched and Gallery Wrapped Limited Edition Archival Print on Canvas: 40 x 40 inches $1500. Custom sizes, colors, and commissions are also available. For more information or to order, please visit our ABOUT page or call us at 561-691-1110. 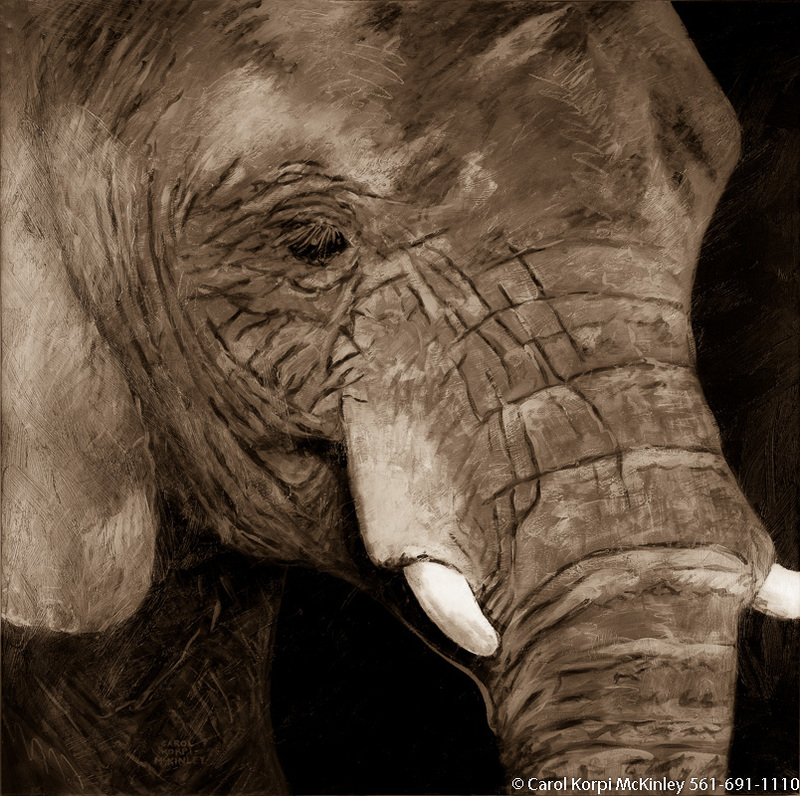 Elephant #BBB-083, Original Acrylic on Canvas: 65 x 65 inches $11700; Stretched and Gallery Wrapped Limited Edition Archival Print on Canvas: 40 x 40 inches $1500. 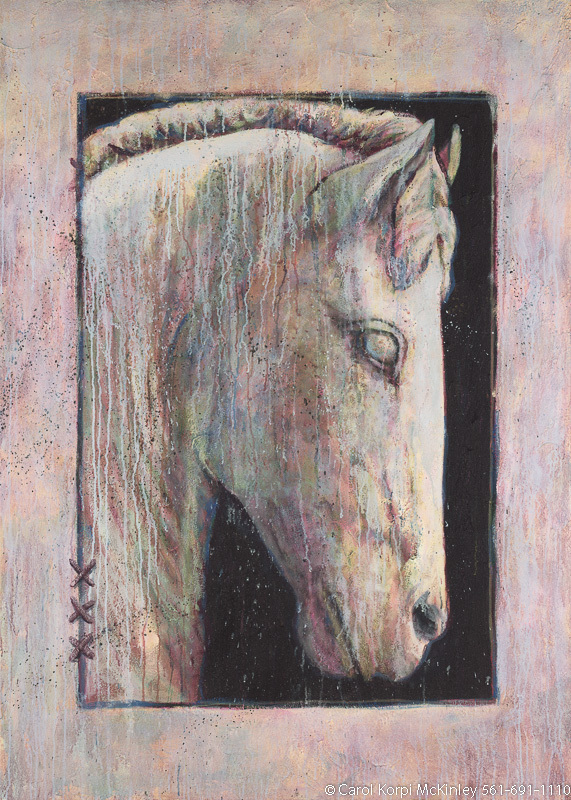 Custom sizes, colors, and commissions are also available. For more information or to order, please visit our ABOUT page or call us at 561-691-1110. 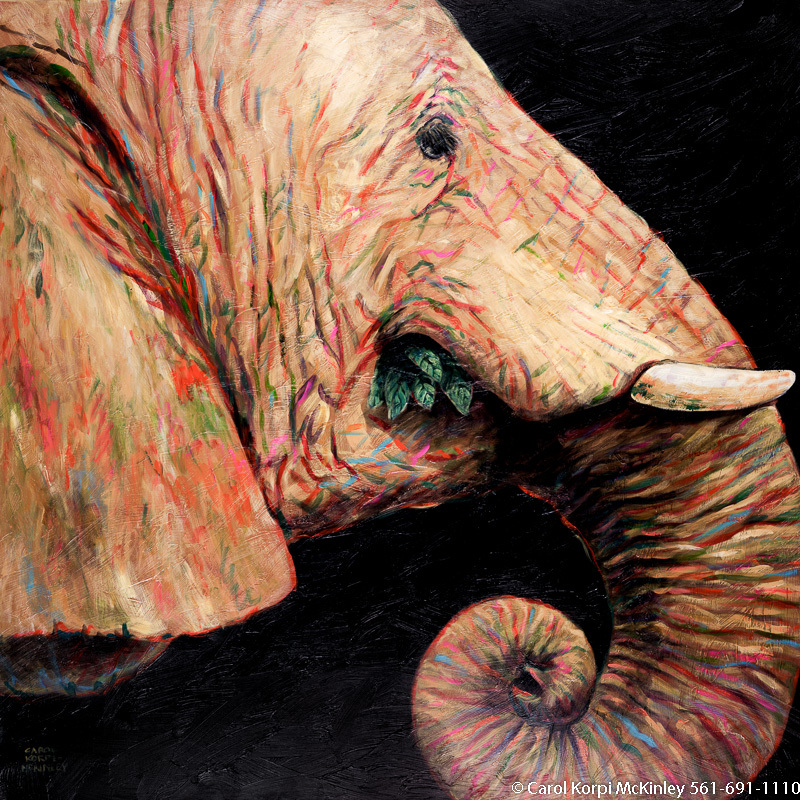 Elephant #BBB-004, Original Acrylic on Canvas: 68 x 72 inches $11700; Stretched and Gallery Wrapped Limited Edition Archival Print on Canvas: 40 x 44 inches $1530. Custom sizes, colors, and commissions are also available. For more information or to order, please visit our ABOUT page or call us at 561-691-1110. 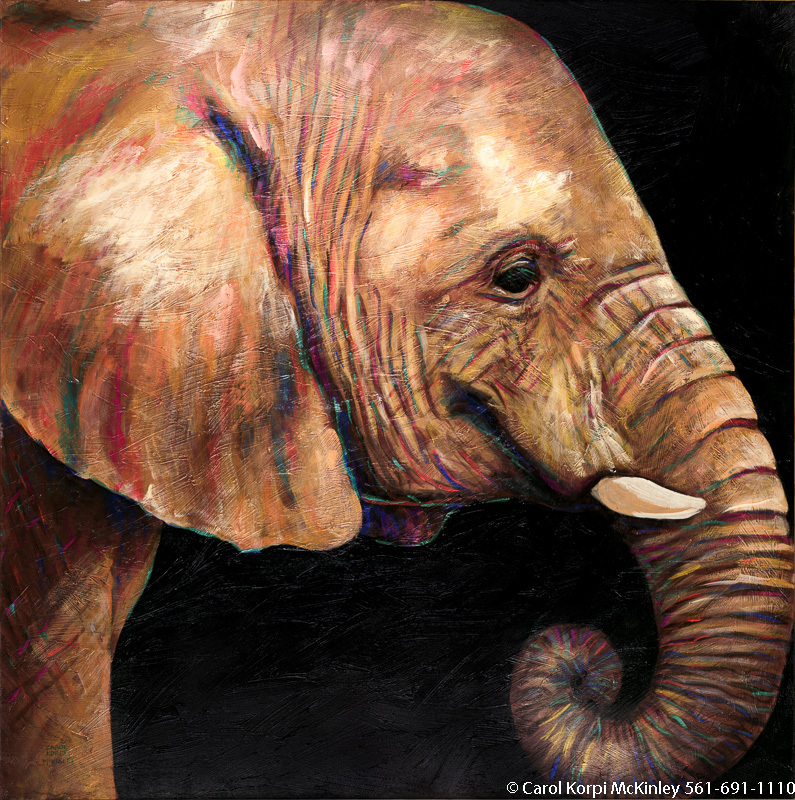 Elephant #BBB-080, Original Acrylic on Canvas: 65 x 65 inches $11700; Stretched and Gallery Wrapped Limited Edition Archival Print on Canvas: 40 x 40 inches $1500. Custom sizes, colors, and commissions are also available. For more information or to order, please visit our ABOUT page or call us at 561-691-1110. 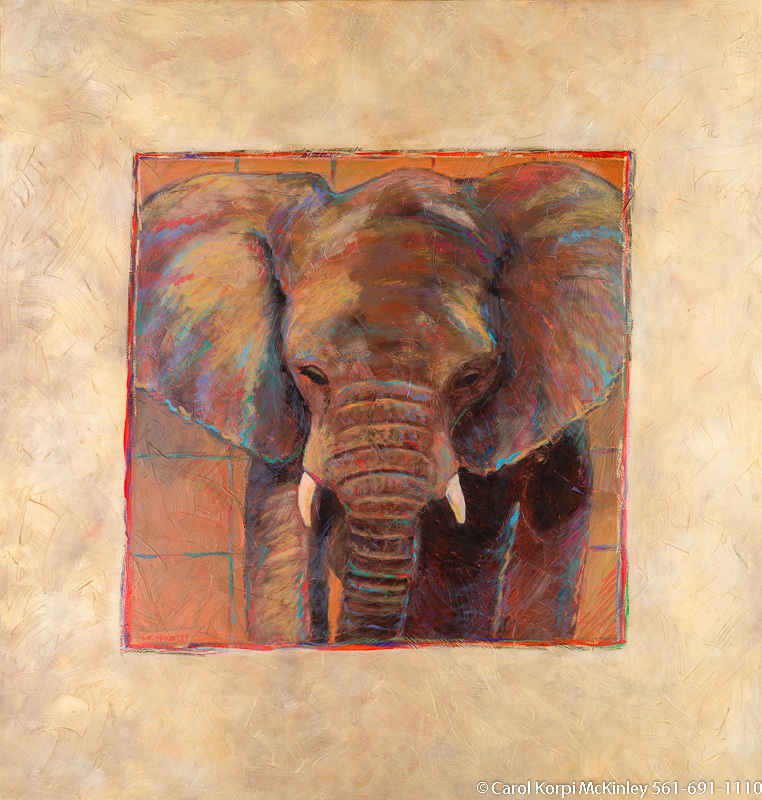 Elephant #BBB-079, Original Acrylic on Canvas: 65 x 65 inches $11700; Stretched and Gallery Wrapped Limited Edition Archival Print on Canvas: 40 x 40 inches $1500. Custom sizes, colors, and commissions are also available. For more information or to order, please visit our ABOUT page or call us at 561-691-1110. 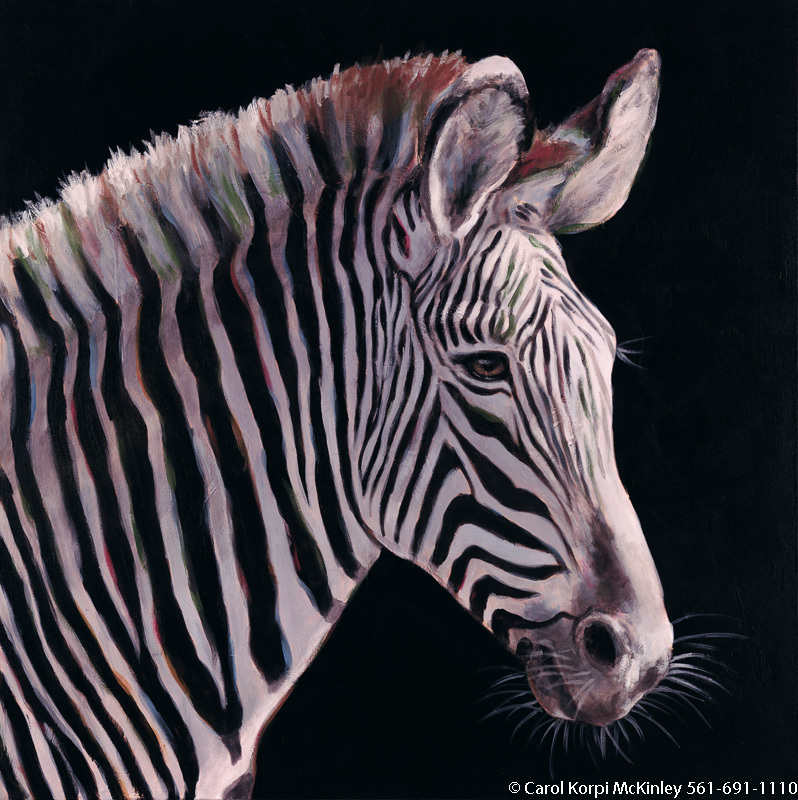 Zebra #BBB-101, Original Acrylic on Canvas: 40 x 40 inches, Sold; Stretched and Gallery Wrapped Limited Edition Archival Print on Canvas: 40 x 40 inches $1500-. Custom sizes, colors, and commissions are also available. For more information or to order, please visit our ABOUT page or call us at 561-691-1110. 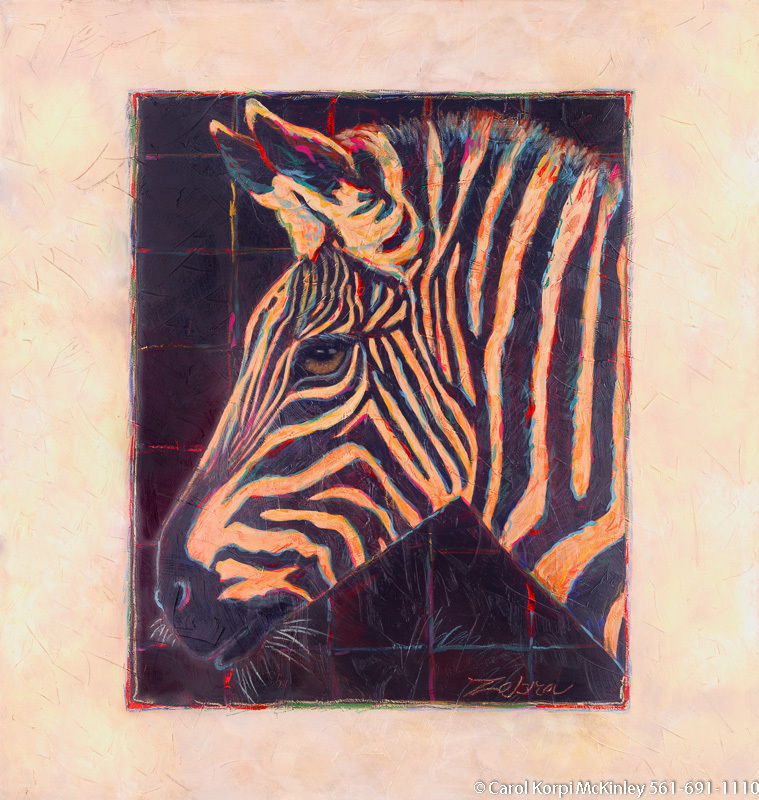 Zebra #BBB-099, Original Acrylic on Canvas: 65 x 65 inches $11700; Stretched and Gallery Wrapped Limited Edition Archival Print on Canvas: 40 x 40 inches $1500. Custom sizes, colors, and commissions are also available. For more information or to order, please visit our ABOUT page or call us at 561-691-1110. 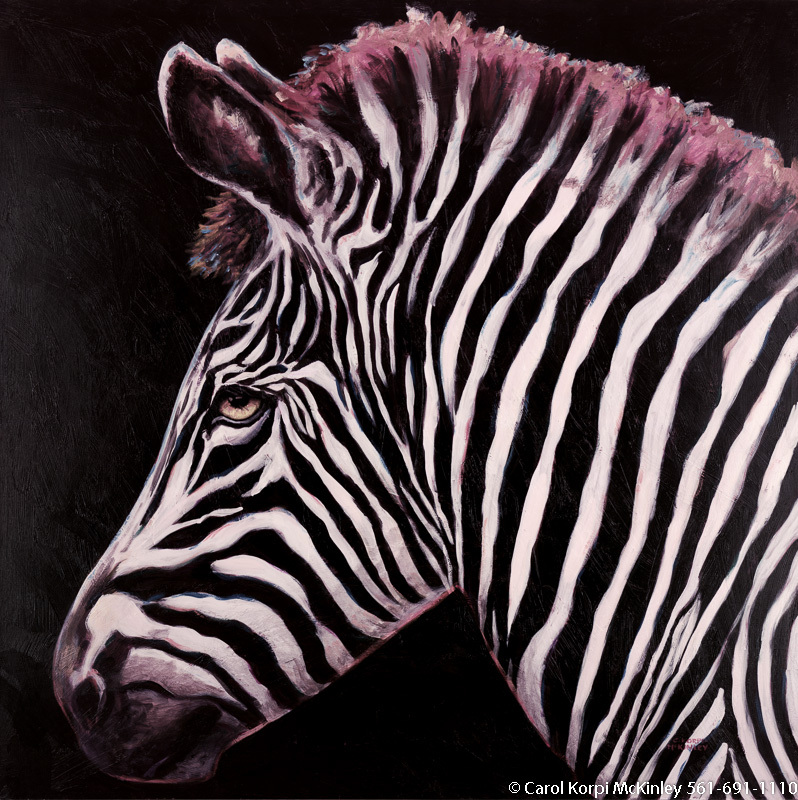 Zebra #BBB-002, Original Acrylic on Canvas: 68 x 72 inches $11700; Stretched and Gallery Wrapped Limited Edition Archival Print on Canvas: 40 x 44 inches $1530. Custom sizes, colors, and commissions are also available. For more information or to order, please visit our ABOUT page or call us at 561-691-1110. 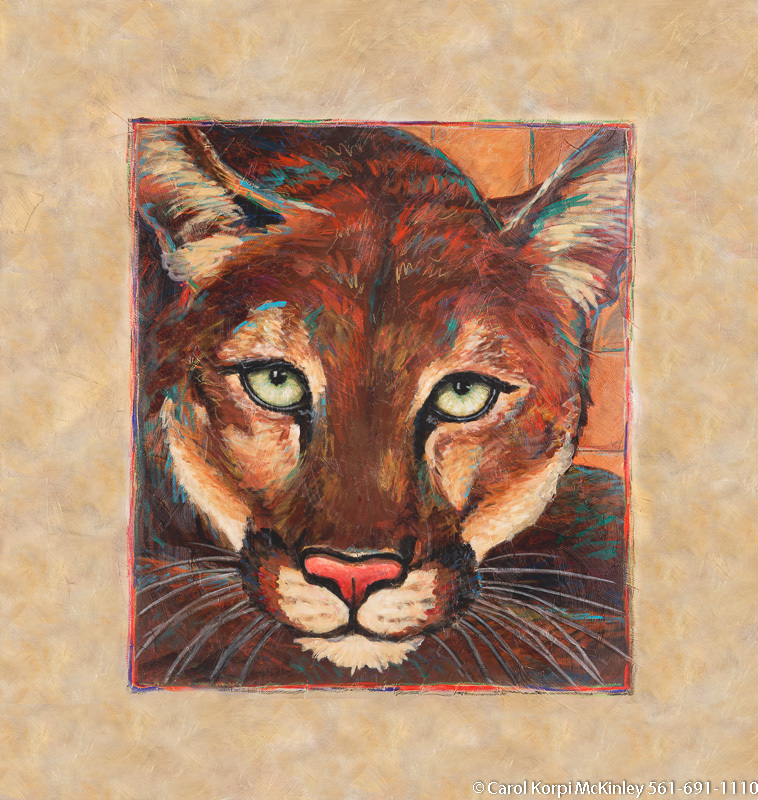 Panther #BBB-001, Original Acrylic on Canvas: 68 x 72 inches $11700; Stretched and Gallery Wrapped Limited Edition Archival Print on Canvas: 40 x 44 inches $1530. Custom sizes, colors, and commissions are also available. For more information or to order, please visit our ABOUT page or call us at 561-691-1110. 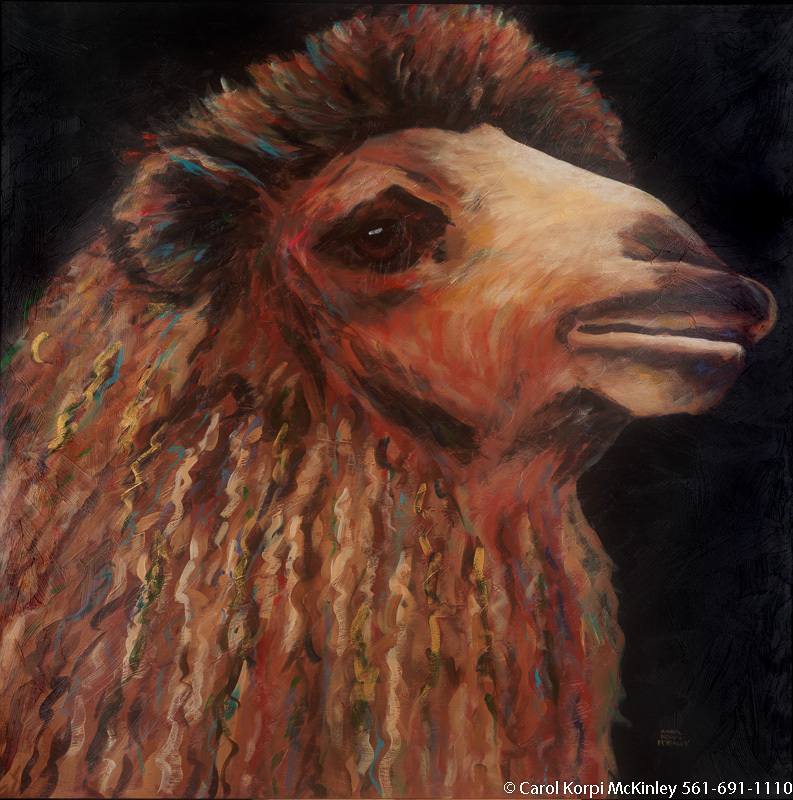 Camel #BBB-088, Original Acrylic on Canvas: 65 x 65 inches $11700; Stretched and Gallery Wrapped Limited Edition Archival Print on Canvas: 40 x 40 inches $1500. Custom sizes, colors, and commissions are also available. For more information or to order, please visit our ABOUT page or call us at 561-691-1110. 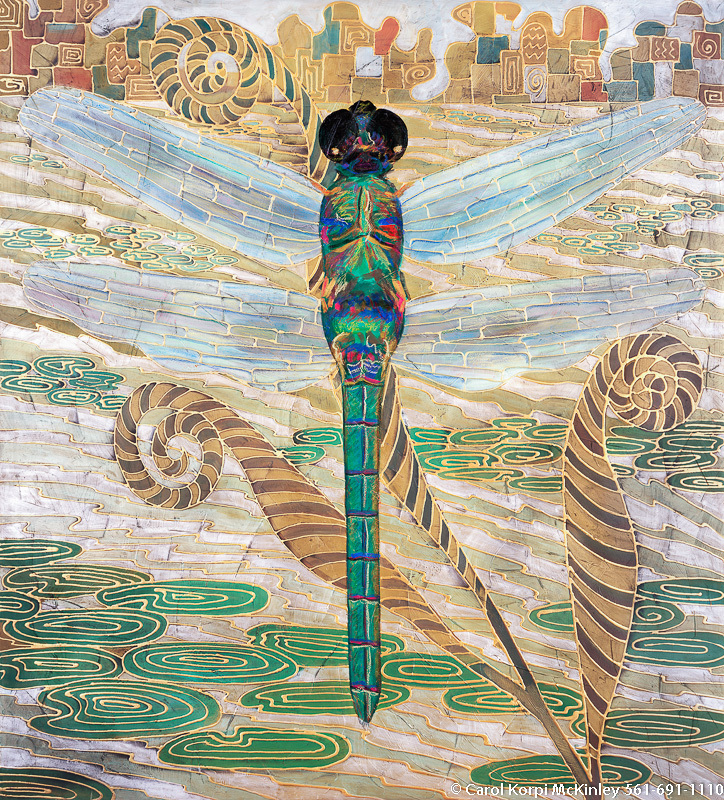 Dragonfly #MSC-004, Original Acrylic on Canvas: 65 x 72 inches $9300; Stretched and Gallery Wrapped Limited Edition Archival Print on Canvas: 40 x 44 inches $1530. Custom sizes, colors, and commissions are also available. For more information or to order, please visit our ABOUT page or call us at 561-691-1110. 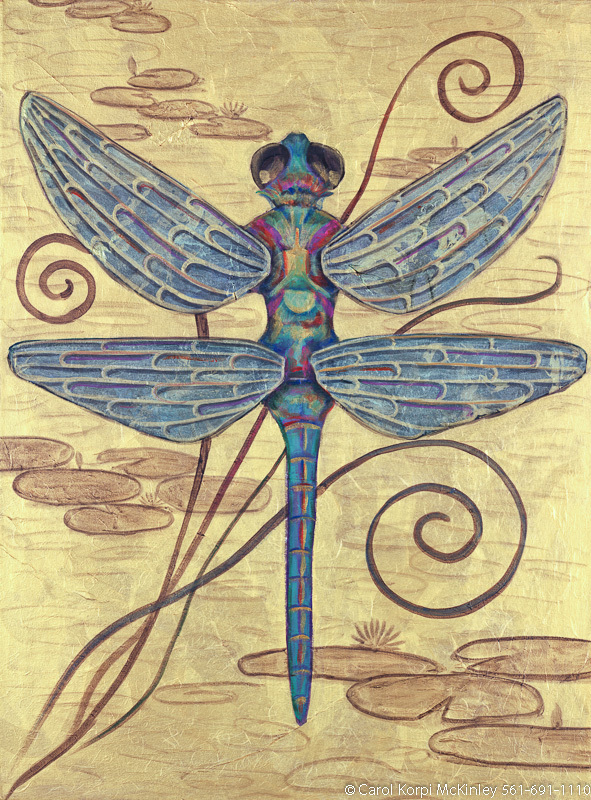 Dragonfly #MSC-051, Original Acrylic on Canvas: 30 x 40 inches $3300; Stretched and Gallery Wrapped Limited Edition Archival Print on Canvas: 40 x 56 inches $1590. Custom sizes, colors, and commissions are also available. For more information or to order, please visit our ABOUT page or call us at 561-691-1110. 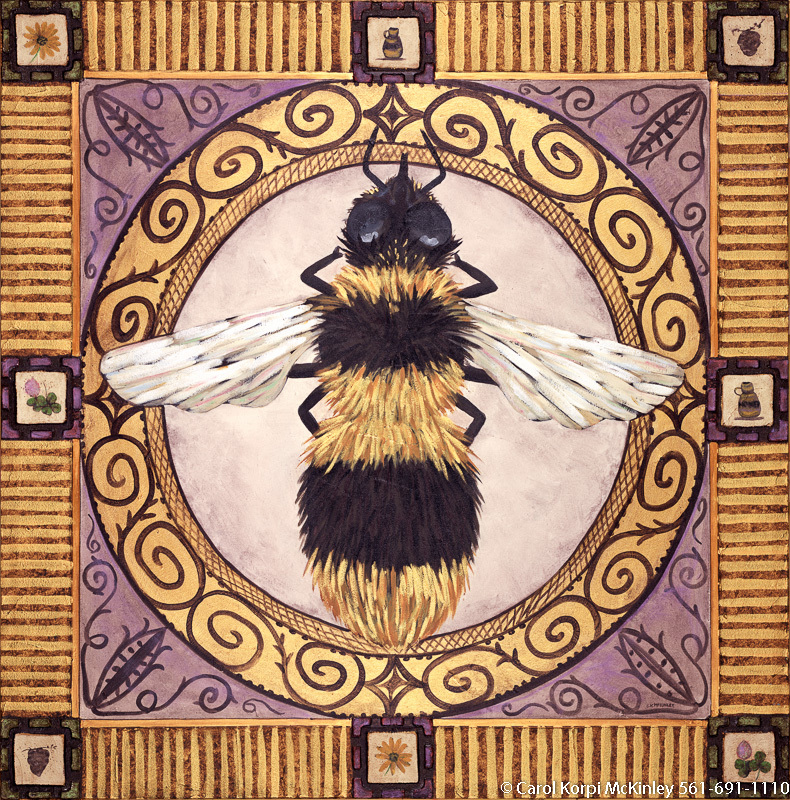 Bee #FBI-012, Original Acrylic on Canvas: 65 x 65 inches $3750; Stretched and Gallery Wrapped Limited Edition Archival Print on Canvas: 40 x 40 inches $1500. Custom sizes, colors, and commissions are also available. For more information or to order, please visit our ABOUT page or call us at 561-691-1110. 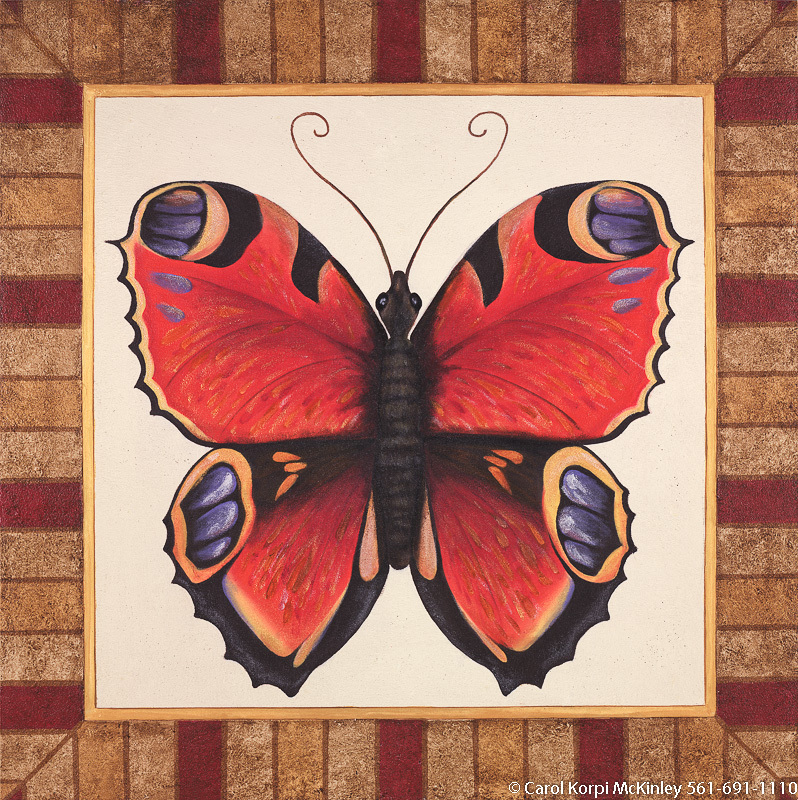 Butterfly #FBI-015, Original Acrylic on Canvas: 48 x 48 inches $2700; Stretched and Gallery Wrapped Limited Edition Archival Print on Canvas: 40 x 40 inches $1500. Custom sizes, colors, and commissions are also available. For more information or to order, please visit our ABOUT page or call us at 561-691-1110. 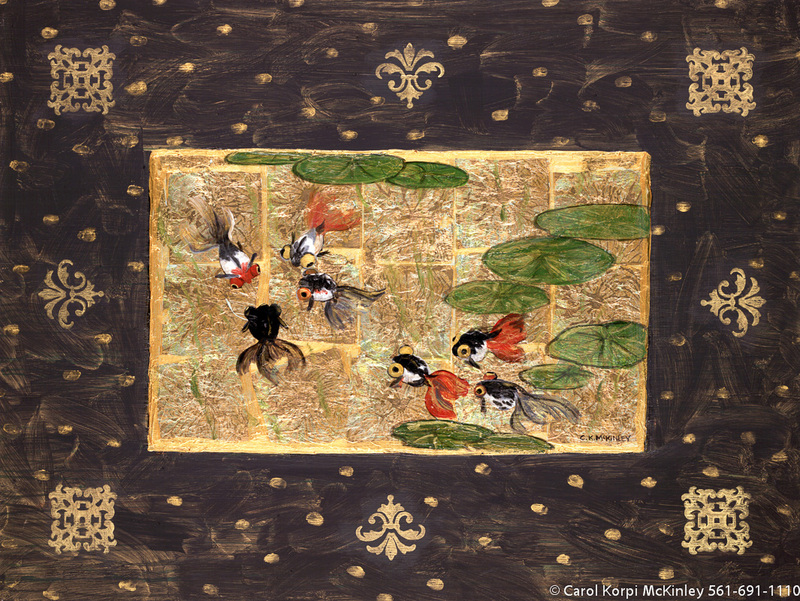 Goldfish Pond #MSC-052, Original Acrylic on Canvas: 36 x 48 inches $3600; Stretched and Gallery Wrapped Limited Edition Archival Print on Canvas: 40 x 56 inches $1590. Custom sizes, colors, and commissions are also available. For more information or to order, please visit our ABOUT page or call us at 561-691-1110. 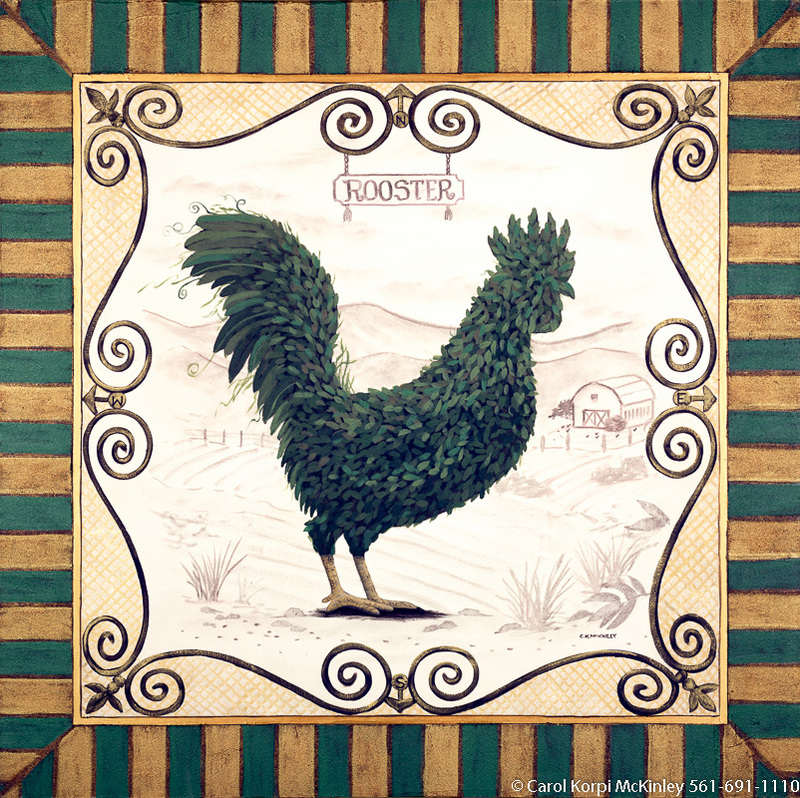 Rooster Topiary #FTO-009, Original Acrylic on Canvas: 65 x 65 inches $4200; Stretched and Gallery Wrapped Limited Edition Archival Print on Canvas: 40 x 40 inches $1500. Custom sizes, colors, and commissions are also available. For more information or to order, please visit our ABOUT page or call us at 561-691-1110. 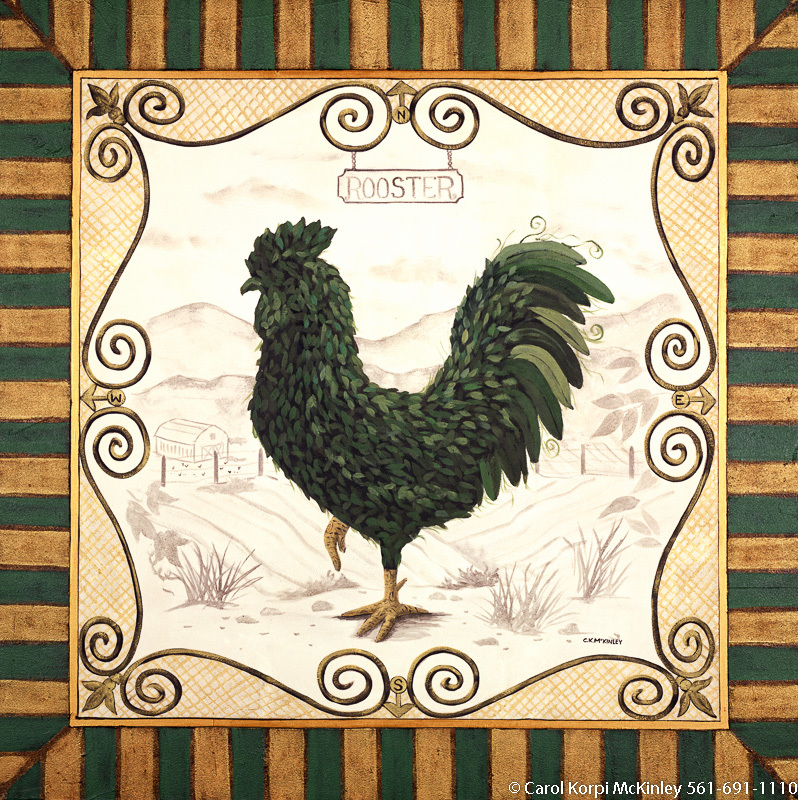 Rooster Topiary #FTO-010, Original Acrylic on Canvas: 65 x 65 inches $4200; Stretched and Gallery Wrapped Limited Edition Archival Print on Canvas: 40 x 40 inches $1500. Custom sizes, colors, and commissions are also available. For more information or to order, please visit our ABOUT page or call us at 561-691-1110. 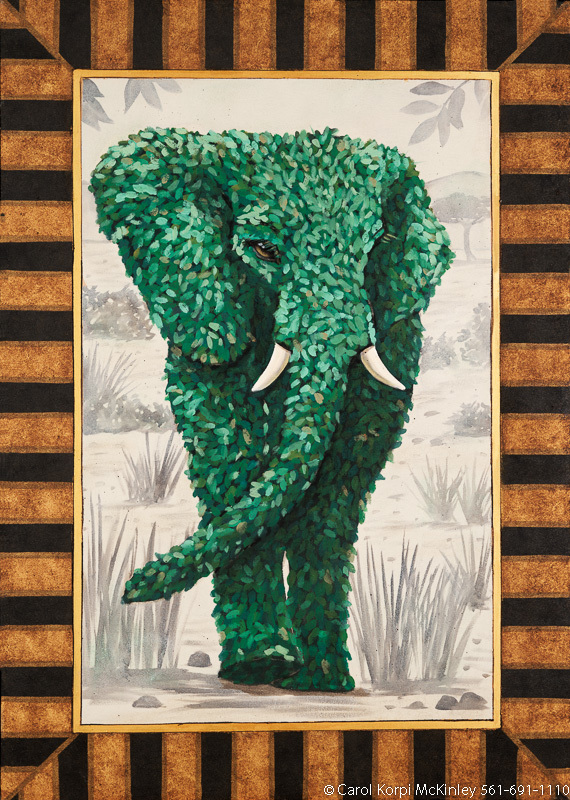 Elephant Topiary #FTO-007, Original Acrylic on Canvas: 48 x 68 inches $2175; Stretched and Gallery Wrapped Limited Edition Archival Print on Canvas: 40 x 56 inches $1590. Custom sizes, colors, and commissions are also available. For more information or to order, please visit our ABOUT page or call us at 561-691-1110. 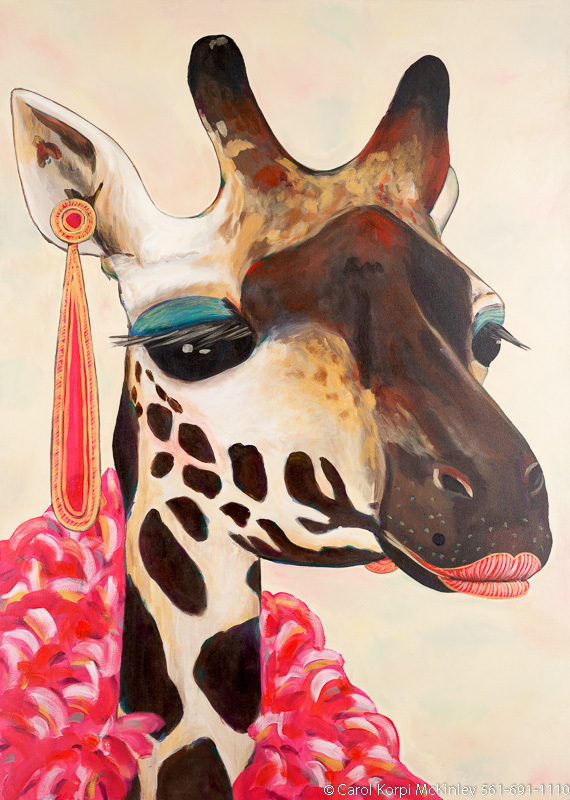 Giraffe #FTO-008, Original Acrylic on Canvas: 48 x 68 inches $2175; Stretched and Gallery Wrapped Limited Edition Archival Print on Canvas: 40 x 56 inches $1590. Custom sizes, colors, and commissions are also available. For more information or to order, please visit our ABOUT page or call us at 561-691-1110. 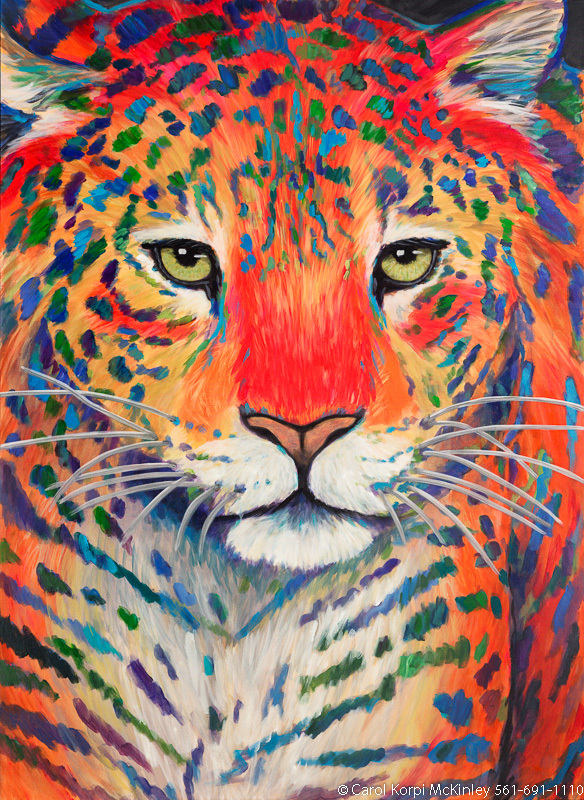 Leopard Tapestry #TAP-004, Original Acrylic on Canvas: 36 x 48 inches $3600; Stretched and Gallery Wrapped Limited Edition Archival Print on Canvas: 40 x 56 inches $1590. 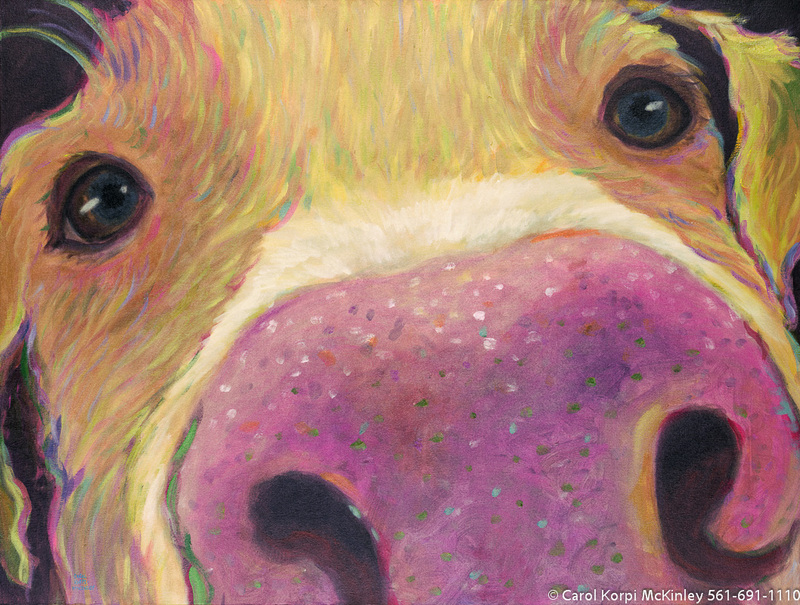 Custom sizes, colors, and commissions are also available. For more information or to order, please visit our ABOUT page or call us at 561-691-1110. 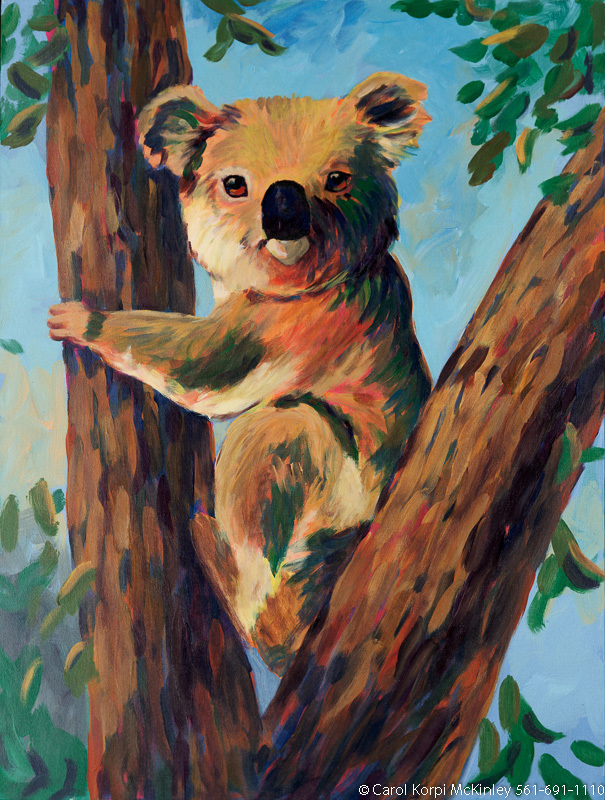 Koala #ANF-013, Original Acrylic on Canvas: 30 x 40 inches $5100; Stretched and Gallery Wrapped Limited Edition Archival Print on Canvas: 40 x 56 inches $1590. Custom sizes, colors, and commissions are also available. For more information or to order, please visit our ABOUT page or call us at 561-691-1110. 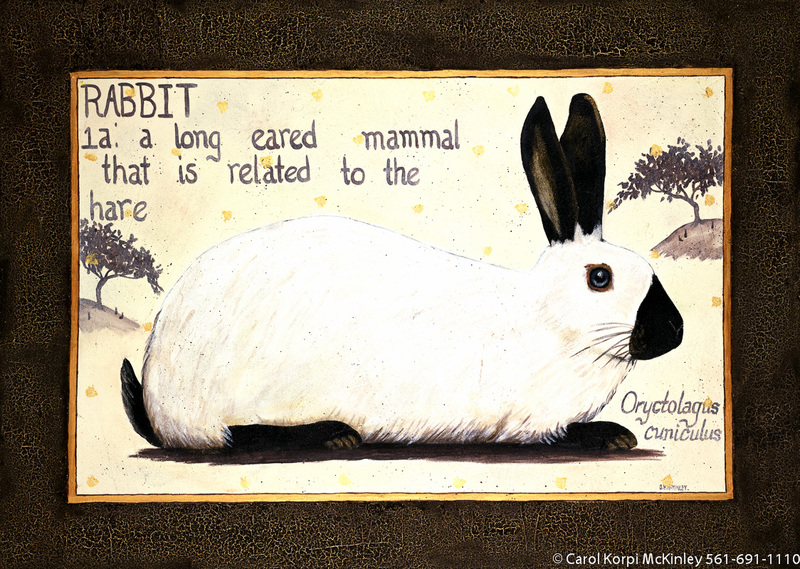 Rabbit #ANF-015, Original Acrylic on Canvas: 48 x 60 inches $10200; Stretched and Gallery Wrapped Limited Edition Archival Print on Canvas: 40 x 50 inches $1560. Custom sizes, colors, and commissions are also available. For more information or to order, please visit our ABOUT page or call us at 561-691-1110. 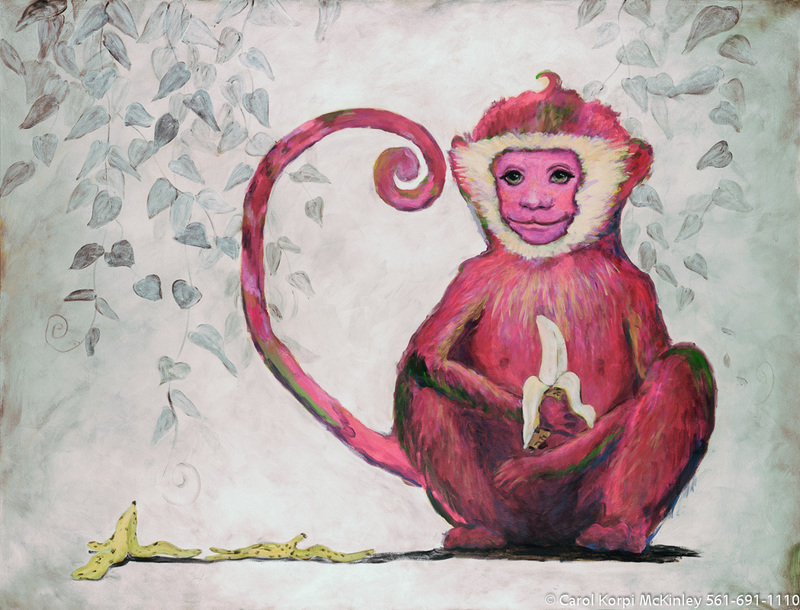 Pink Monkey #ANF-069, Original Acrylic on Canvas: 72 x 96 inches (Unstretched Size) $8100; Stretched and Gallery Wrapped Limited Edition Archival Print on Canvas: 40 x 56 inches $1590. Custom sizes, colors, and commissions are also available. For more information or to order, please visit our ABOUT page or call us at 561-691-1110. 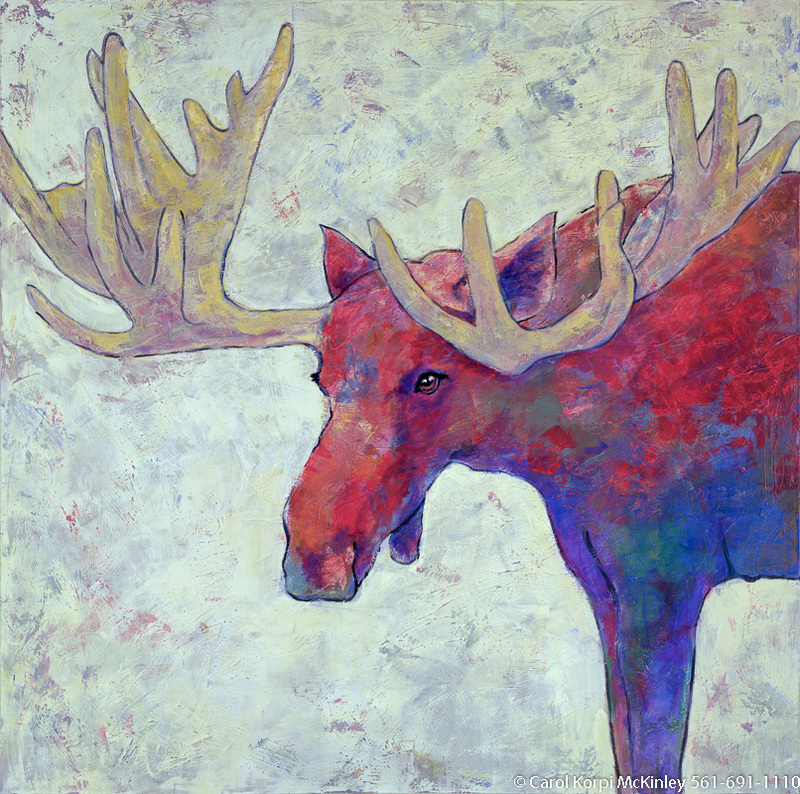 Red Moose #ANF-083, Original Acrylic on Canvas: 65 x 65 inches $7800; Stretched and Gallery Wrapped Limited Edition Archival Print on Canvas: 40 x 40 inches $1500. Custom sizes, colors, and commissions are also available. For more information or to order, please visit our ABOUT page or call us at 561-691-1110. 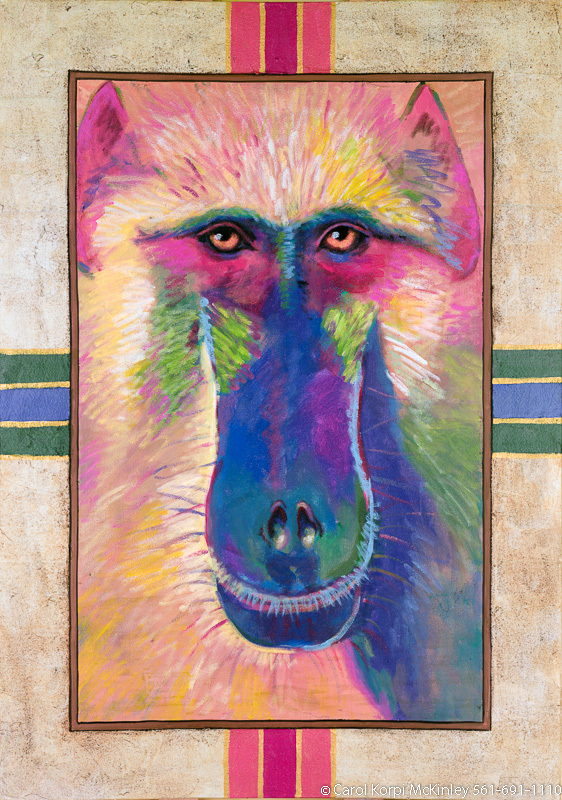 Baboon #ANF-075, Original Acrylic on Canvas: 48 x 68 inches $4500; Stretched and Gallery Wrapped Limited Edition Archival Print on Canvas: 40 x 56 inches $1590. Custom sizes, colors, and commissions are also available. For more information or to order, please visit our ABOUT page or call us at 561-691-1110. 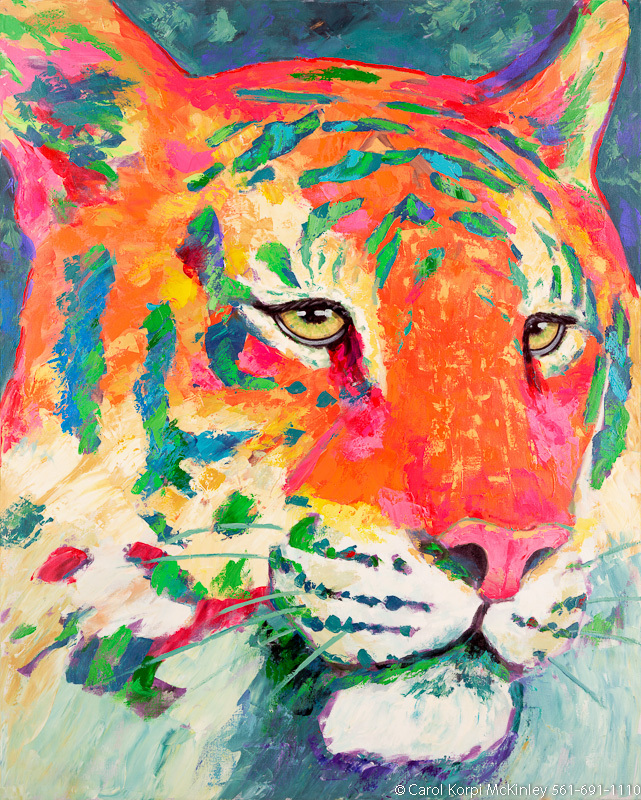 Tiger #BBB-009, Original Acrylic on Canvas: 48 x 60 inches $8100; Stretched and Gallery Wrapped Limited Edition Archival Print on Canvas: 40 x 50 inches $1560. Custom sizes, colors, and commissions are also available. For more information or to order, please visit our ABOUT page or call us at 561-691-1110. 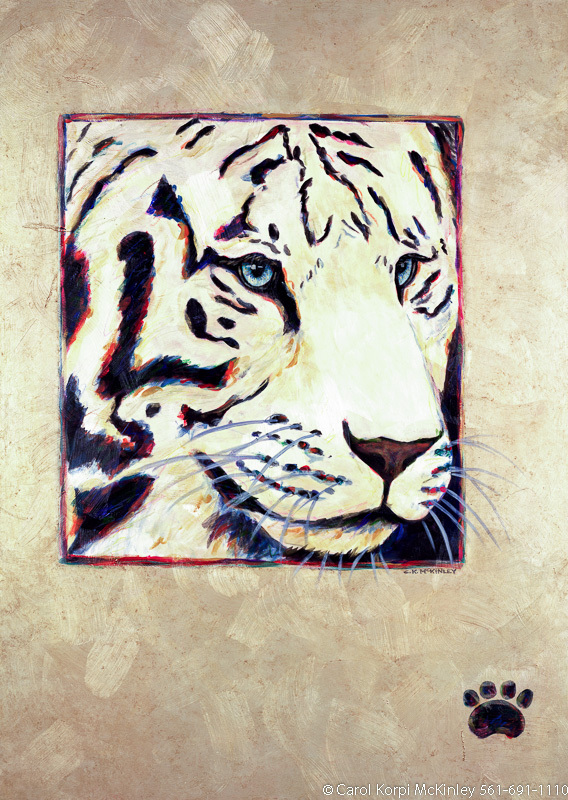 Tiger #BBB-011, Original Acrylic on Canvas: 48 x 68 inches $8700; Stretched and Gallery Wrapped Limited Edition Archival Print on Canvas: 40 x 56 inches $1590. Custom sizes, colors, and commissions are also available. For more information or to order, please visit our ABOUT page or call us at 561-691-1110. 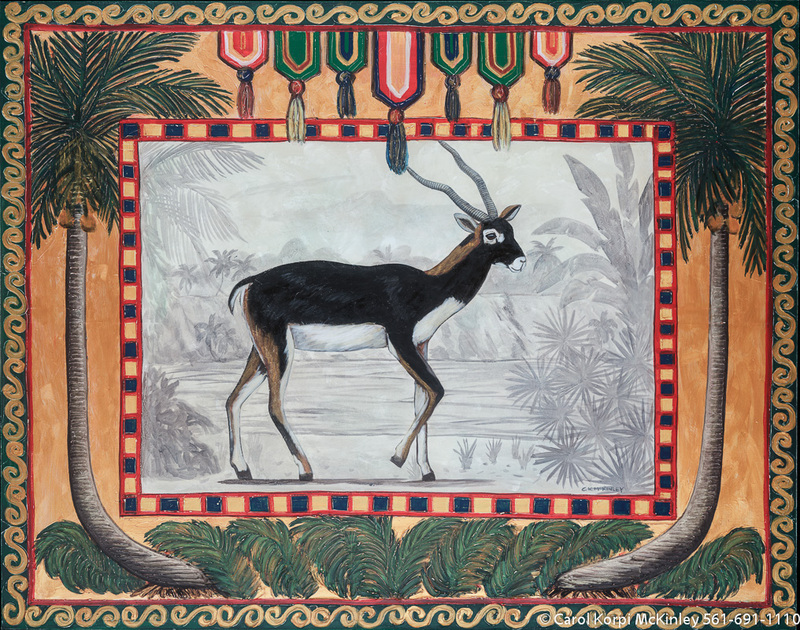 Gazelle #TAP-013, Original Acrylic on Canvas: 48 x 60 inches $5550; Stretched and Gallery Wrapped Limited Edition Archival Print on Canvas: 40 x 50 inches $1560. Custom sizes, colors, and commissions are also available. For more information or to order, please visit our ABOUT page or call us at 561-691-1110. 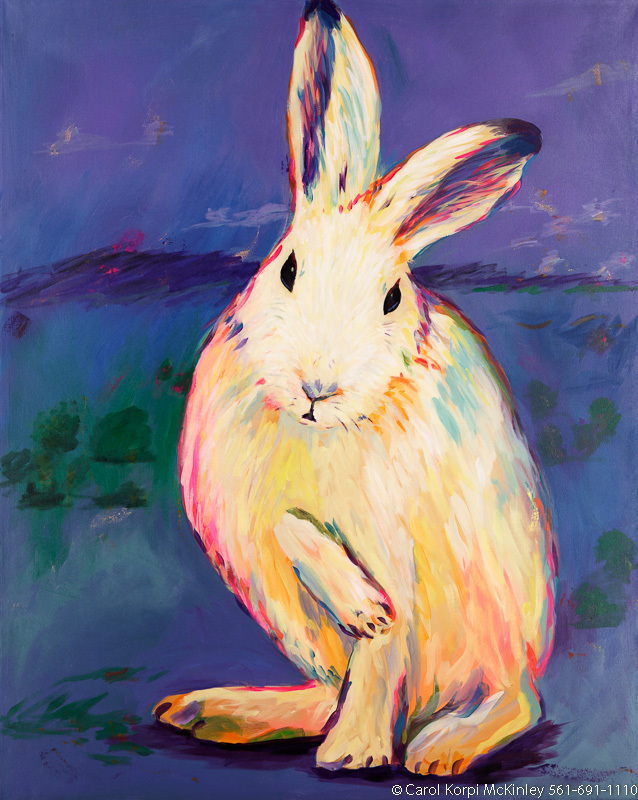 Rabbit #FAN-008, Original Acrylic on Canvas: 48 x 68 inches $2950; Stretched and Gallery Wrapped Limited Edition Archival Print on Canvas: 40 x 56 inches $1590. Custom sizes, colors, and commissions are also available. For more information or to order, please visit our ABOUT page or call us at 561-691-1110. 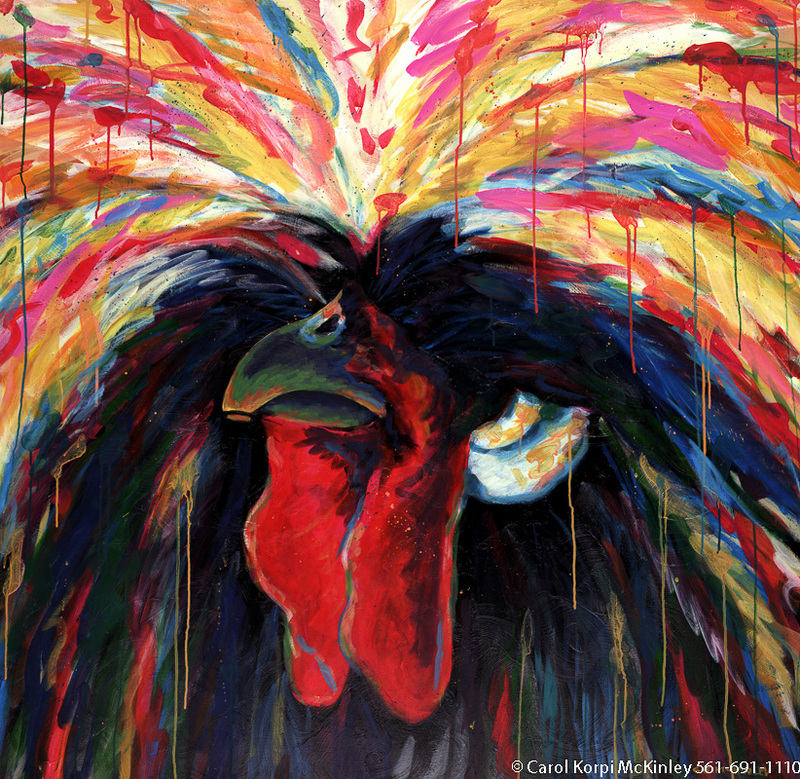 Rooster #ANF-027, Original Acrylic on Canvas: 54 x 54 inches $10200; Stretched and Gallery Wrapped Limited Edition Archival Print on Canvas: 40 x 40 inches $1500. Custom sizes, colors, and commissions are also available. For more information or to order, please visit our ABOUT page or call us at 561-691-1110. 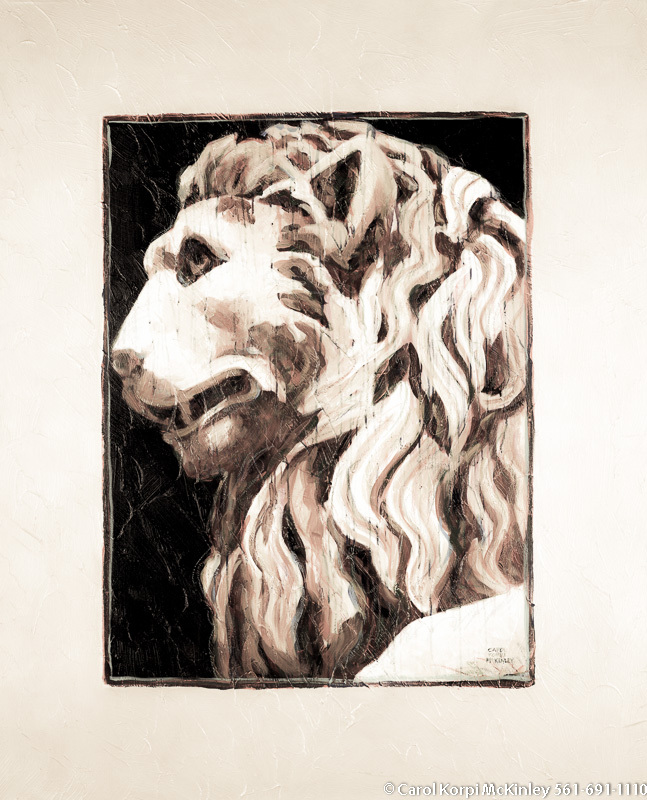 Lion of Venice #BBB-075, Original Acrylic on Canvas: 48 x 60 inches $7200; Stretched and Gallery Wrapped Limited Edition Archival Print on Canvas: 40 x 50 inches $1560. Custom sizes, colors, and commissions are also available. For more information or to order, please visit our ABOUT page or call us at 561-691-1110. 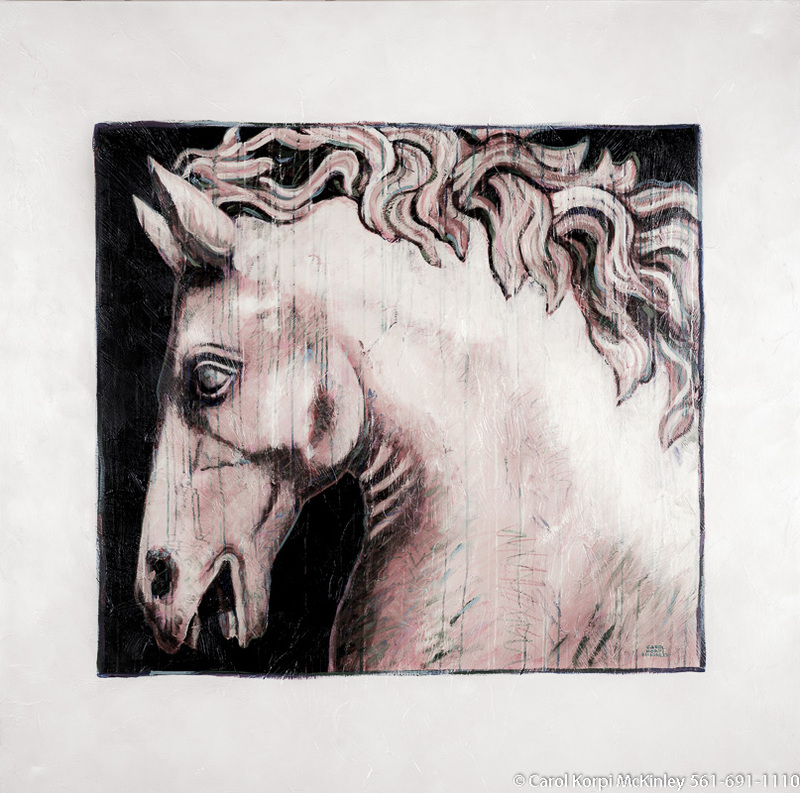 Marble Horse #BBB-022, Original Acrylic on Canvas: 65 x 65 inches $11400; Stretched and Gallery Wrapped Limited Edition Archival Print on Canvas: 40 x 40 inches $1500. Custom sizes, colors, and commissions are also available. For more information or to order, please visit our ABOUT page or call us at 561-691-1110. 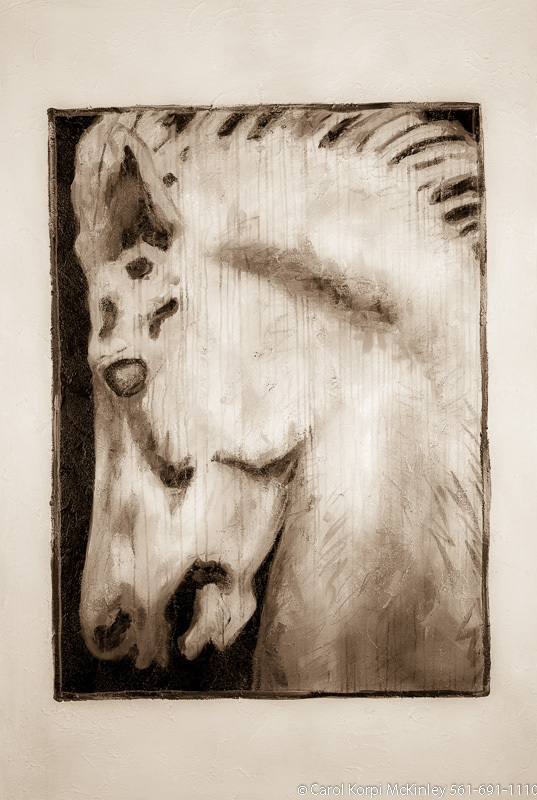 Greek Horse 2 #BBB-065, Original Acrylic on Canvas: 48 x 68 inches $7800; Stretched and Gallery Wrapped Limited Edition Archival Print on Canvas: 40 x 56 inches $1590. Custom sizes, colors, and commissions are also available. For more information or to order, please visit our ABOUT page or call us at 561-691-1110. 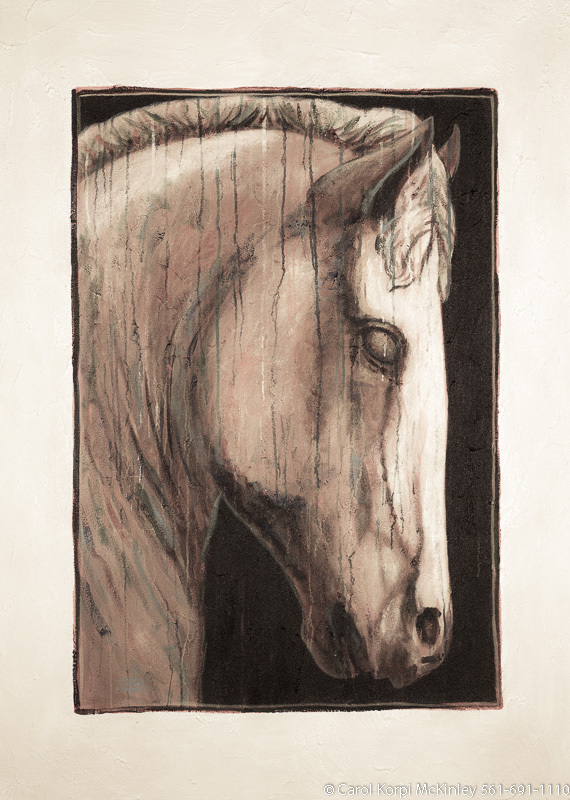 Greek Horse 3 #BBB-076, Original Acrylic on Canvas: 48 x 72 inches $7800; Stretched and Gallery Wrapped Limited Edition Archival Print on Canvas: 40 x 60 inches $1590. Custom sizes, colors, and commissions are also available. For more information or to order, please visit our ABOUT page or call us at 561-691-1110. 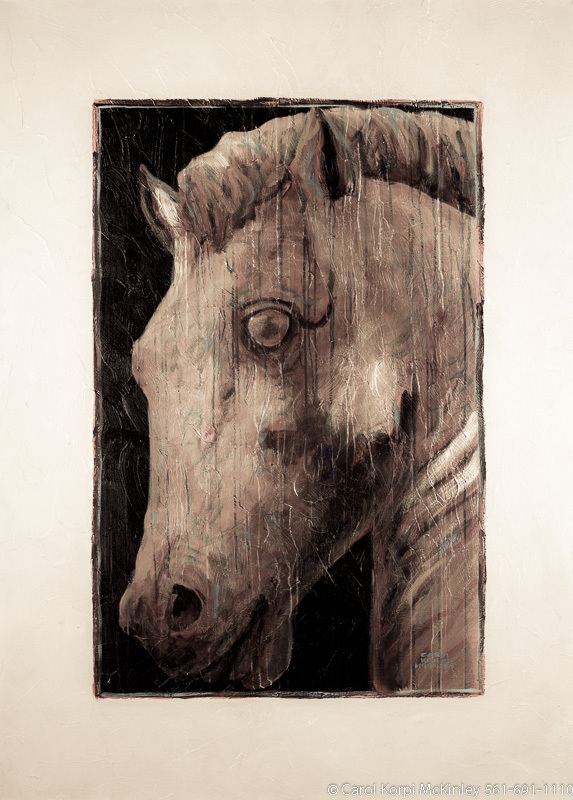 Greek Horse 1 #BBB-064, Original Acrylic on Canvas: 48 x 68 inches $7800; Stretched and Gallery Wrapped Limited Edition Archival Print on Canvas: 40 x 56 inches $1590. Custom sizes, colors, and commissions are also available. For more information or to order, please visit our ABOUT page or call us at 561-691-1110. 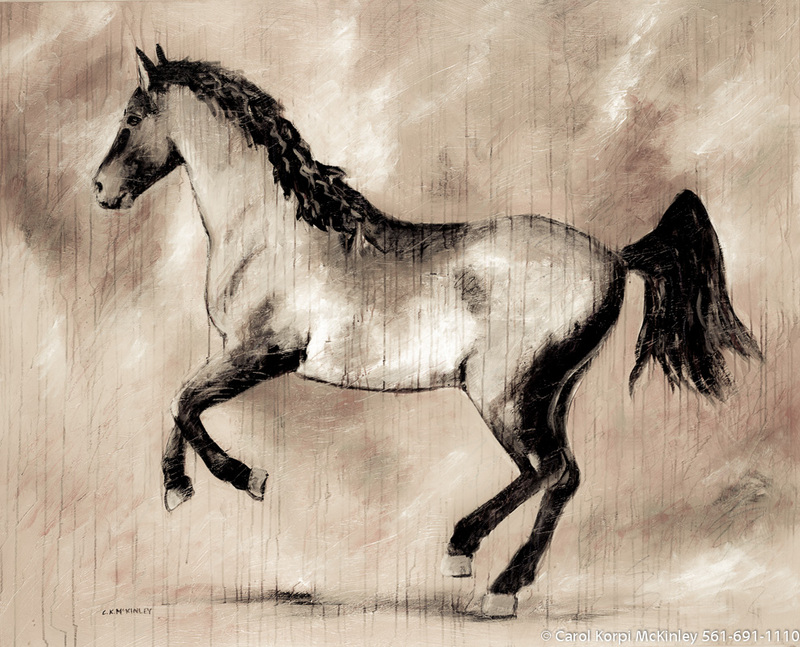 Horse #BBB-092, Original Acrylic on Canvas: 48 x 60 inches, Sold; Stretched and Gallery Wrapped Limited Edition Archival Print on Canvas: 40 x 50 inches $1560-. Custom sizes, colors, and commissions are also available. For more information or to order, please visit our ABOUT page or call us at 561-691-1110. 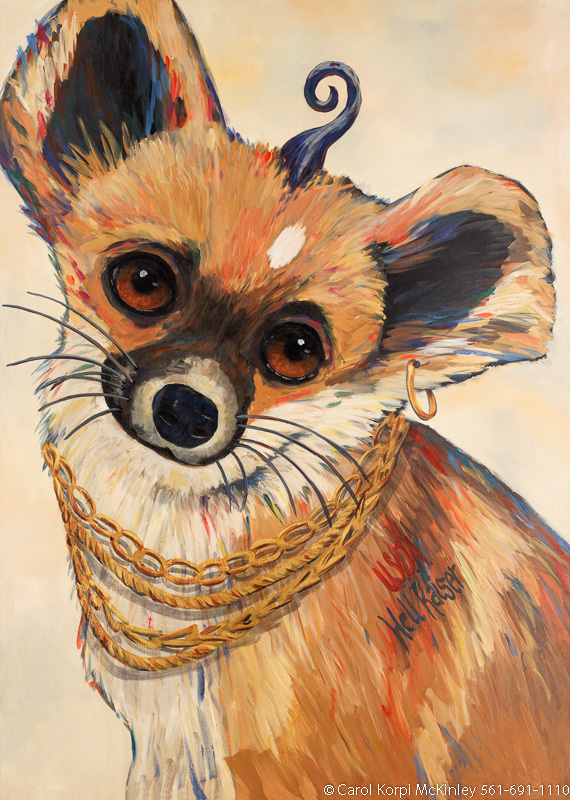 Dog #ANF-068, Original Acrylic on Canvas: 36 x 48 inches $3600; Stretched and Gallery Wrapped Limited Edition Archival Print on Canvas: 40 x 56 inches $1590. Custom sizes, colors, and commissions are also available. For more information or to order, please visit our ABOUT page or call us at 561-691-1110.